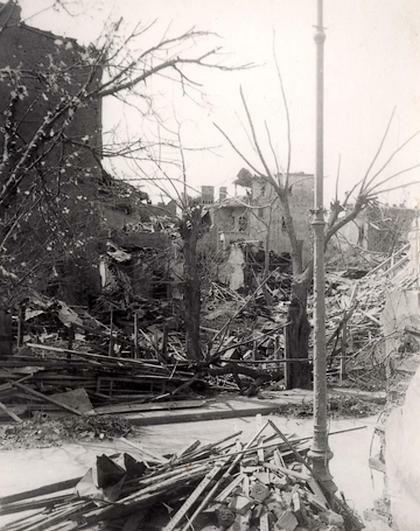 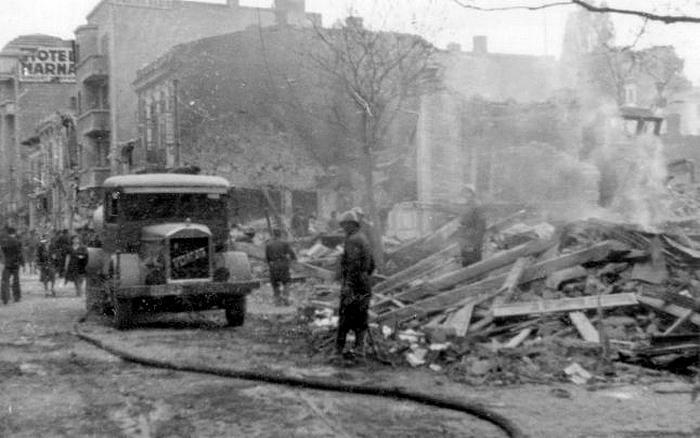 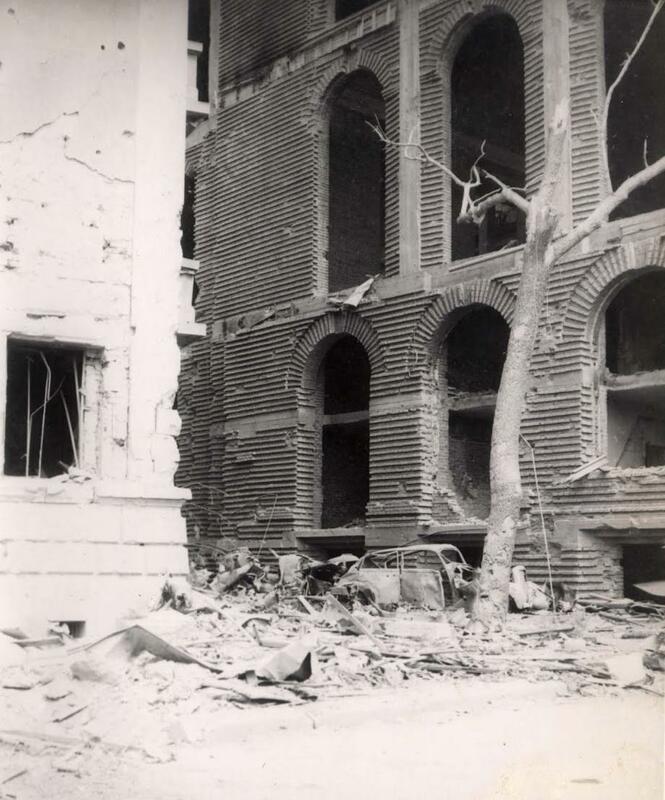 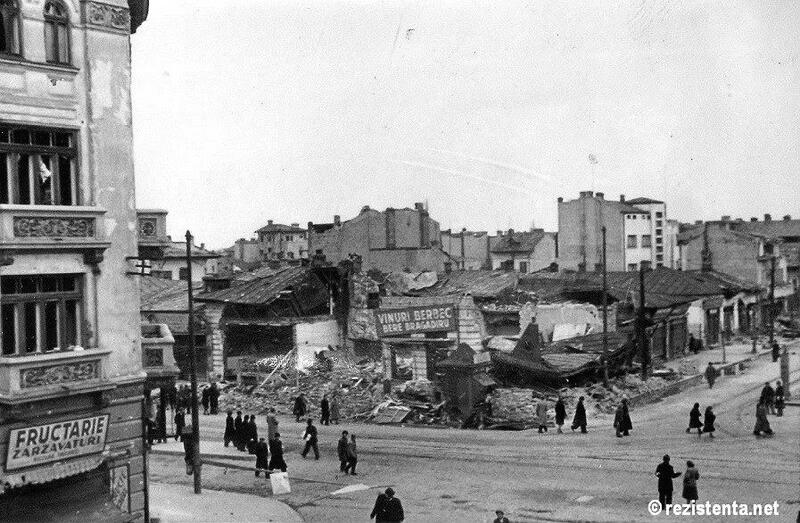 April-May 1944 – British American bombardments in Bucharest – 5.524 dead, 3.373 wounded, 47.974 left without homes(source). 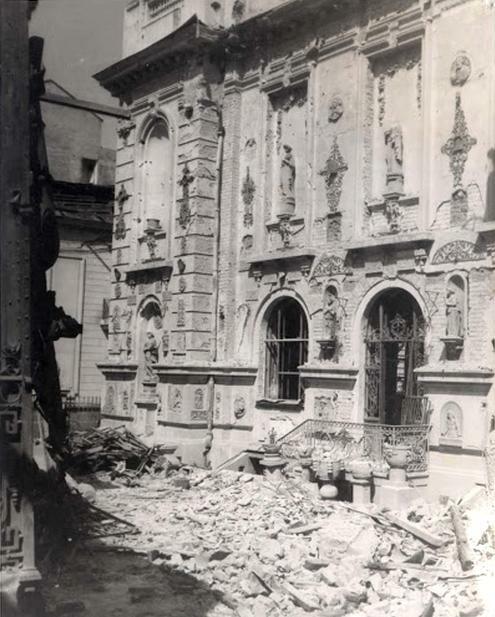 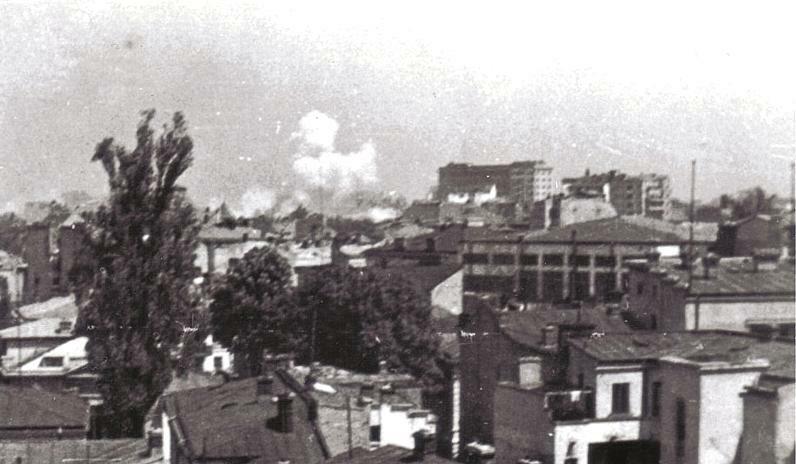 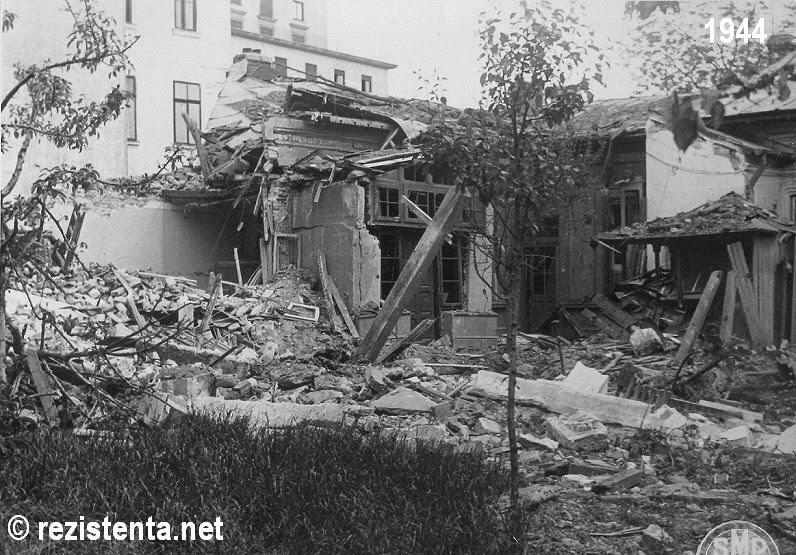 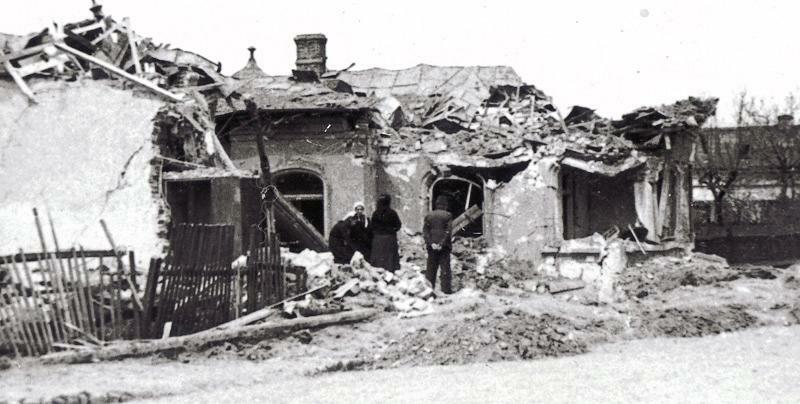 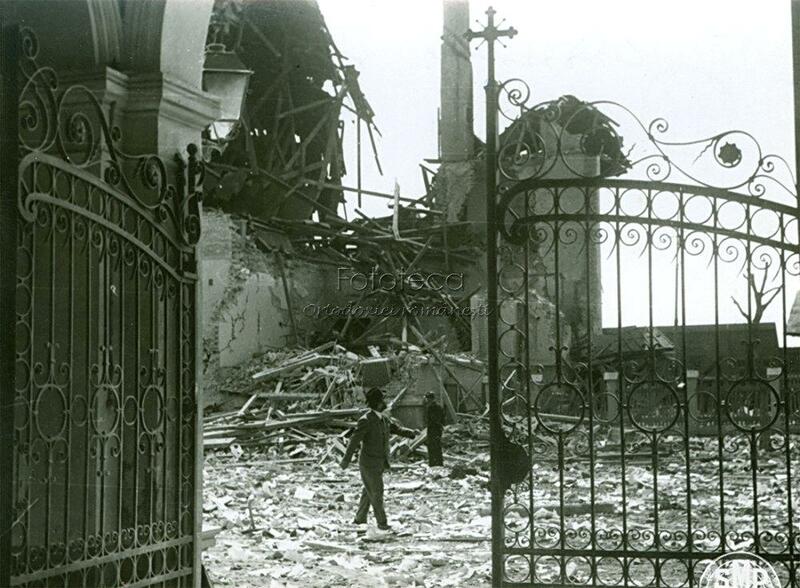 23-27 August 1944 – Nazi bombardments in Bucharest – 85 dead, 90 wounded, 69 houses destroyed (source). 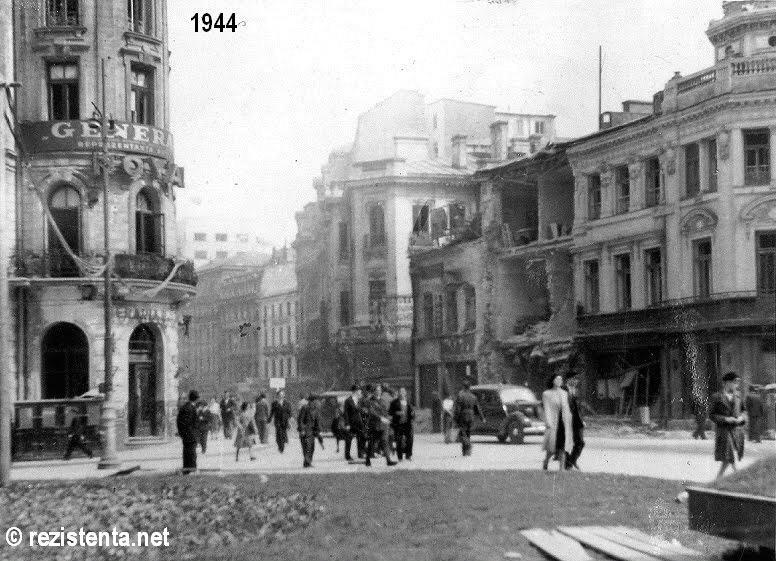 In April-May 1944, Bucharest was heavily bombarded by Allied planes (british and american). 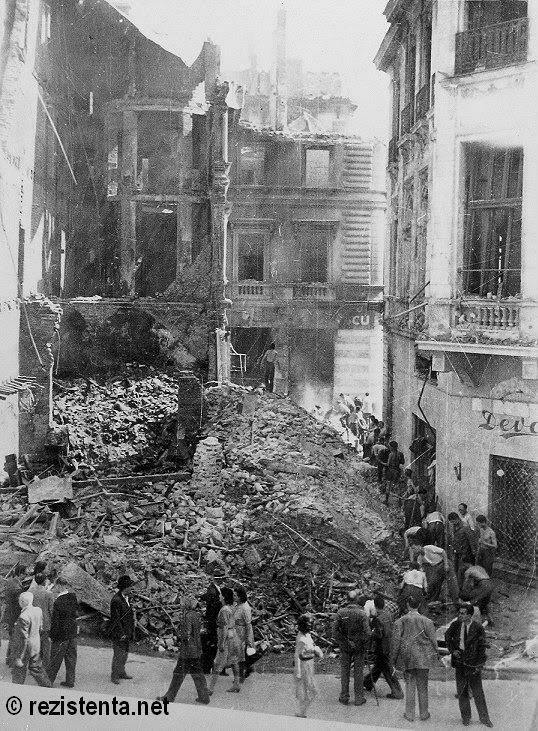 Other cities were bombarded until July. 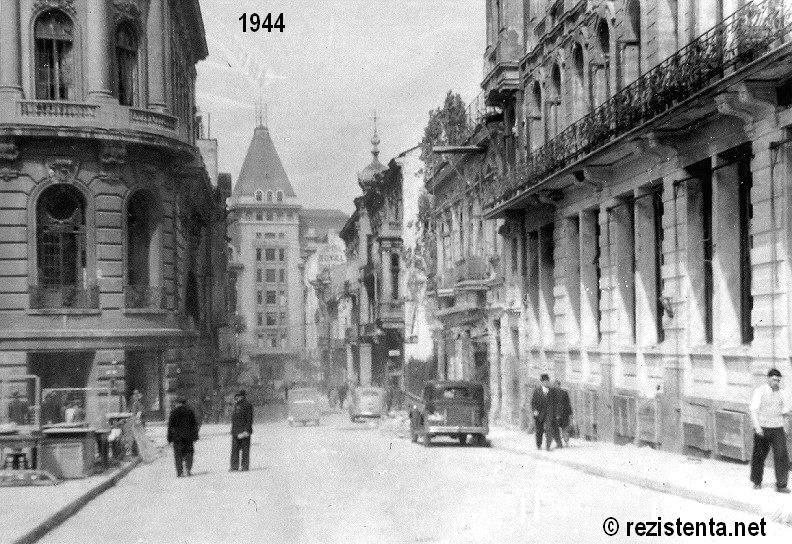 At the time, Romania was a Nazi ally and its main supplier of oil and cereals. 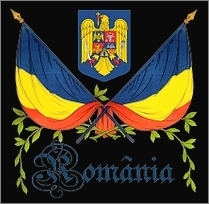 The purpose of the German-Romanian alliance was the liberation of Soviet occupied territories and to stop the communist threat to Romania and Europe. 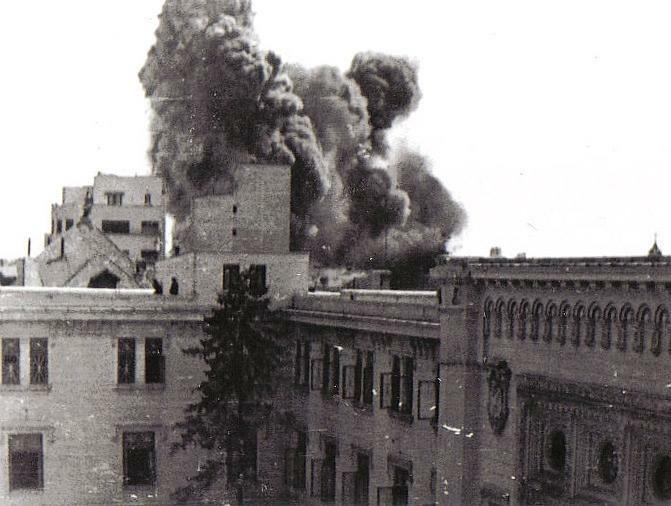 Unknown at the time was that the Ribbentrop-Molotov pact signed by Hitler himself had allowed Soviet invasion of Romanian territories (and others) in 1939 (read more about the 1940 Soviet occupation of Romanian territories). 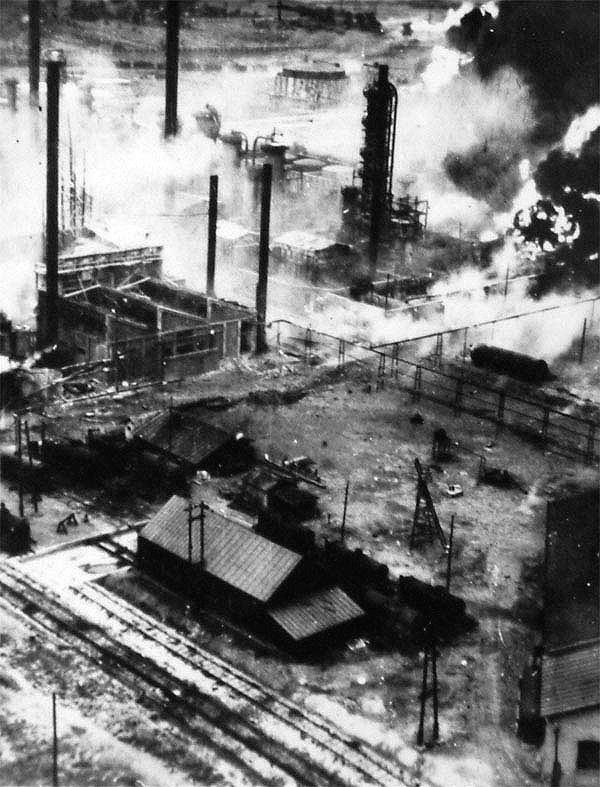 The bombardments targeted Ploiesti oil fields, Brasov factories, Turnu Severin port and train station. 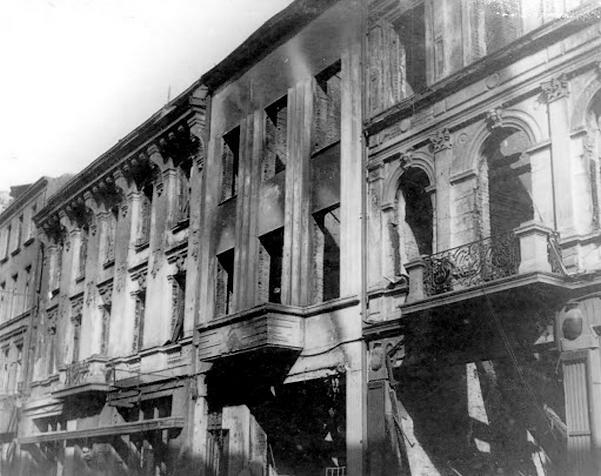 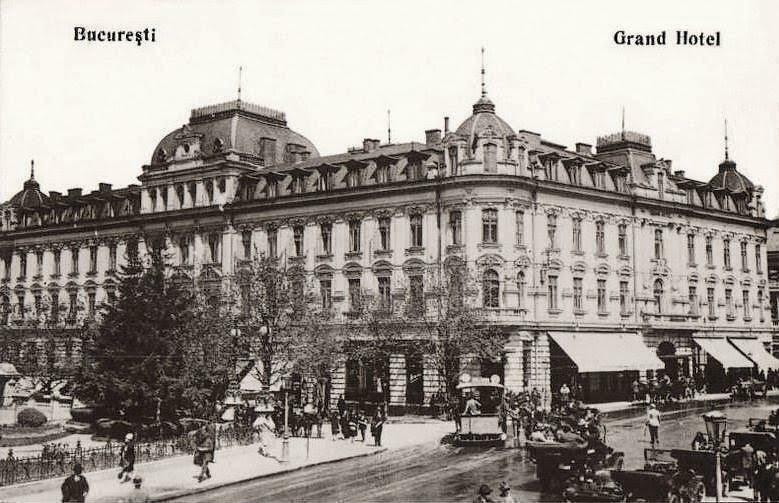 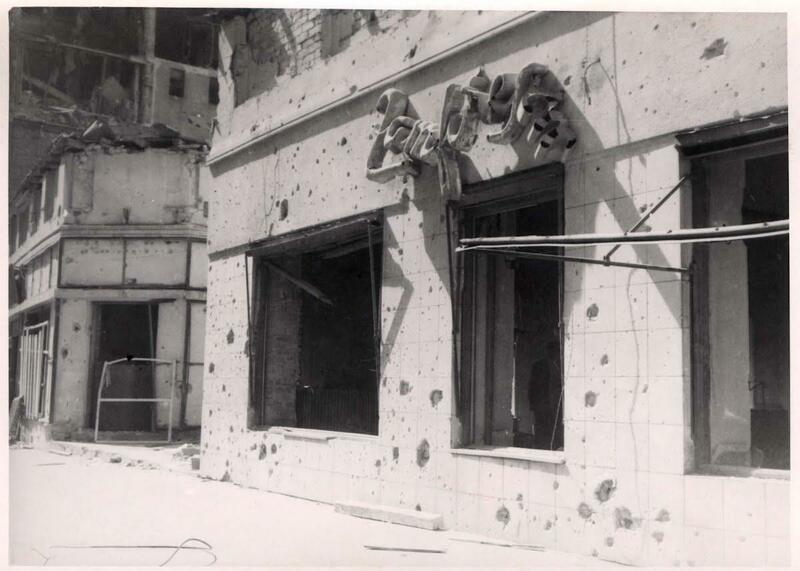 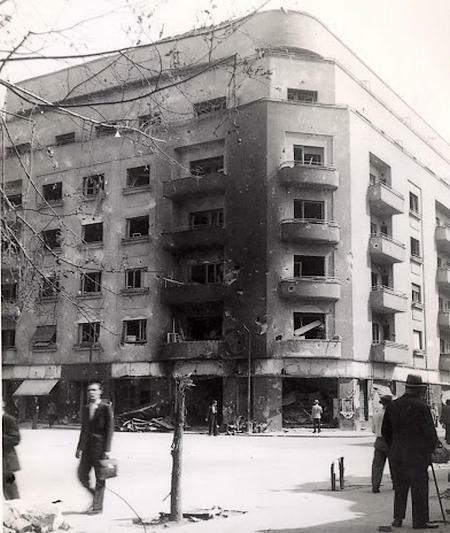 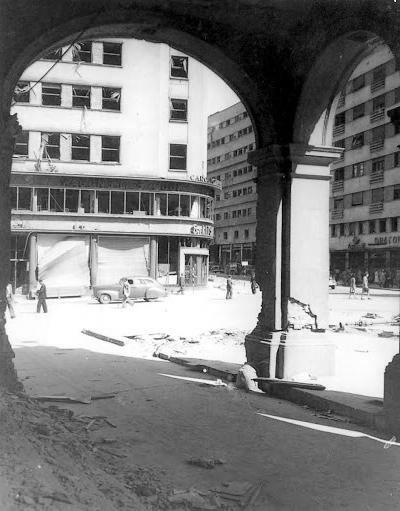 The capital city Bucharest and the cities of Pitesti and Craiova were also bombarded, despite the fact that they didnt represent military or economic targets, and as “open cities”, were not suppose to be attacked. 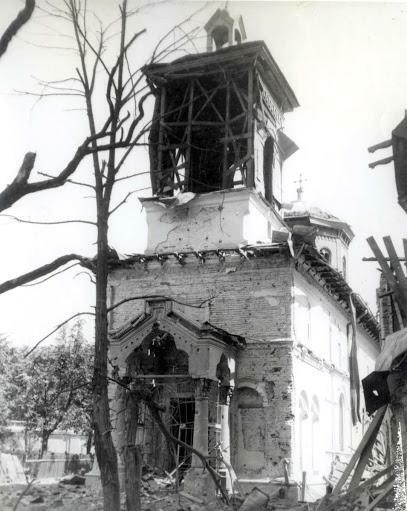 Previous attacks had taken place against Romanian oil fields, however the results were modest, as Romanian fighter planes took down enemy planes – and more than anything, civilians had not been targeted. 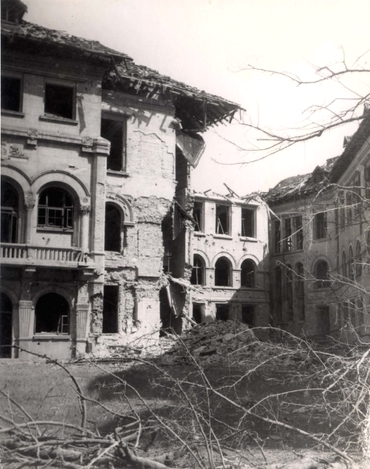 The first April attacks were handled well by Romanian fighter planes IAR-80/81 and by German planes, who took down dozens of enemy planes. 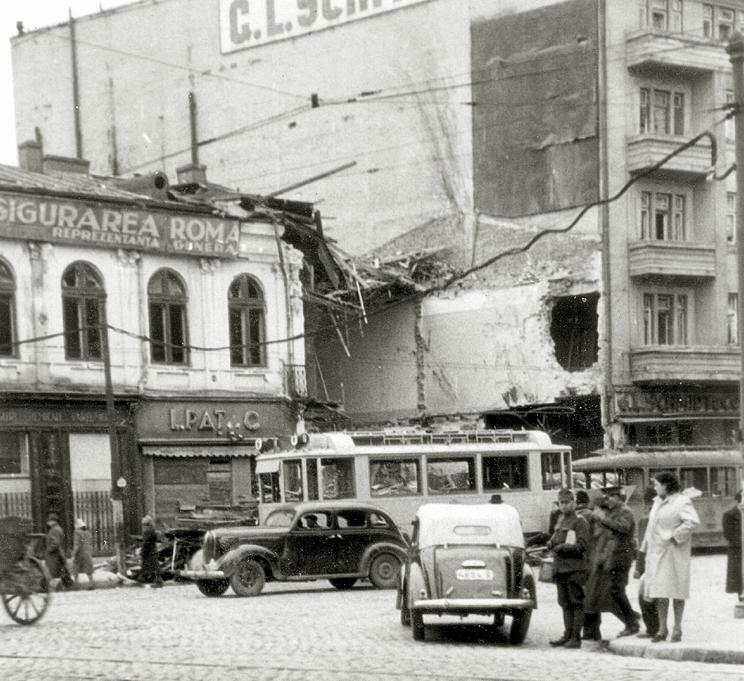 However, the assaults were unexpected since Bucharest was an open city, the attacks were overwhelming and the planes were insufficient. 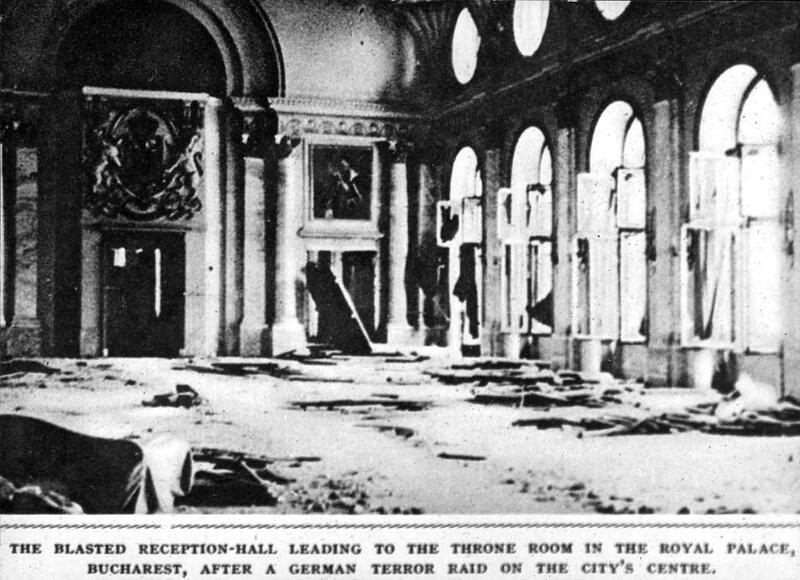 The calls for additional military supplies remained unanswered. 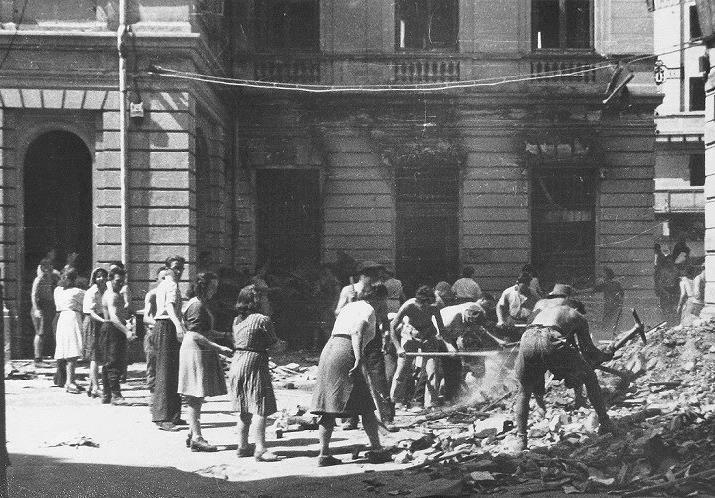 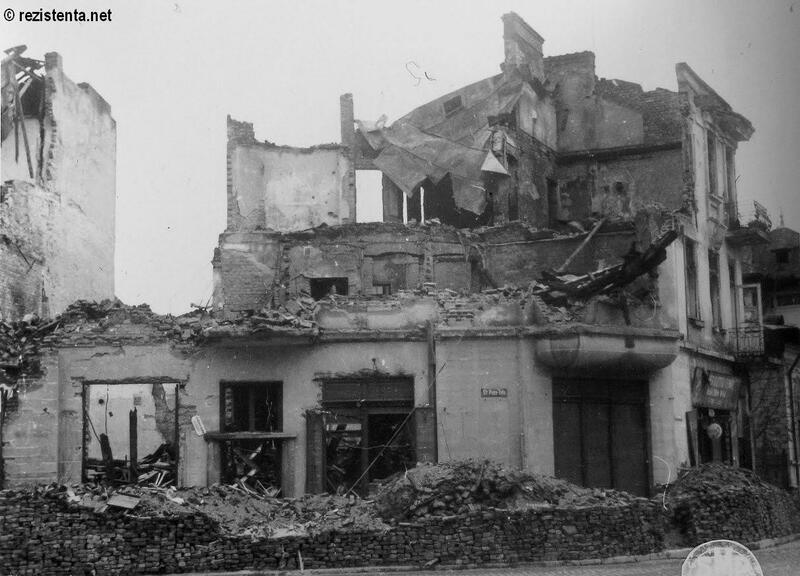 The attacks continued throughout the country until July 1944. 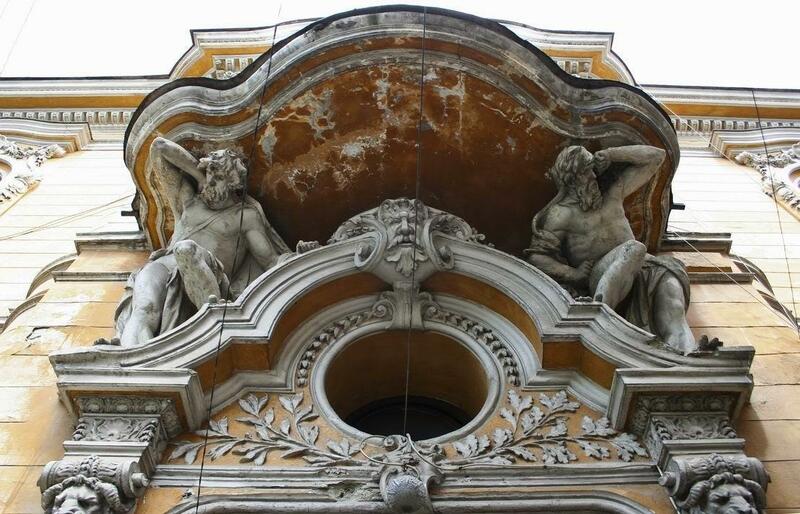 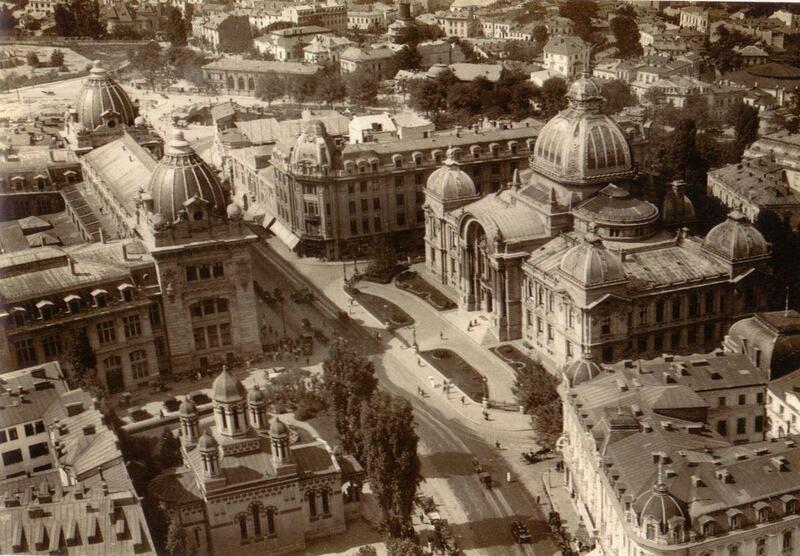 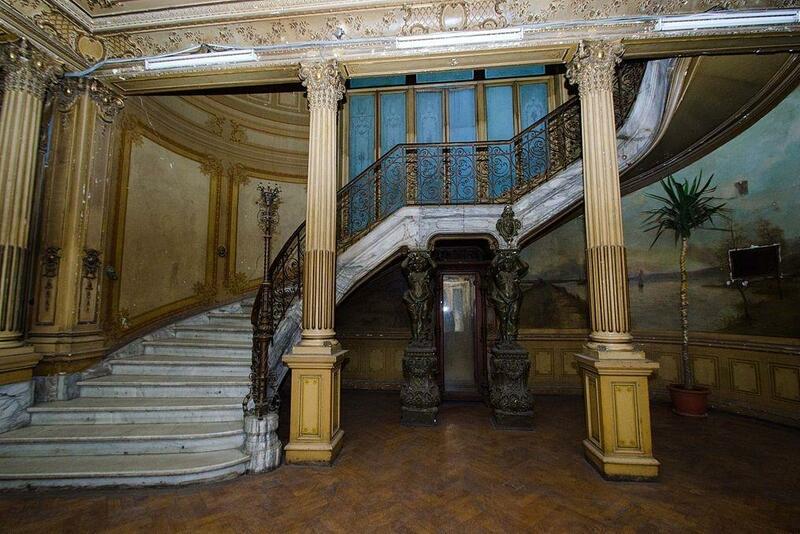 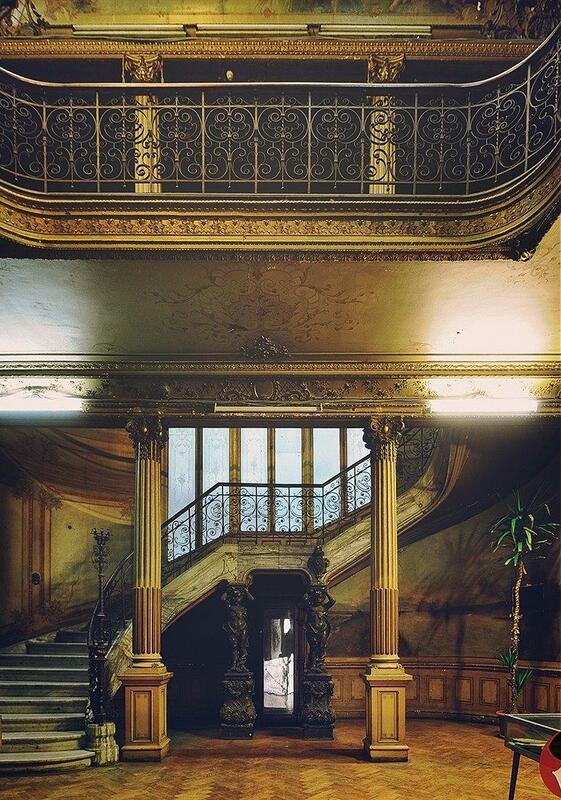 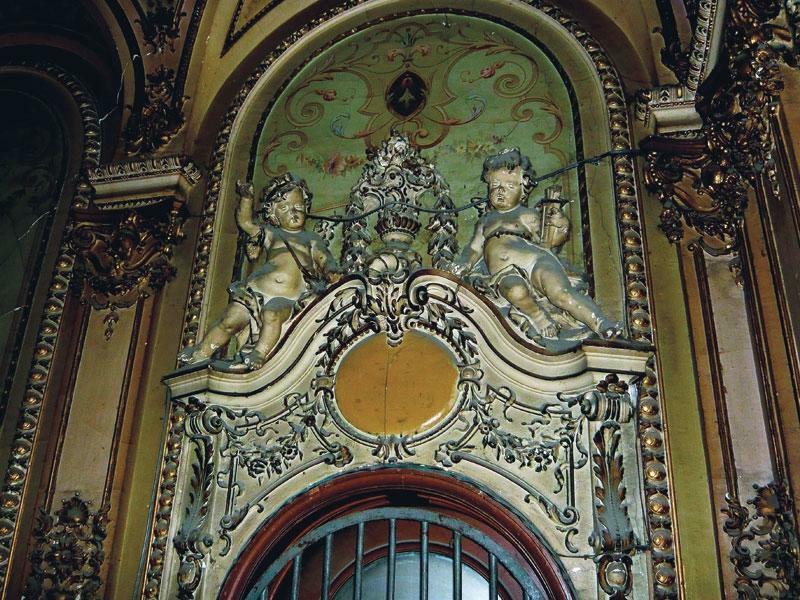 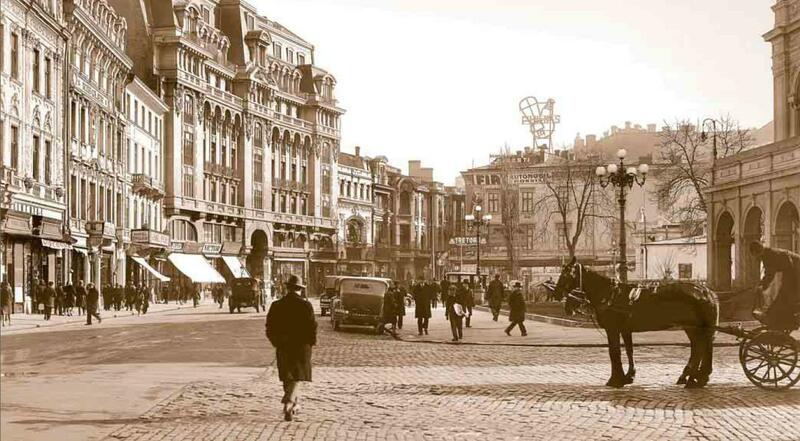 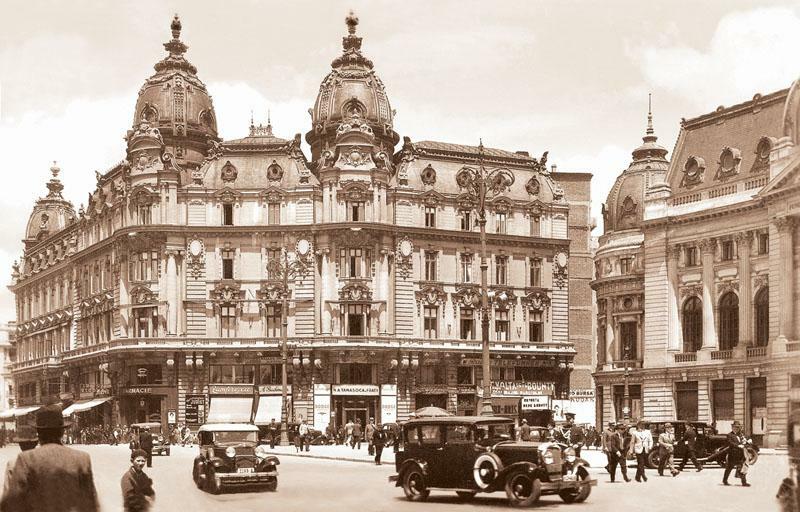 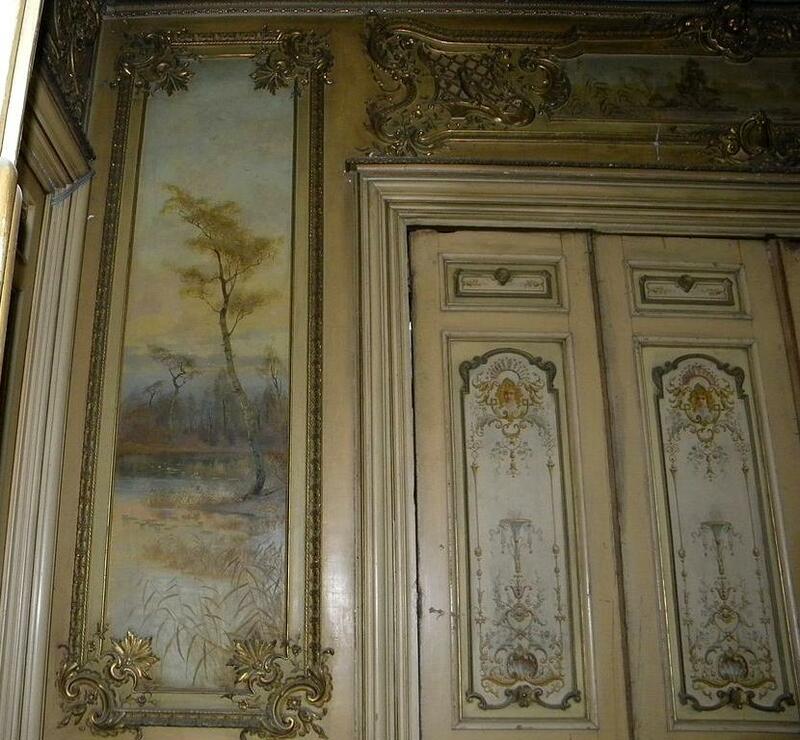 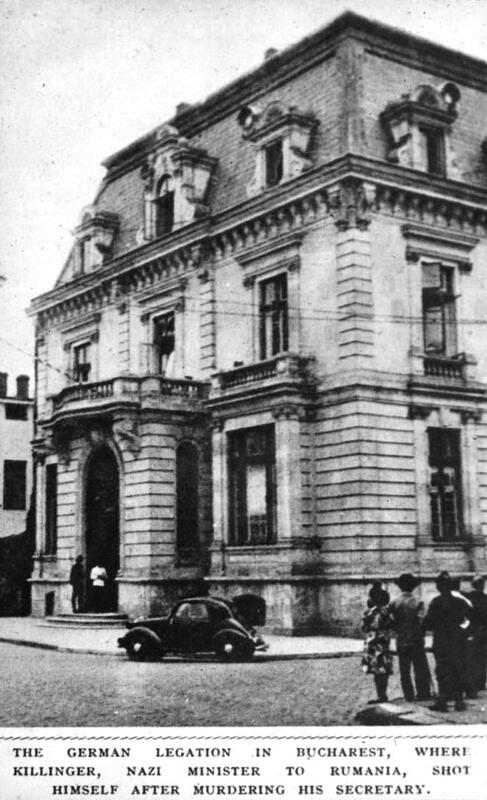 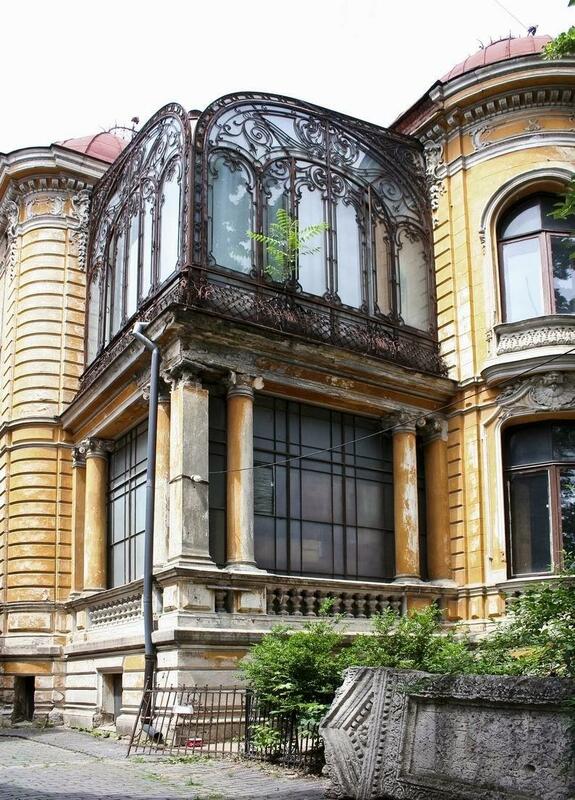 Bucharest represented an “open city”, situated 300 km from the war front, with no military targets. 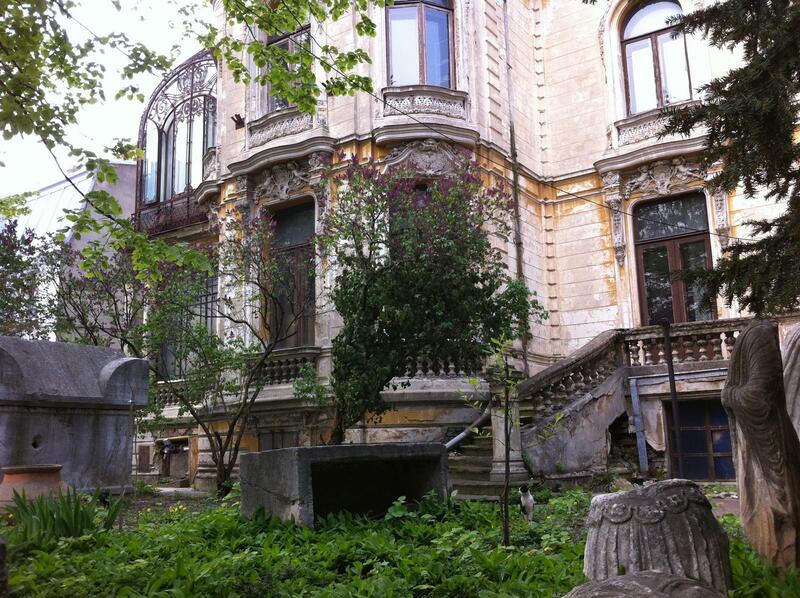 It was attacked repeatedly from April throughout May. 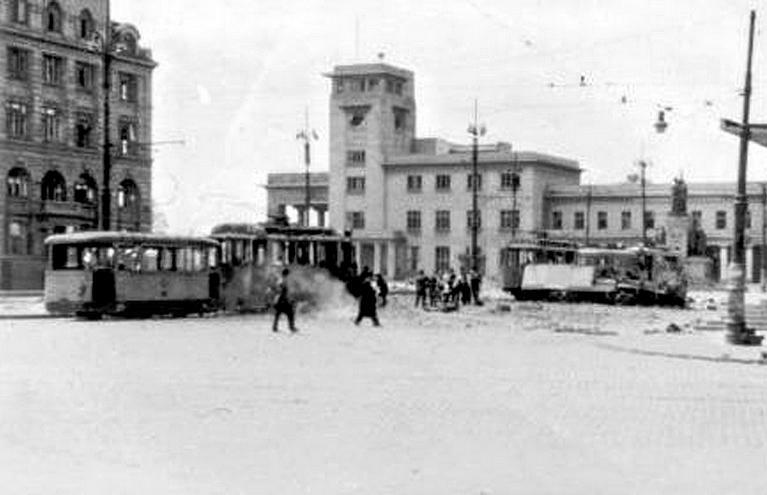 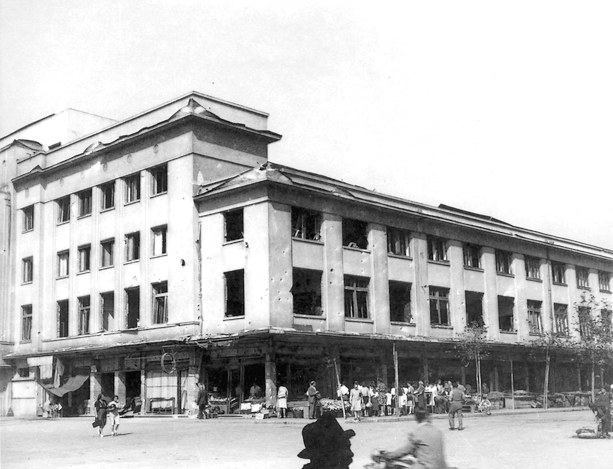 The official justification was the attack on Gara de Nord Station to prevent military transports to the front in eastern Romania (Iasi) where the Soviet army was advancing. 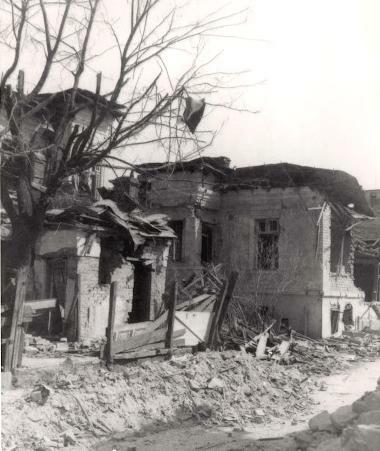 However, the fighting had stopped in March and the only thing the train station was filed with were refugees from Soviet-occupied Moldova (read about the plight of Romanians in Soviet-occupied territories). 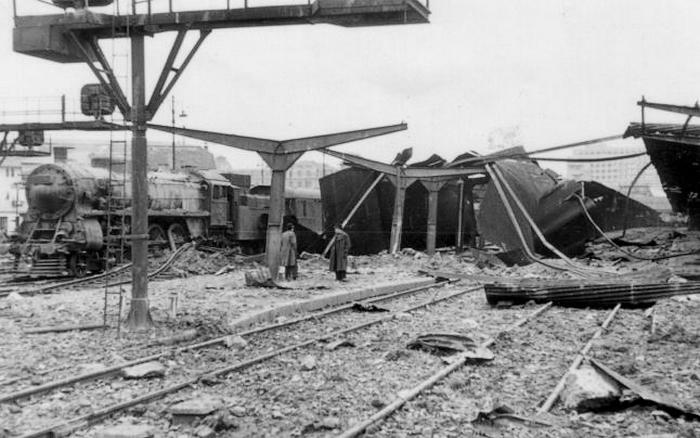 The train station was obliterated under carpet bombing and the refugees were all killed. 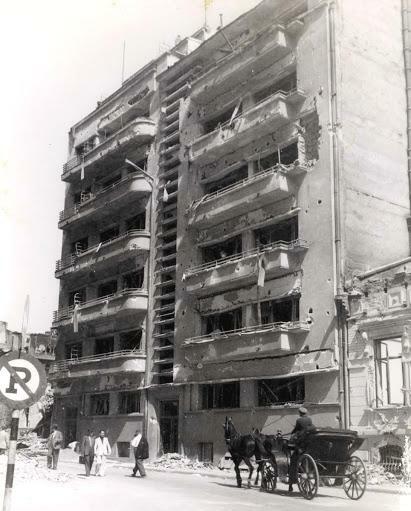 The following attacks didnt include any military targets and were simply a terror campaign against civilians. 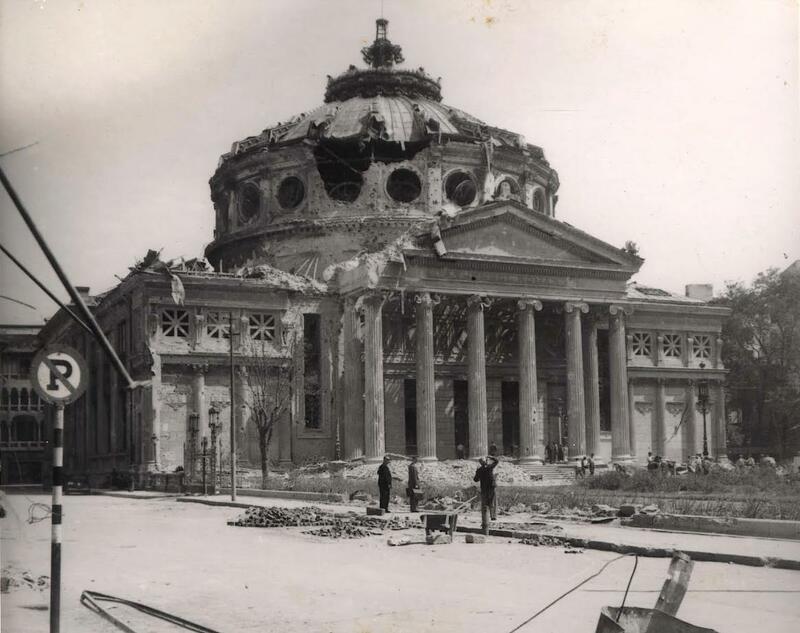 As the attacks were unexpected and most of the medical personnel was on the war front in eastern Romania, the dead and wounded of Bucharest were left vulnerable, with insufficient medical assistance and with water and energy supplies cut off for days. 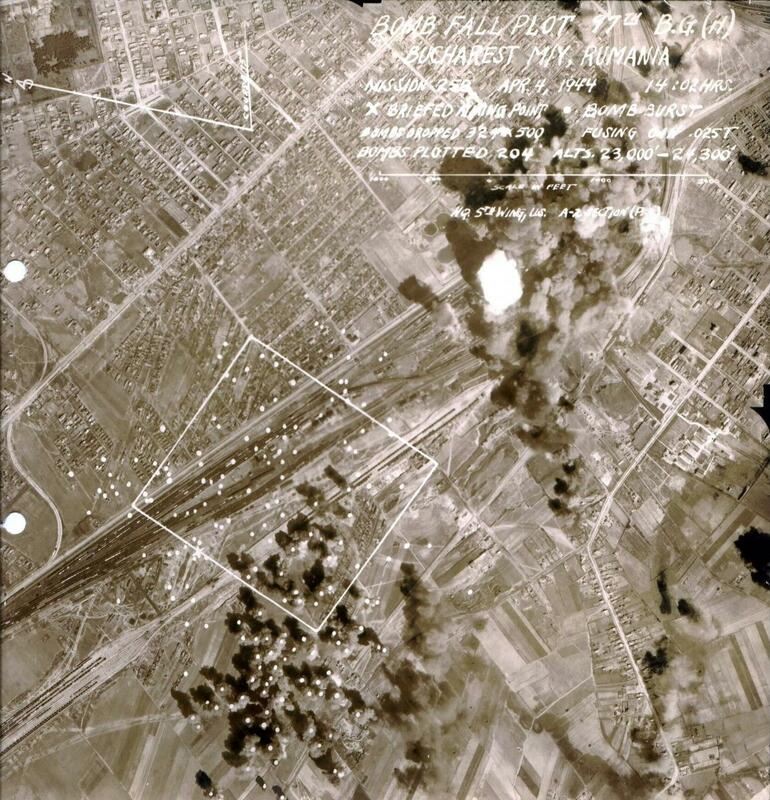 The victims, many of whom were impossible to identify, were buried in a new cemetery named “4 aprilie” cemetery (the day of the first attack) near Calvin cemetery. 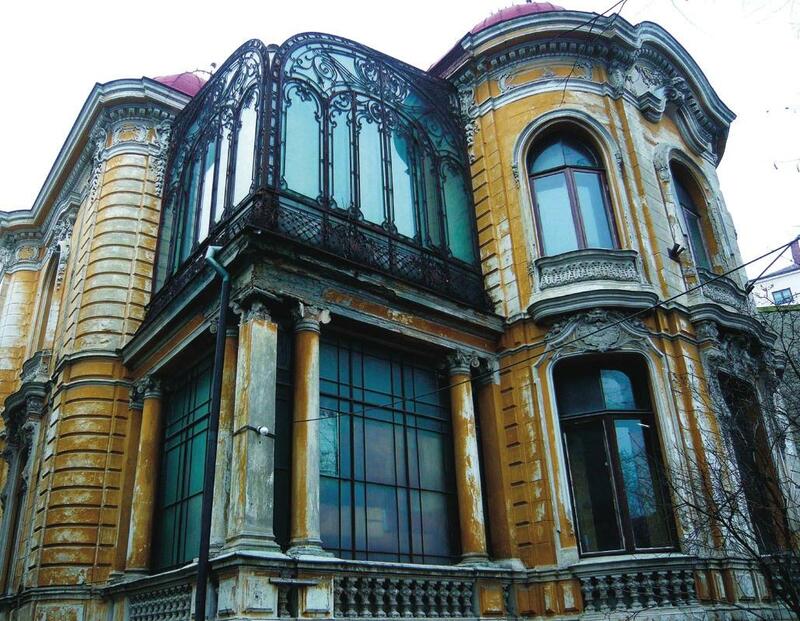 Boy in Bucharest. 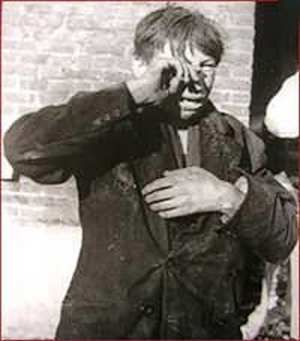 From those who found refuge underground, many often suffocated, as oxygen was pulled from the air to feed the blaze above them. 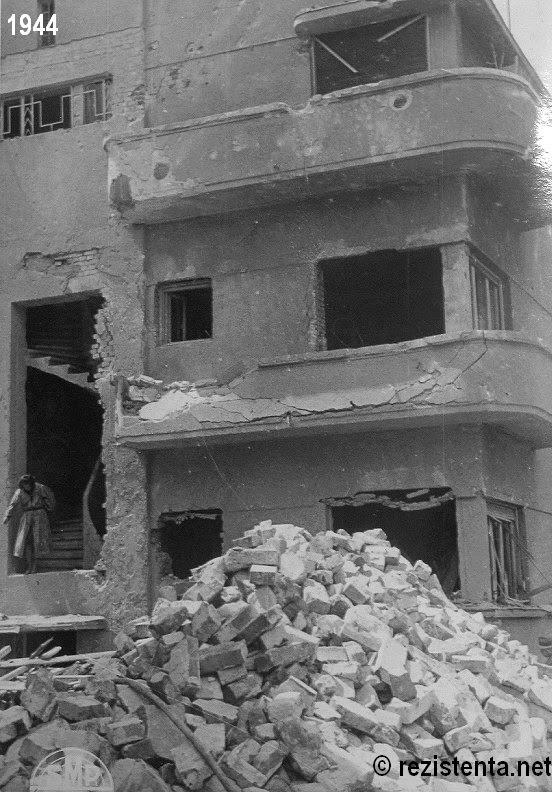 The aerial attacks specifically targeted civilian residences throughout every single city, the official purpose being “the demoralization of the civilian population”. 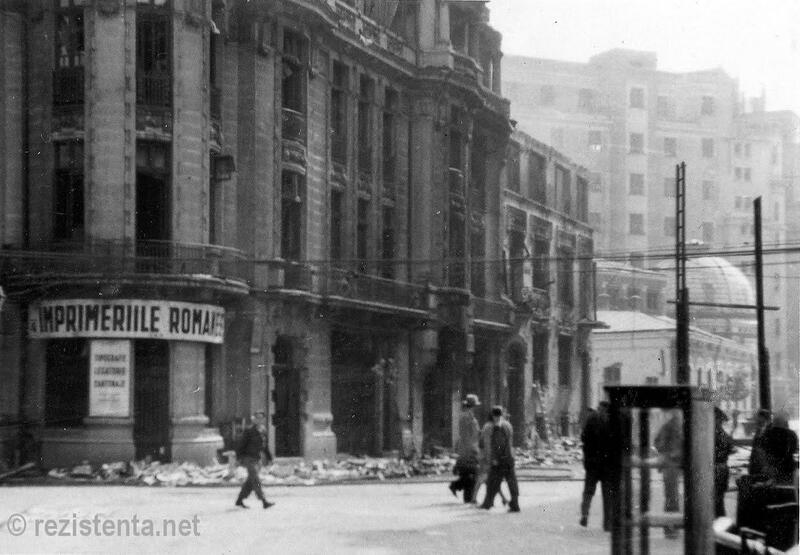 The acts not only demoralized but terrorized the population, Bucharest being subjected to 15 attacks in a month. 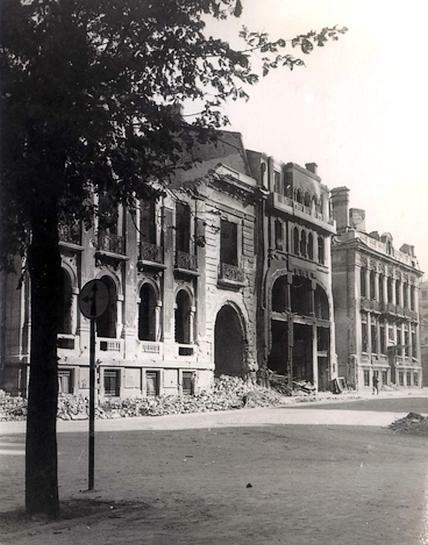 Such acts from the Allies against civilians were common during WW2, such as the Dresden bombing – german city filled with civilians and refugees, who died in a massive firestorm (fire tornado) caused by 3.500 tons of incendiary bombs. 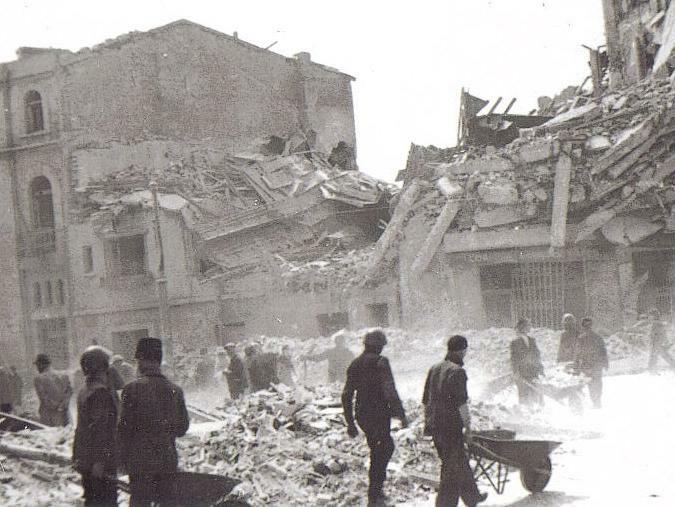 Or the bombing of Rome, Italy which used 60.000 tons of bombs on mostly civilian targets. 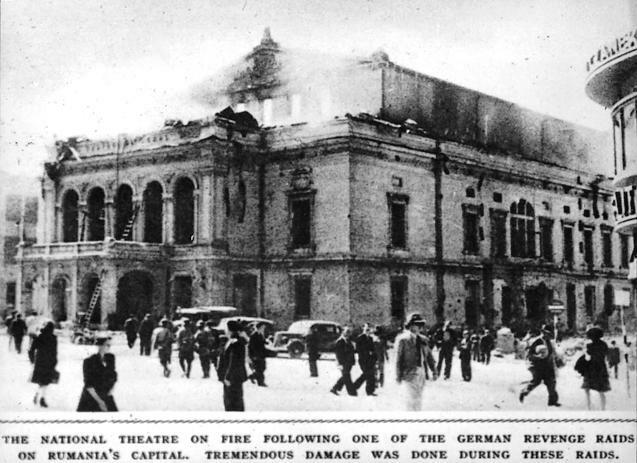 The acts of “demoralization” were meant to terrorize the population to such extent that they would accept any terms to end the ongoing assault; this happened in August same year (read more below). 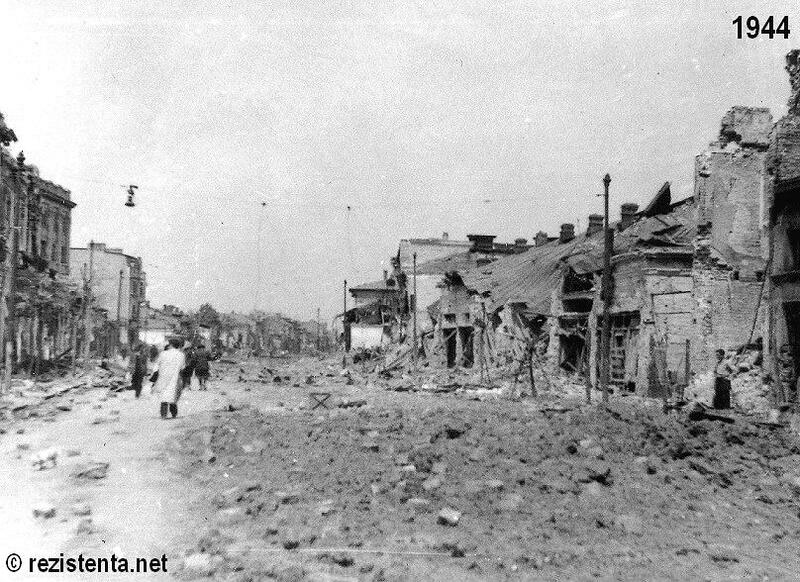 A major complaint from both Romanian authorities and the local Nazi commanders was the lack of sufficient military support from Hitler towards the end. 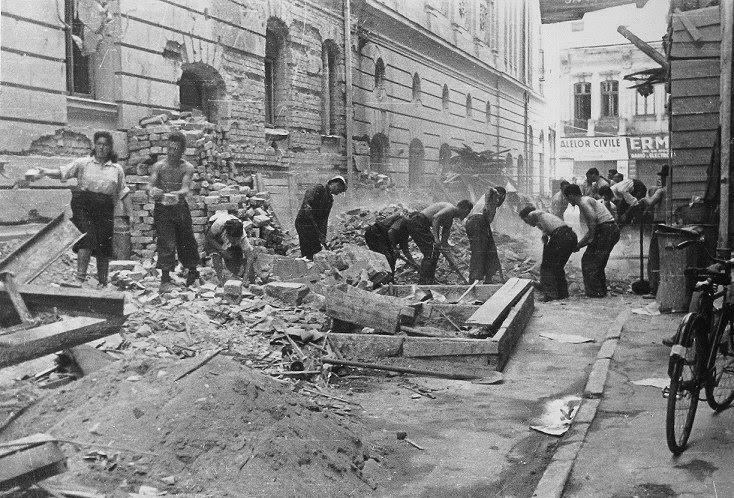 Suffocated by assaults from both the east and west, Hitler developed irrational plans that lead to uneven concentration of forces. 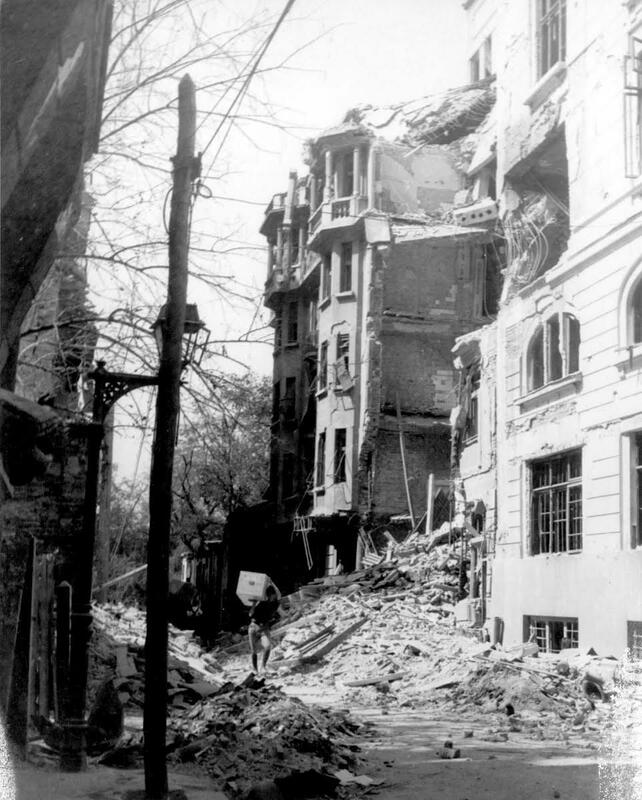 Though the first aerial attacks were handled well by Romanian-German planes who took down dozens of enemy planes, the assaults had been unexpected and the planes were insufficient. 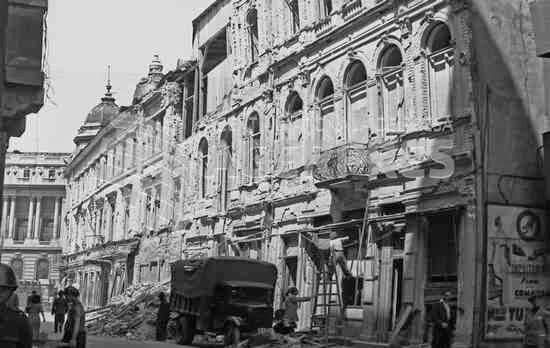 Iasi in eastern Romania (Moldova) was again assaulted in August by the Soviets in what was a coordinated plan to overtake Romania. 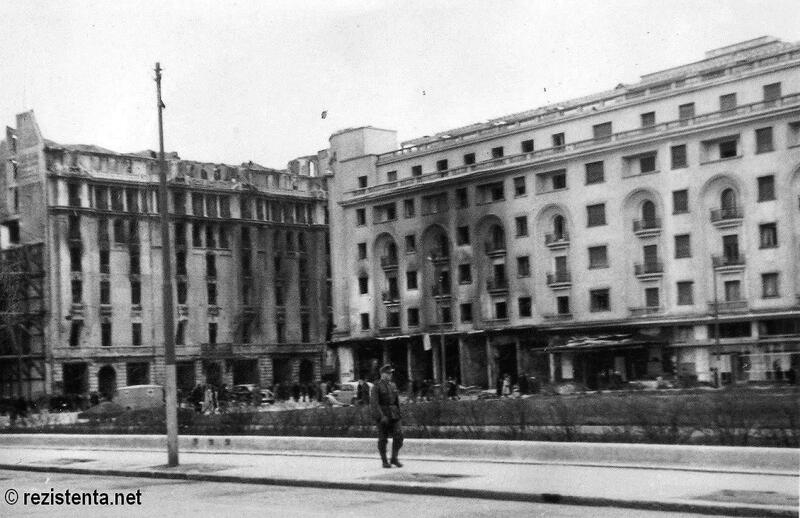 The Palace of Culture in the background. 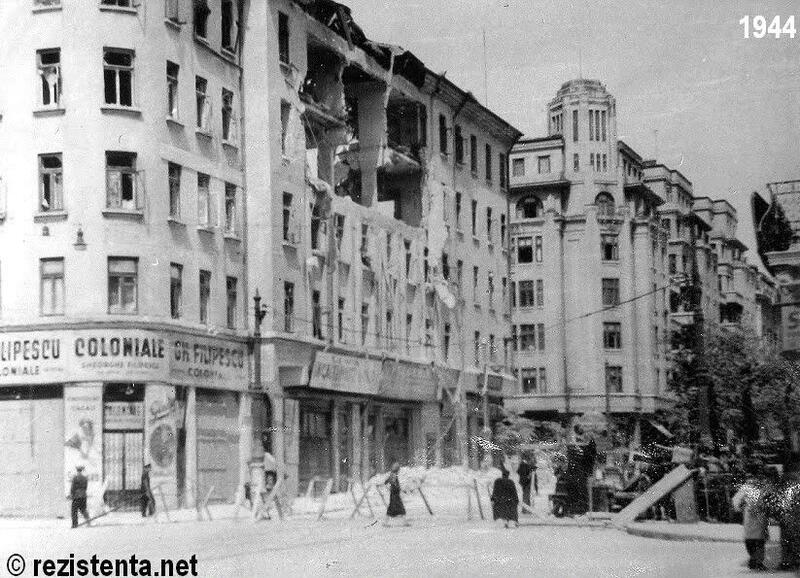 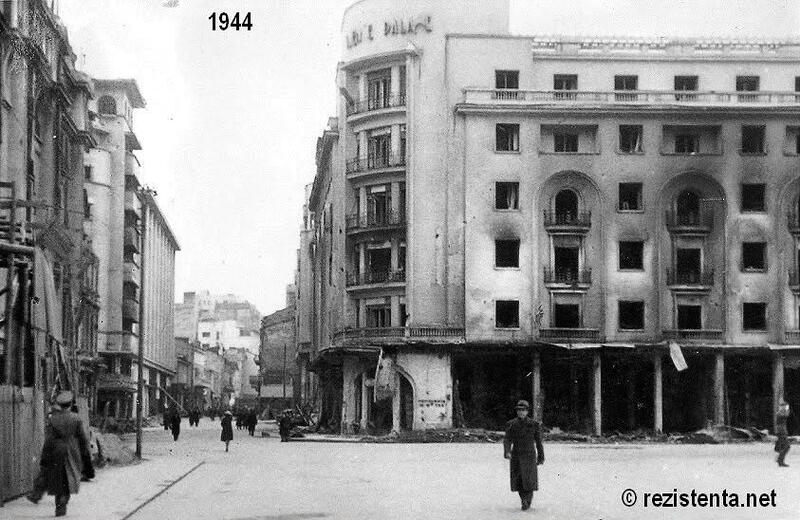 The major city of Iasi from eastern Romania was bombarded in August and eventually taken over by Soviets on August 22, 1944, and on August 23 the coup d’etat took place, planned by King Michael with the help of the Communists and the Allies. 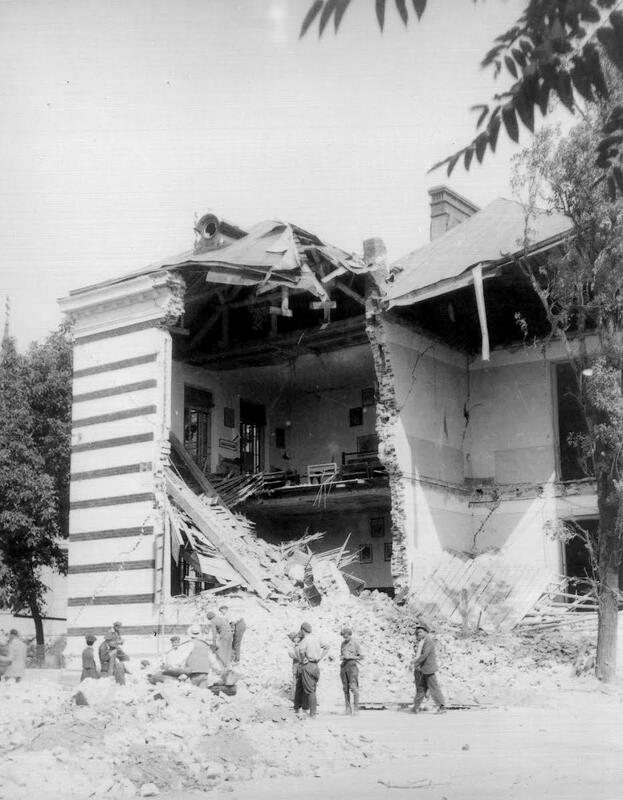 They were all part of a coordinated planned assault. 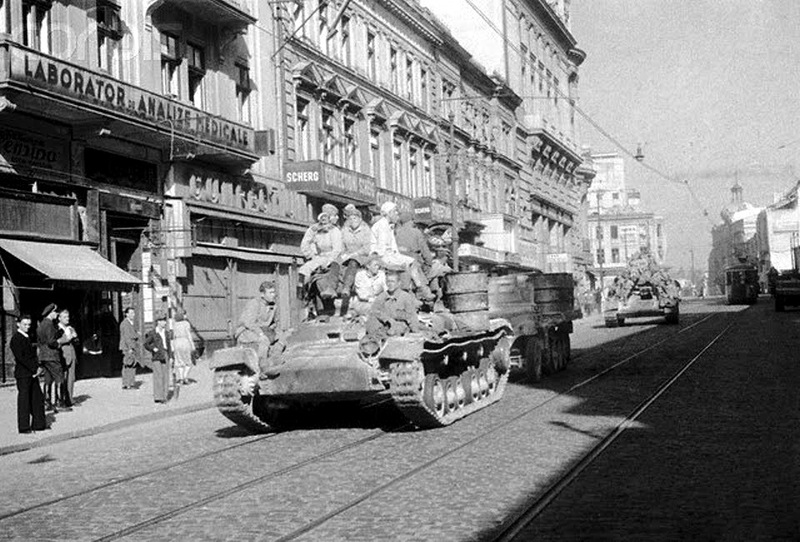 Soviet tanks occupy Bucharest in august 1944. 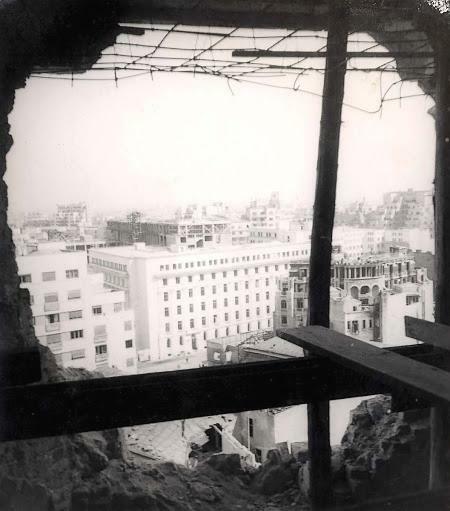 The occupation was to last for more than a decade. 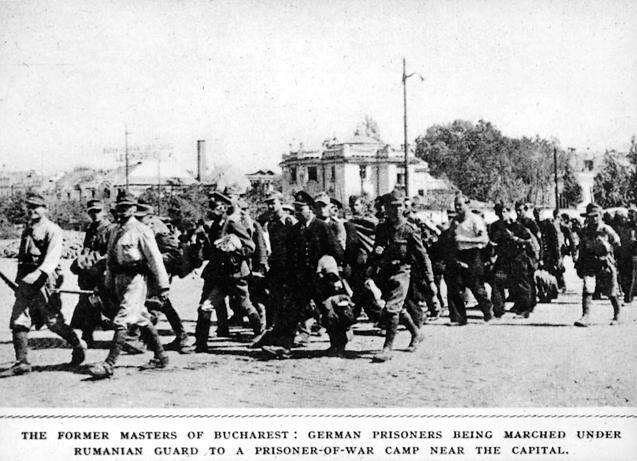 Germans surrendering in August. 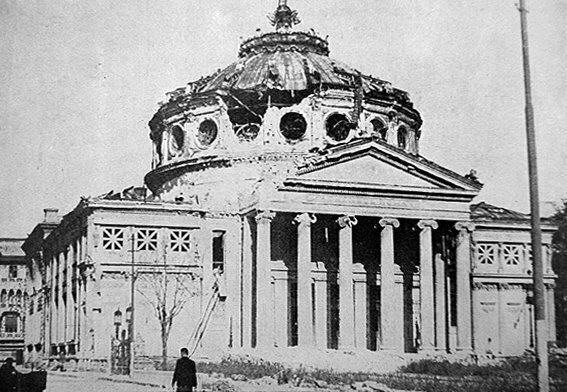 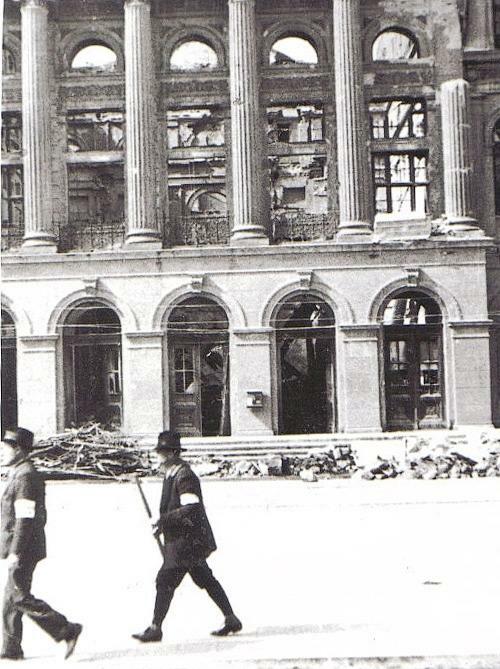 In the background is the damaged Romanian Athenaeum. 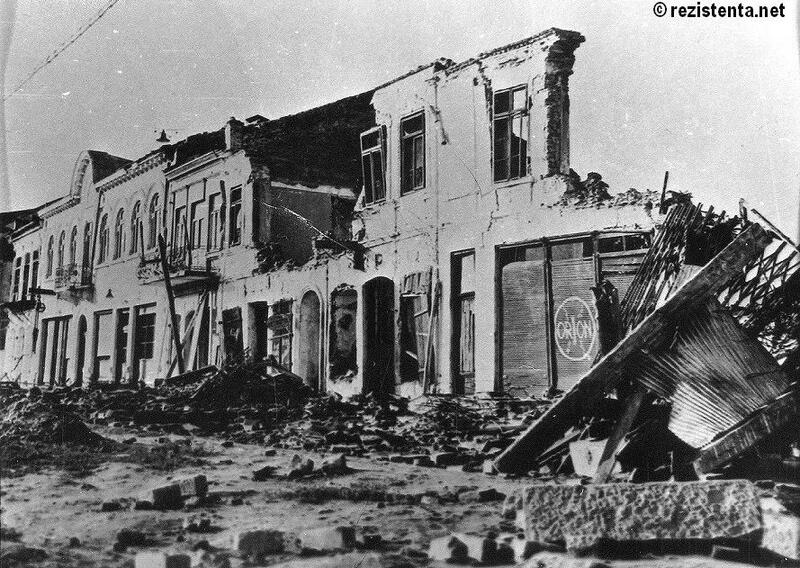 Later, Germans, together with Romanian soldiers, were taken prisoners to Siberia, where most died. 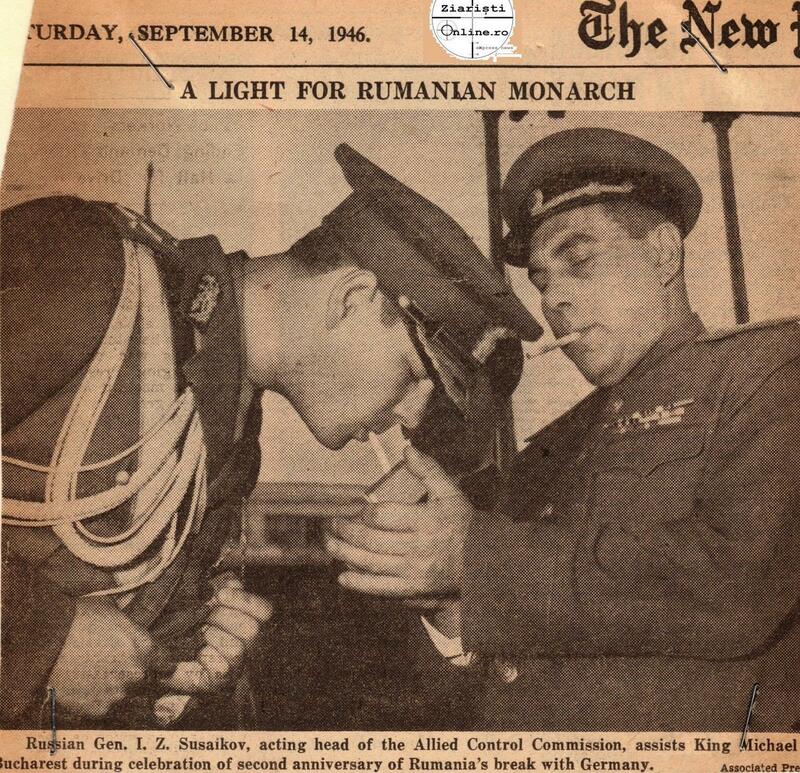 Soviet general Susaikov and King Michael of Romania. 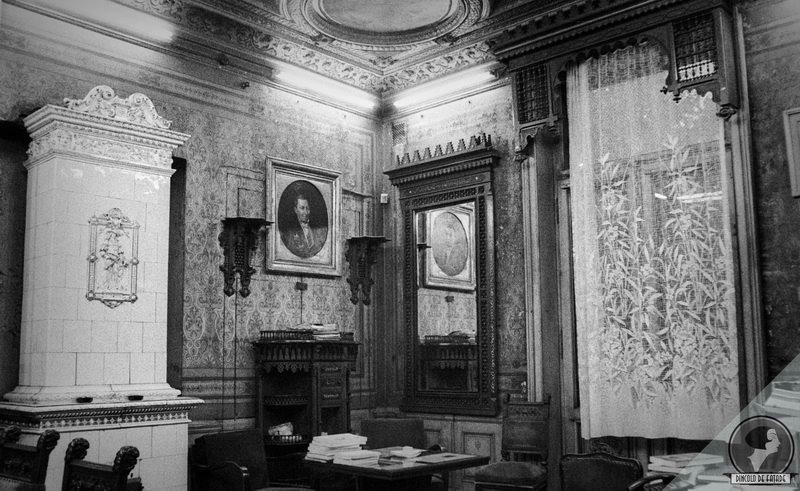 After the forged elections through which the communists won power, the king was forced to abdicate and leave the country. 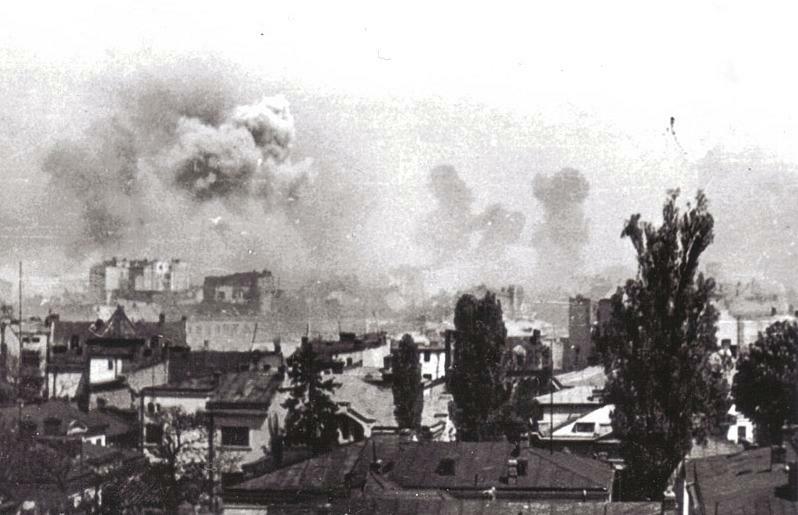 The Nazis, who were taken by surprise by this sudden shift, answered by bombarding Bucharest between 23-27 august in an attempt to regain control. 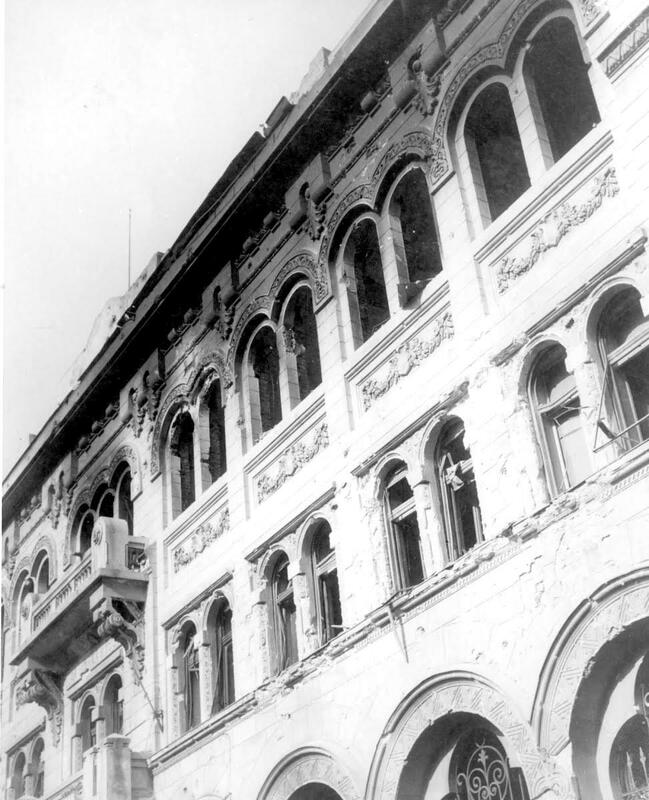 Cultural and especially royal targets were attacked (as an answer to the King’s betrayal), the number of victims standing at 89 dead. 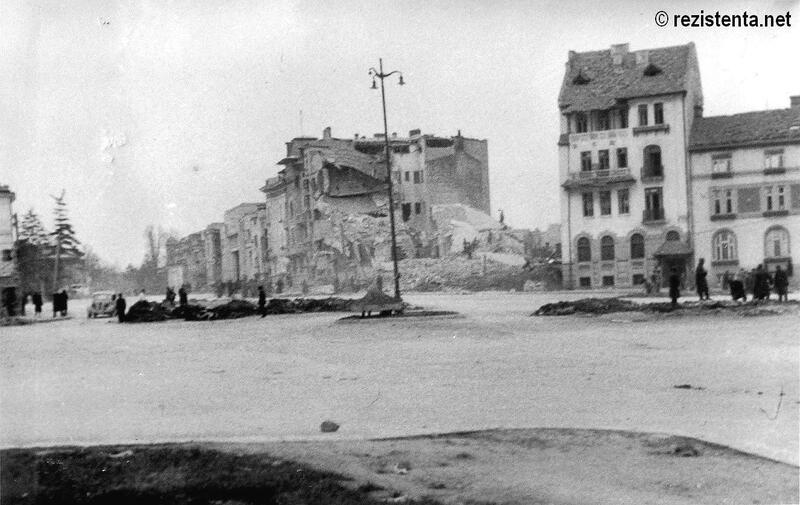 After 3 days, the attack stopped and the Nazis surrendered. 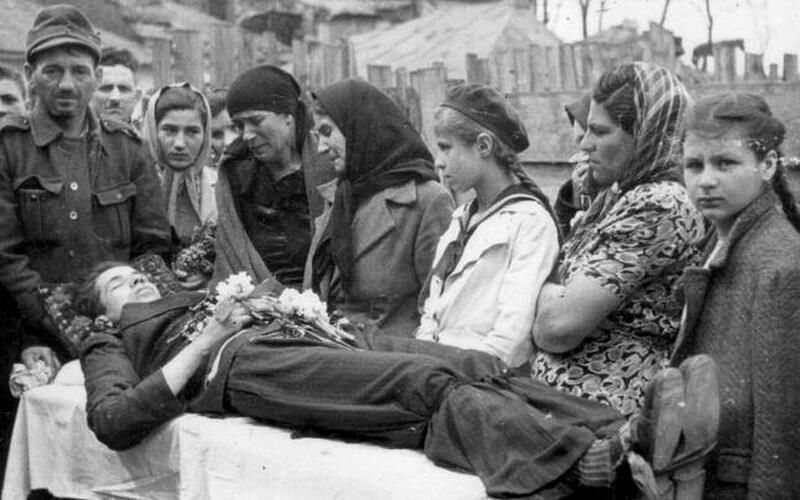 They were taken prisoners by the Soviets and lead to Siberia, where most perished along with Romanian POW’s (who were also taken prisoners despite the so-called agreement). 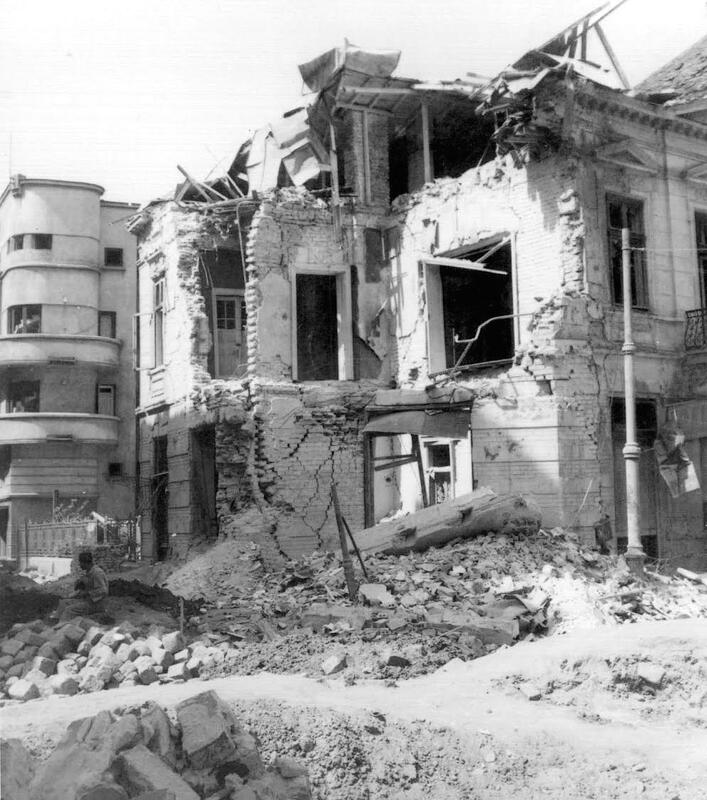 During the first stage of war, Romania kept a neutral position. 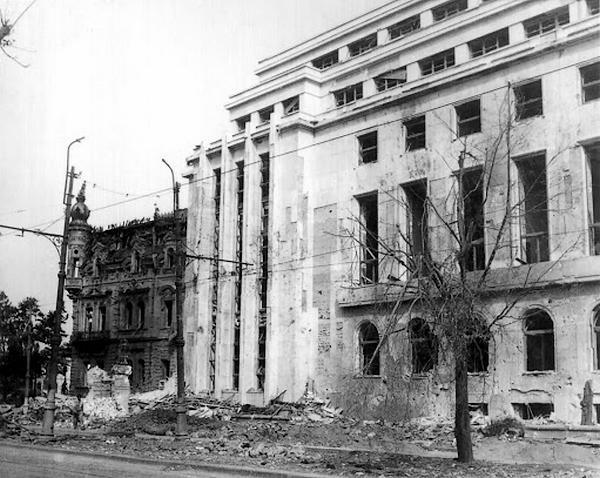 Once Russia invaded and occupied Romanian territory following a secret pact between Russia and Germany, its Western guarantors territorial integrity (Britain and France) failed to intervene and Romania officially entered an alliance with Nazi Germany against the Soviet Union. 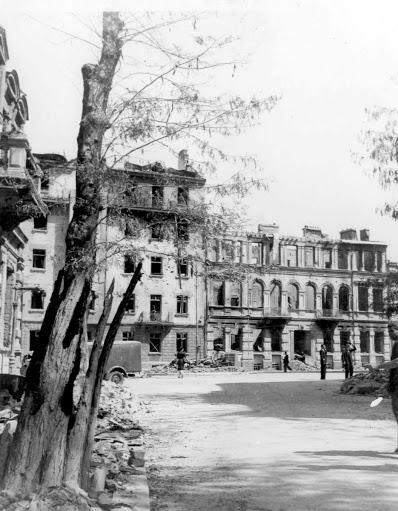 King Michael urged the population to accept Soviet presence, whose troops arrived in Bucharest on August 30, 1944. 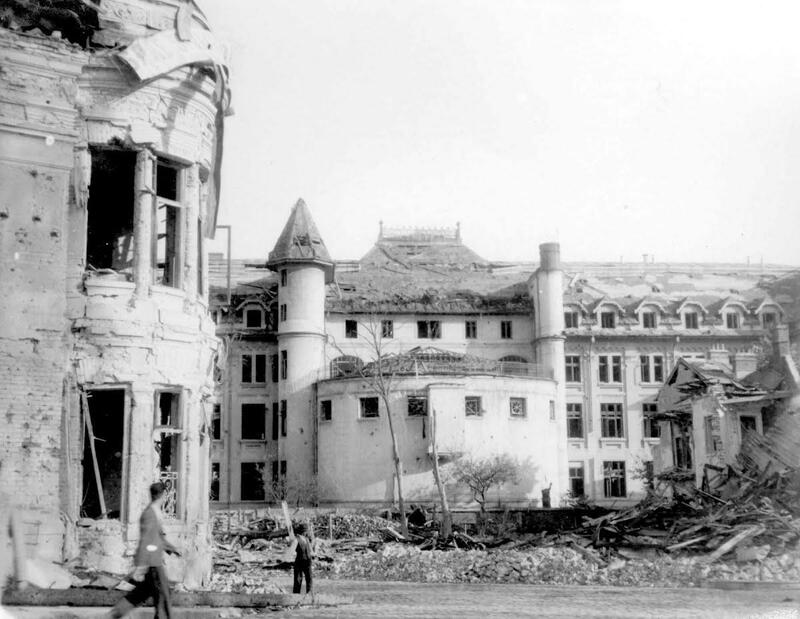 The king’s public declaration stated that the Allies had guaranteed through an armistice that no one will interfere in internal affairs and that the future holds nothing but freedom and democracy. 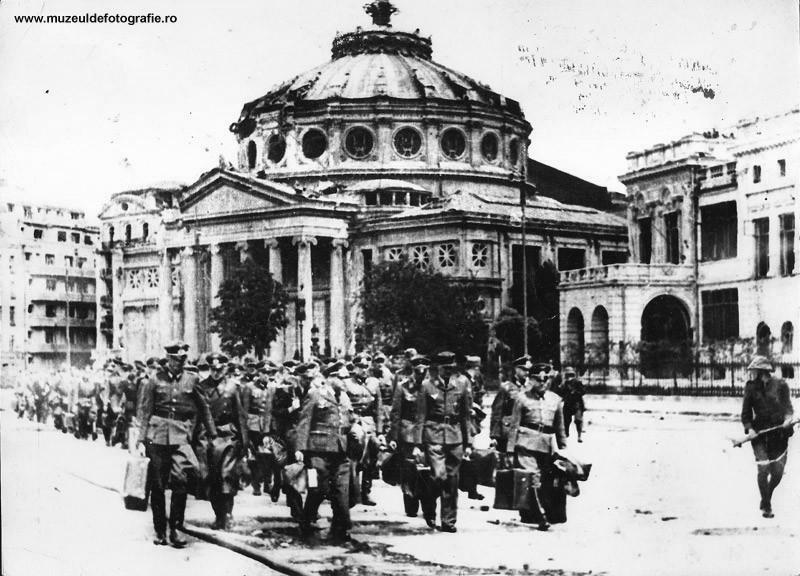 In reality, no armistice has been signed until one month later, by time which the Romanian Army had been convinced to surrender, and the soldiers were taken prisoners to Siberia along with the Germans. 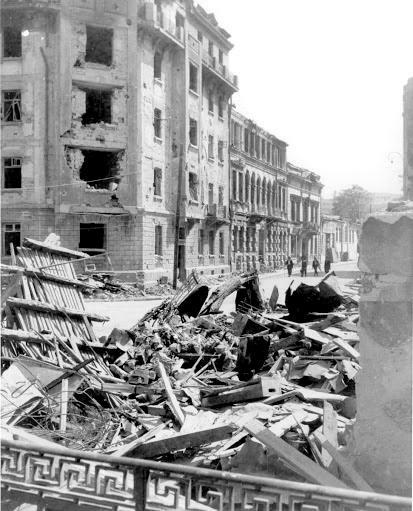 Most of them perished. 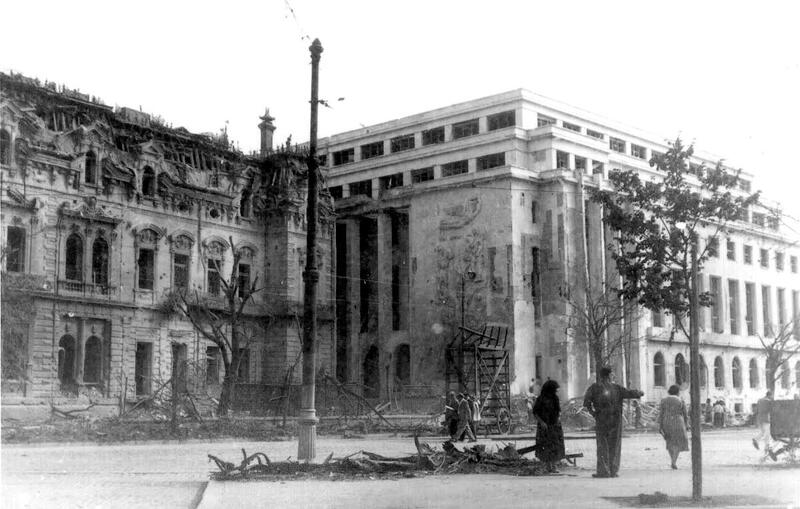 The entire army was dismantled – along with the taking of prisoners, the naval fleet, tanks, planes etc were stolen or destroyed, which left the country incapable of defending itself in front of the Communist takeover which followed. 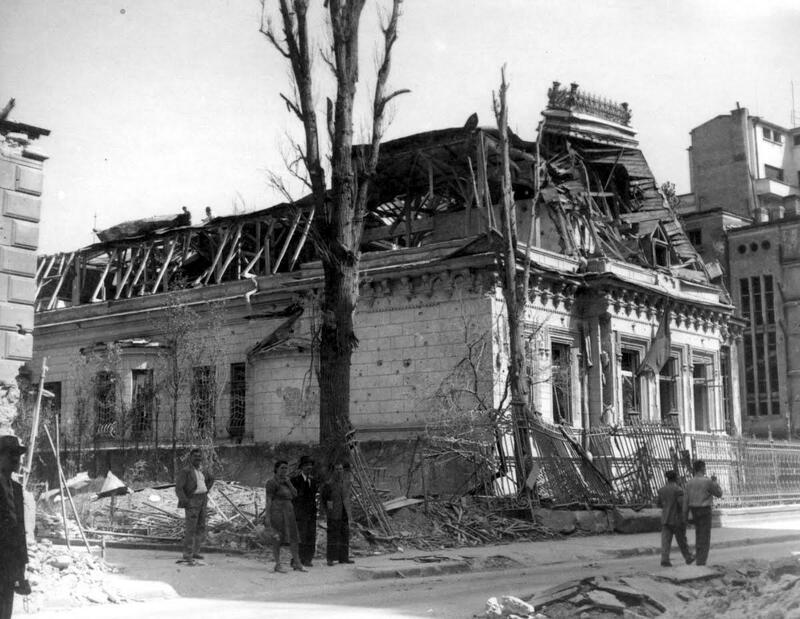 The Soviet troops, who famously averted signing the Geneva convention, resorted to robbery, rapes and even murder, as reported by general Nicolae Radescu in Bucharest. 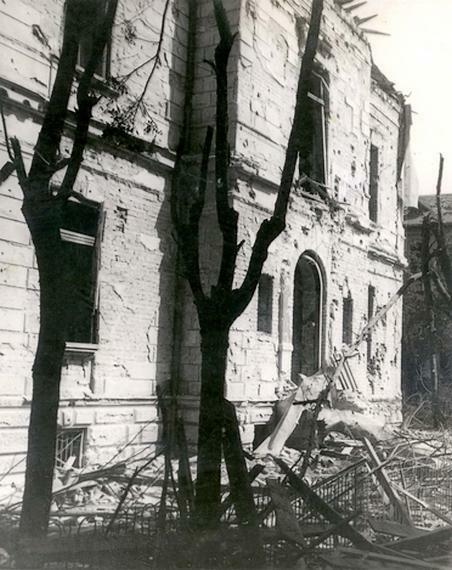 His reports were ignored by the local Soviet representatives or the Russian embassy. 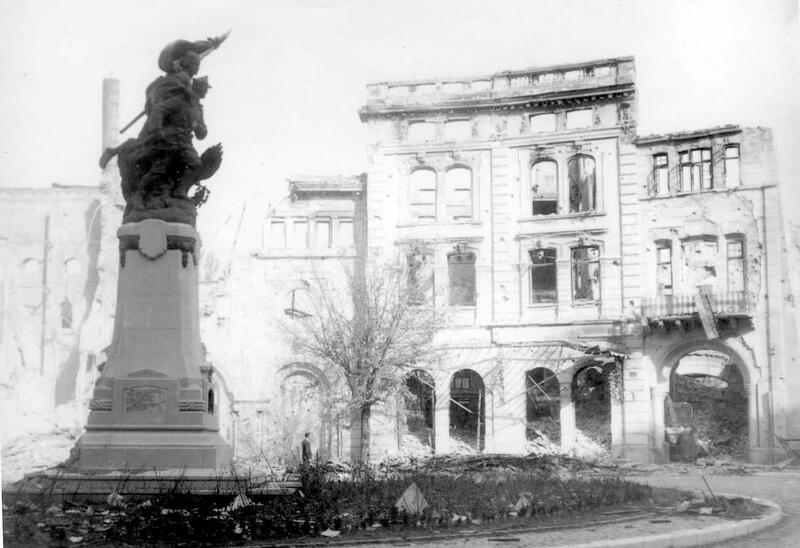 The same behavior was reported throughout the country. 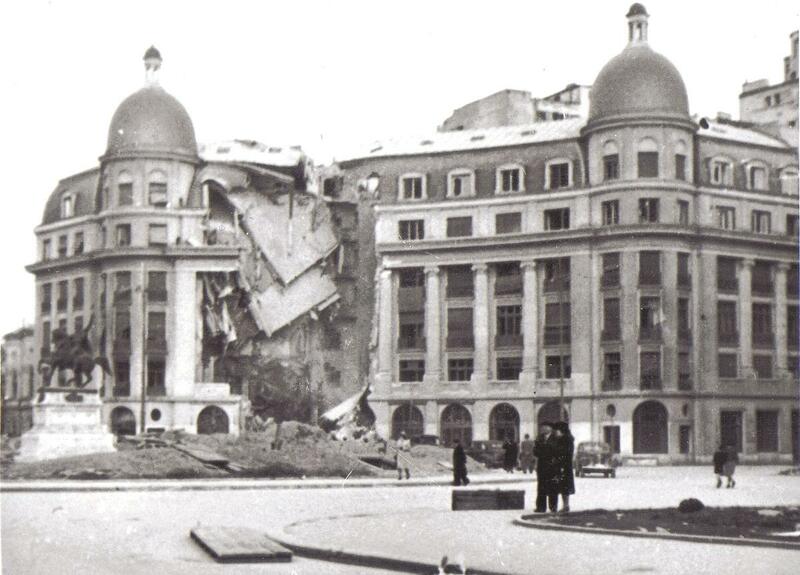 In the decade that followed, the robbery continued on the highest level through the SovRom (Soviet-Romanian) companies, which ripped the country of its wealth and left behind a ruined economy. 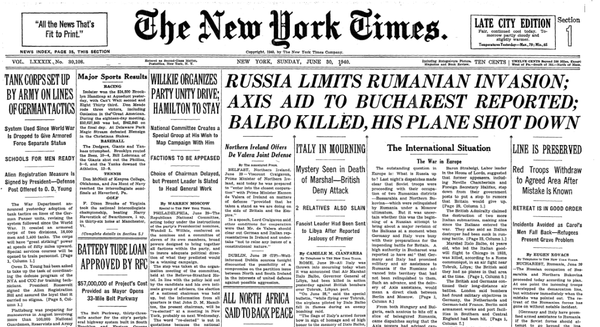 In 1945, the prospects of freedom were officially signed away by the Allies through the Yalta agreement. 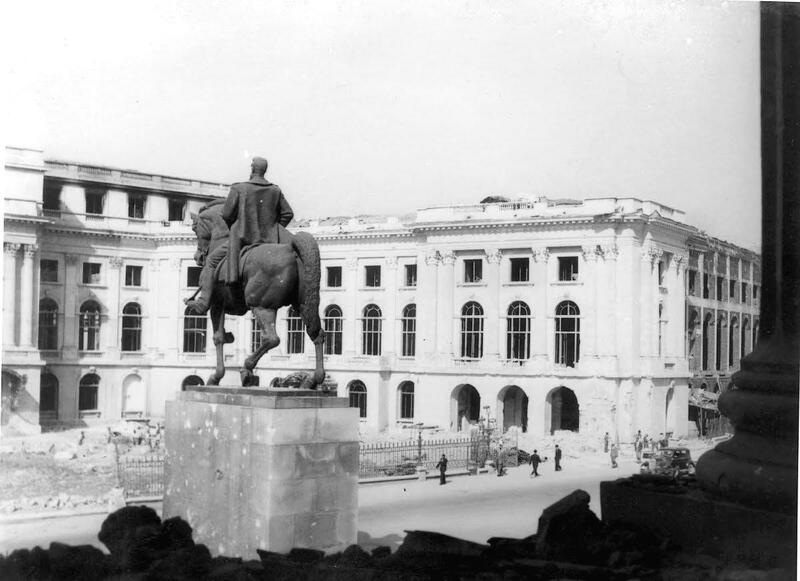 The King, who had been used as a simple tool, was forced to abdicate in 1947 and he was expelled. 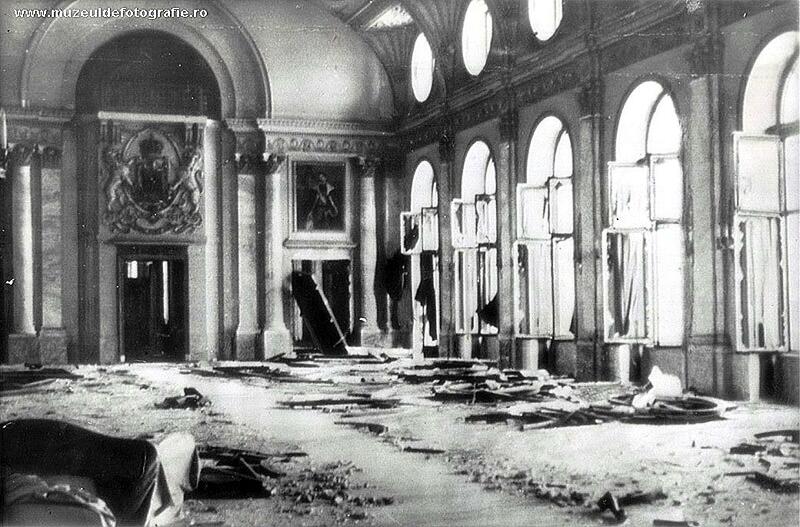 Communists rigged the elections and started a reign of terror. 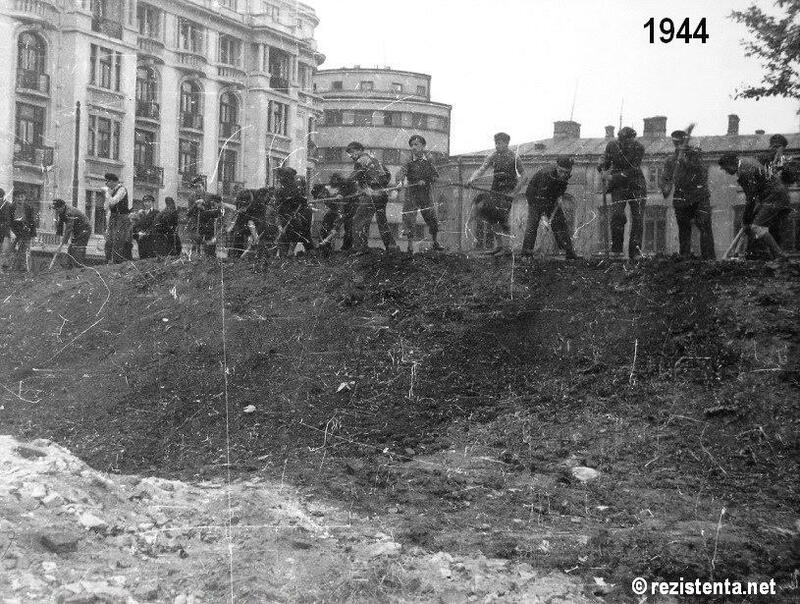 The entire non-communist government was arrested. 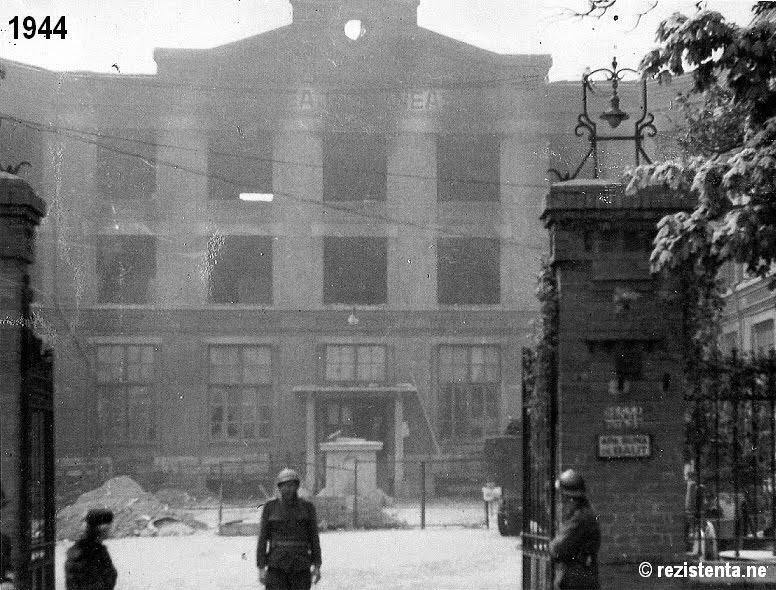 Since the Army had been quietly dismantled in 1944, there were no means for the government and population to defend itself. 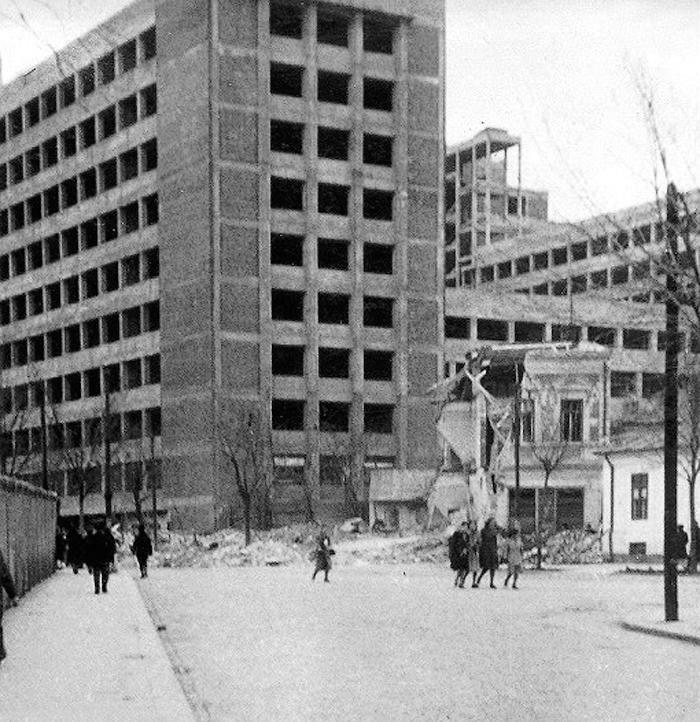 After the American bombardments and the subsequent occupation by the Soviet forces, the following decades brought on a new face to the city – that of Brutalist architecture, imposed by the Communist regime. 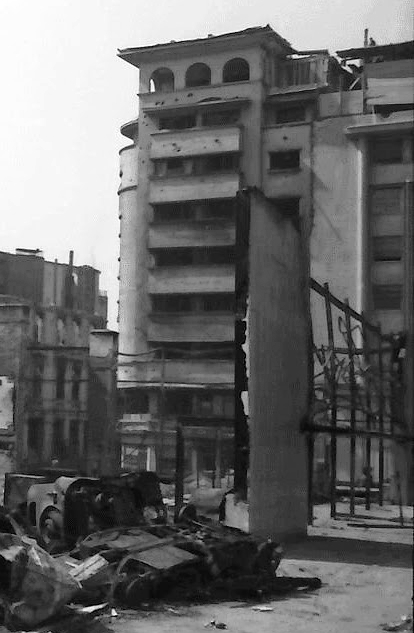 Eye-witness excerpts include reactions from civilian population, who did not believe until last minute that they are under attack. 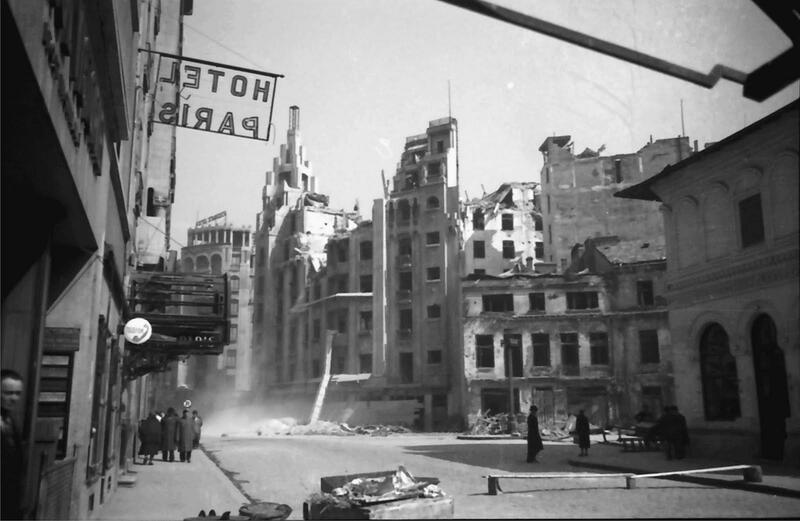 Romania had never considered the US or the British a military target, its only preoccupation being the eastern front. 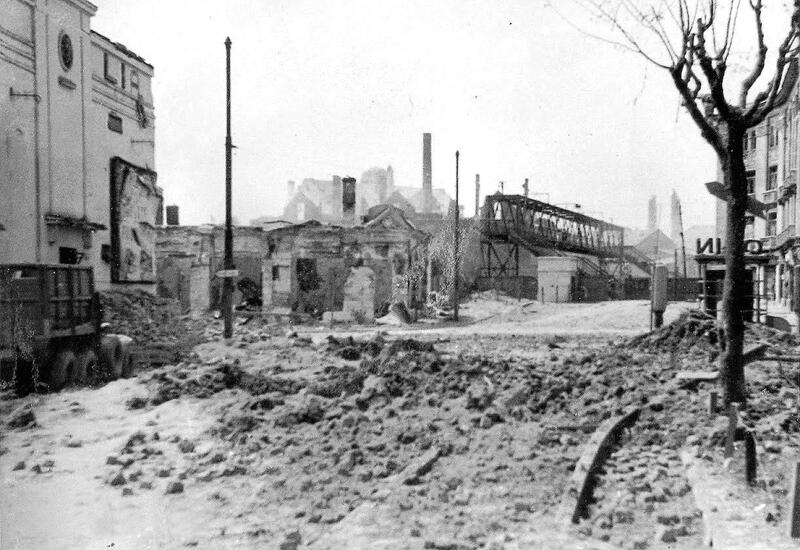 “Everything was going well on 4 April 1944. 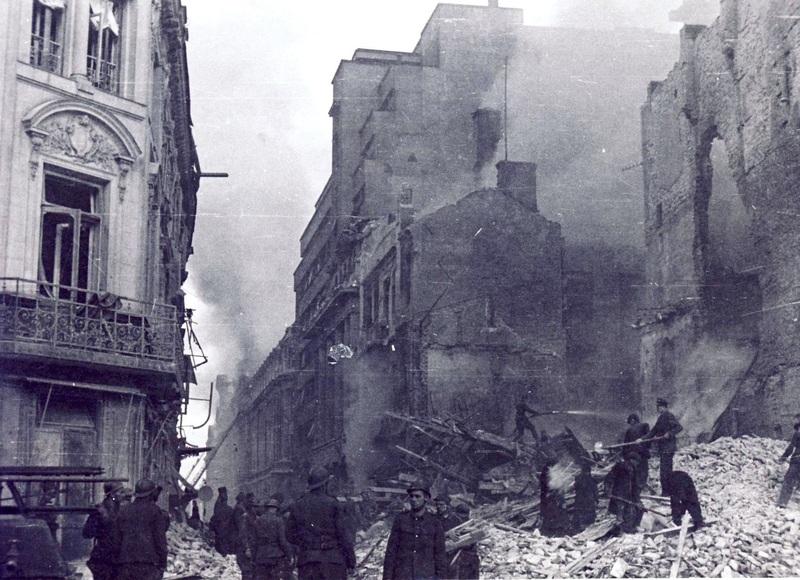 But suddenly, at 13.45, alarms start ringing throughout the capital. 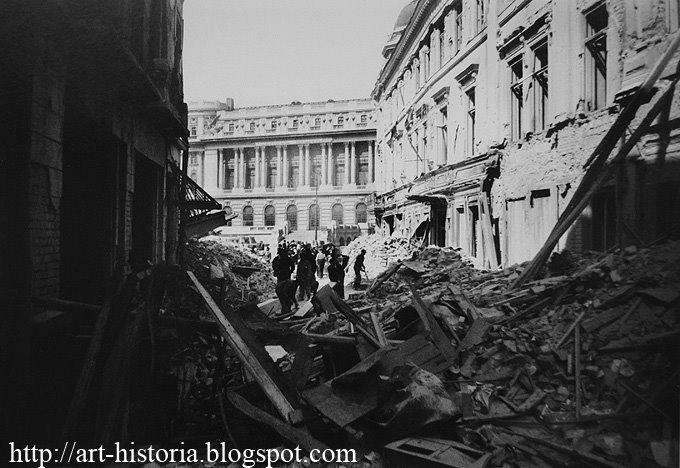 Unfortunately, many of the capital’s residents didnt react properly, because they thought it was an exercise and so they didnt reach the air-raid shelters on time. 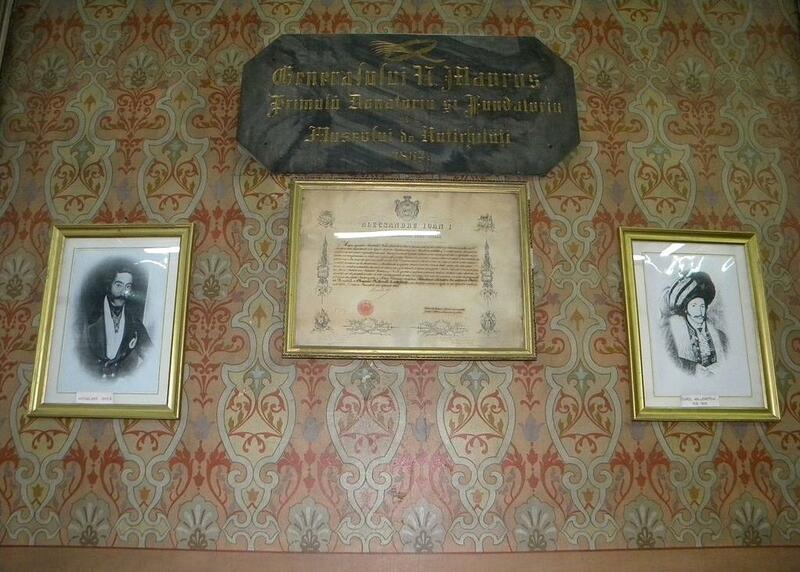 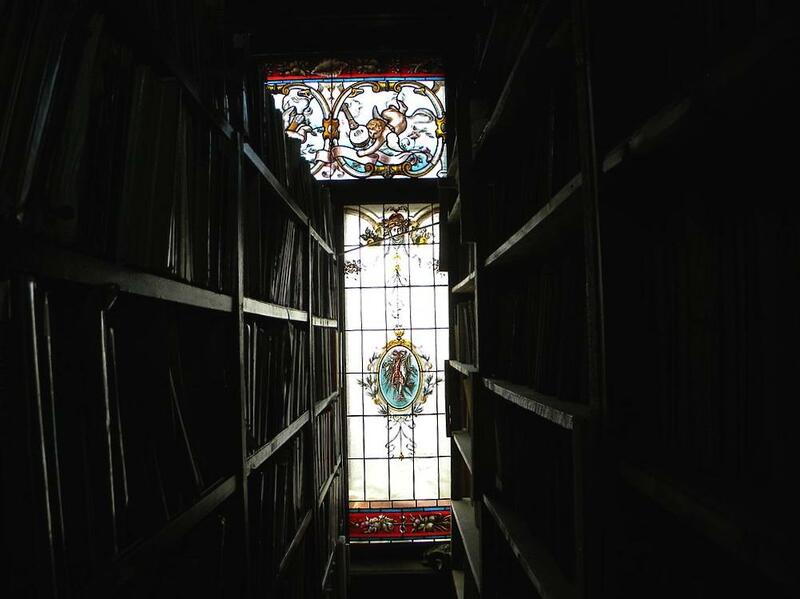 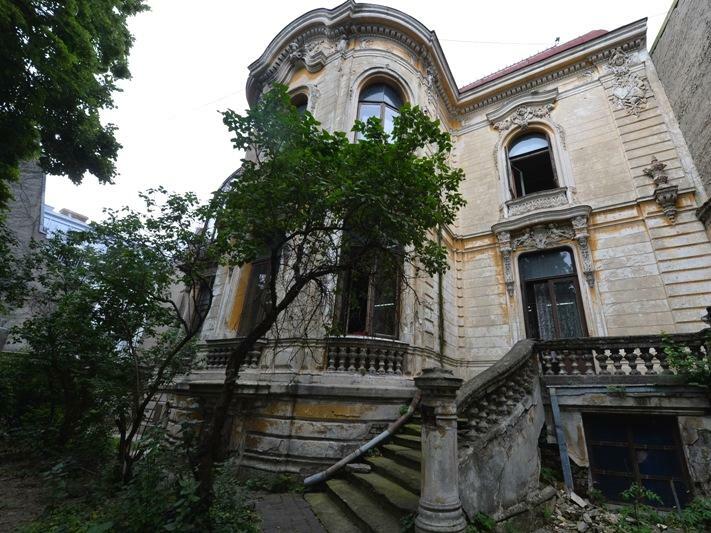 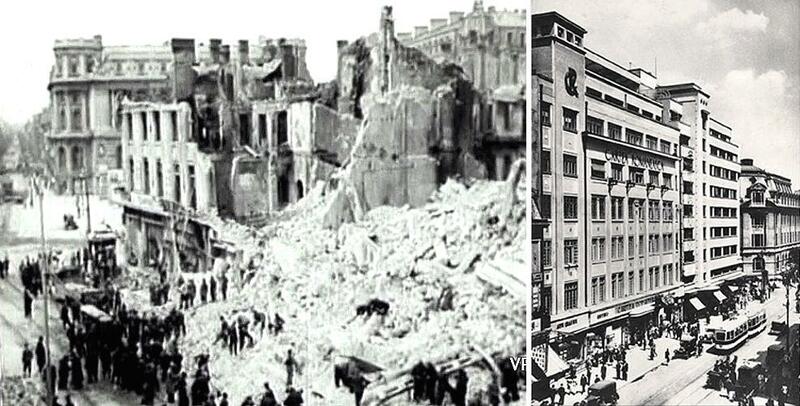 Before and after – “Cartea Romaneasca”, some of the oldest printing workshops in Romania, reduced to rubble. 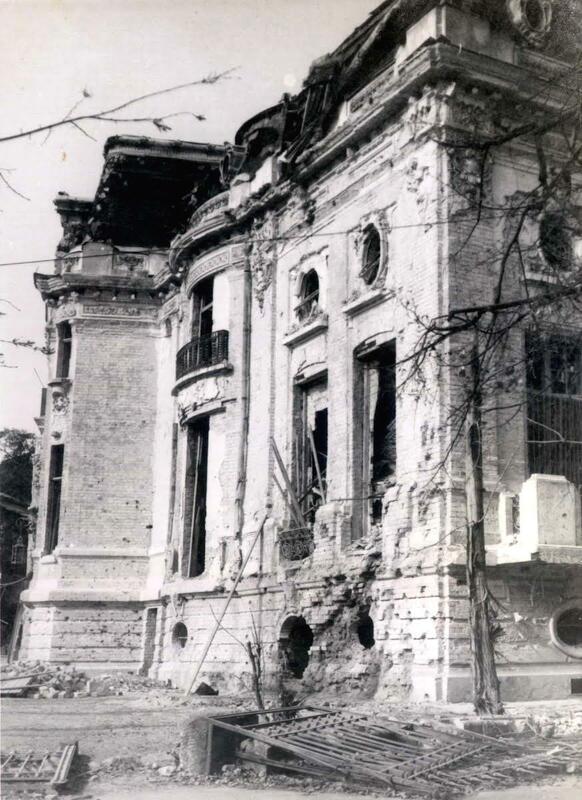 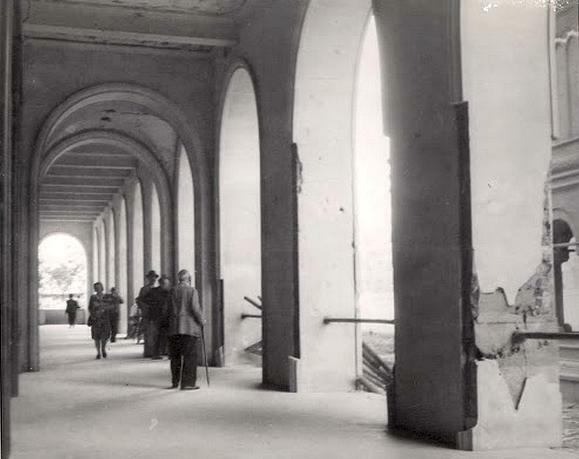 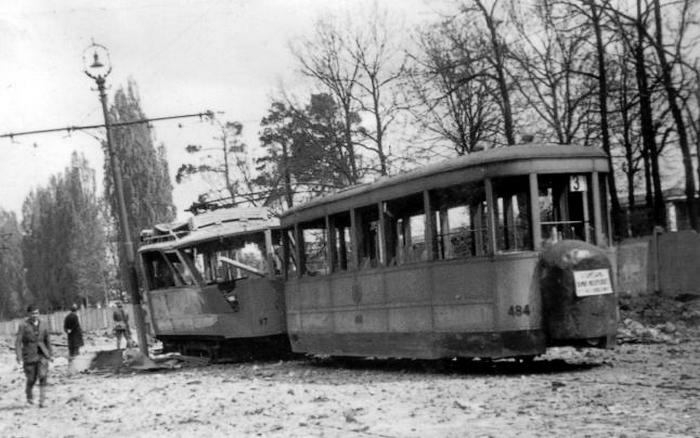 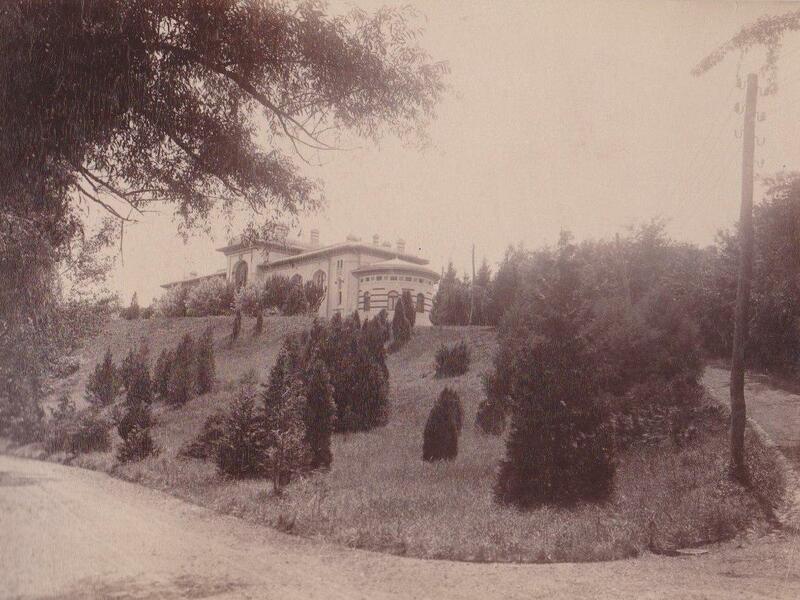 “April 4, 1944 was one of the most unfortunate days for the Bucharest Botanical Garden. 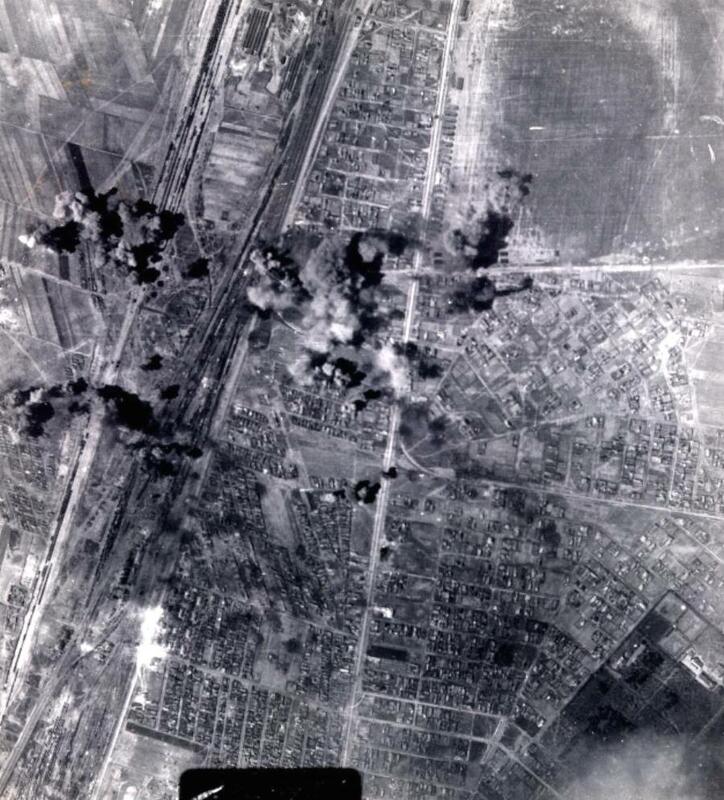 Over 90 bombs launched by the Allies fell on the area of about 17 hectares. 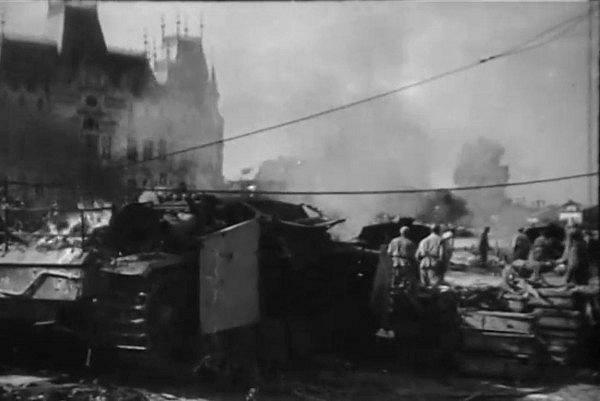 The losses were huge. 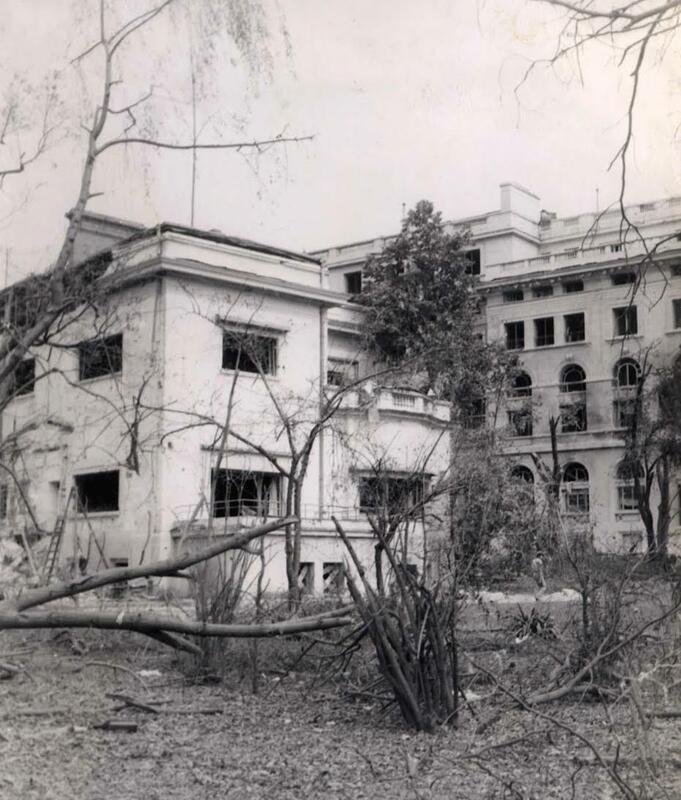 The Botanic Institute building burnt to the ground. 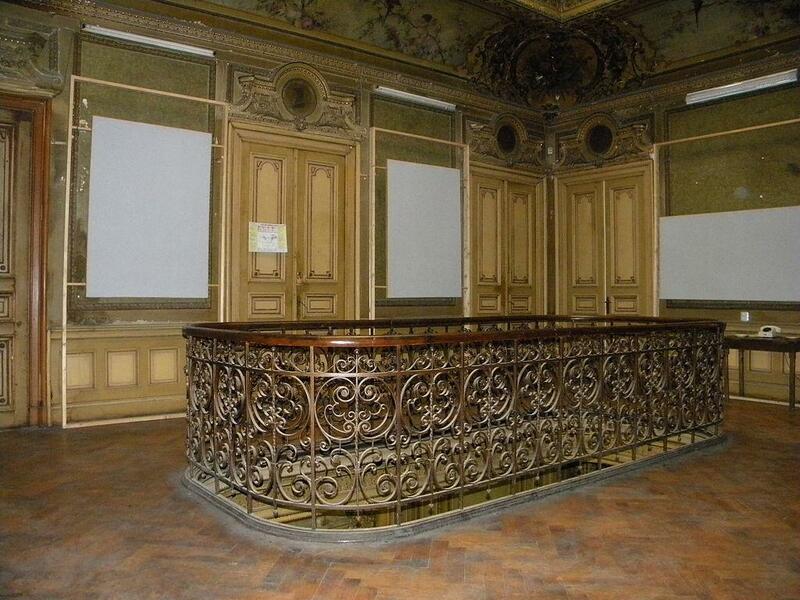 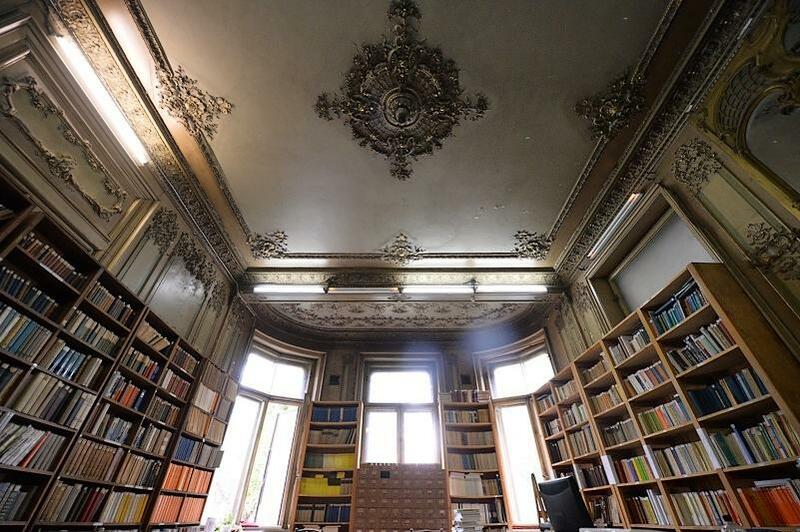 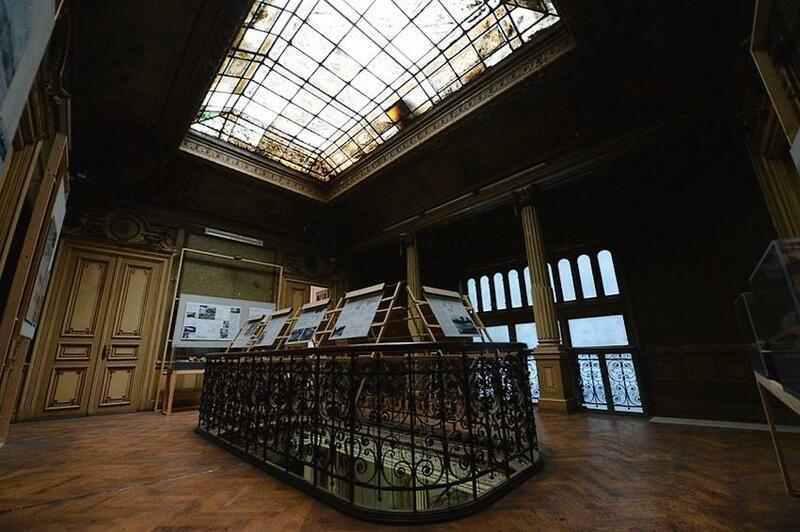 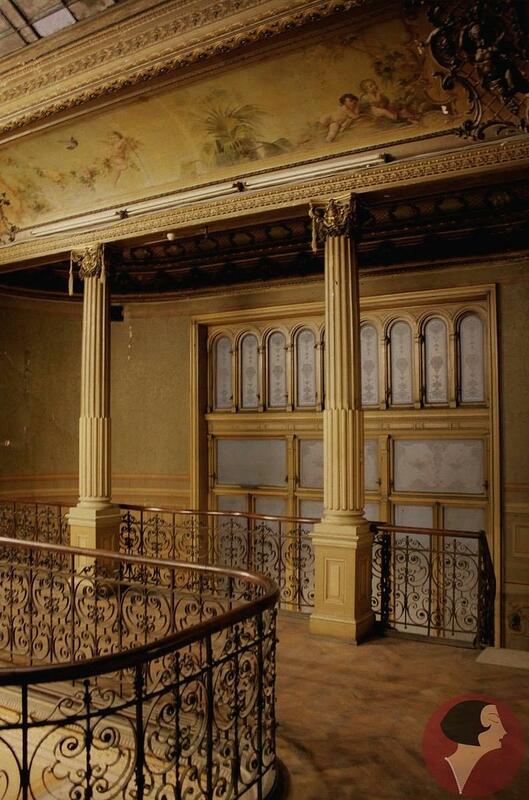 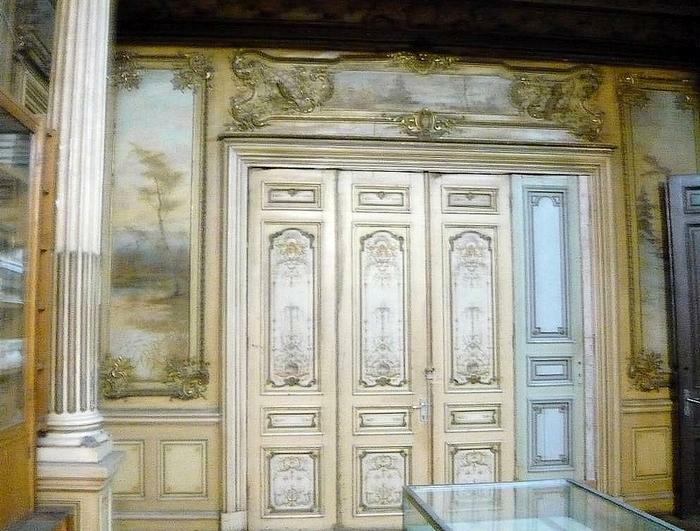 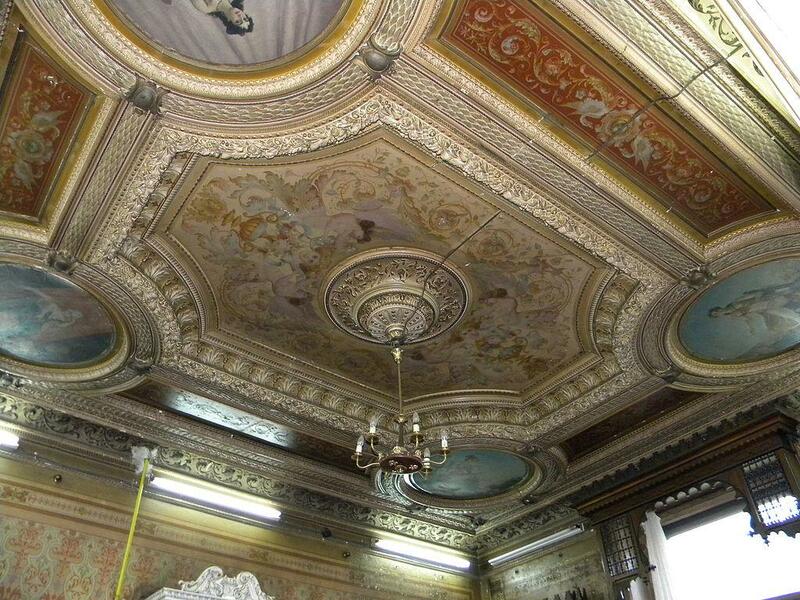 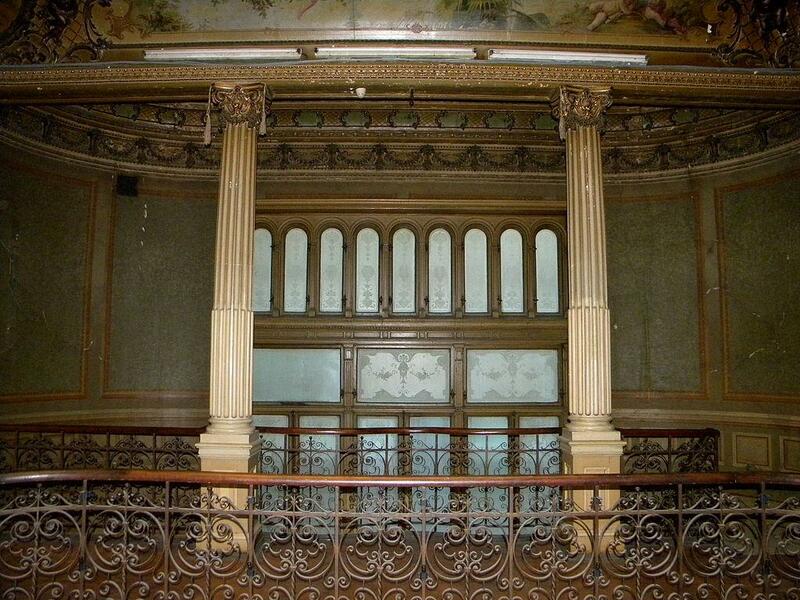 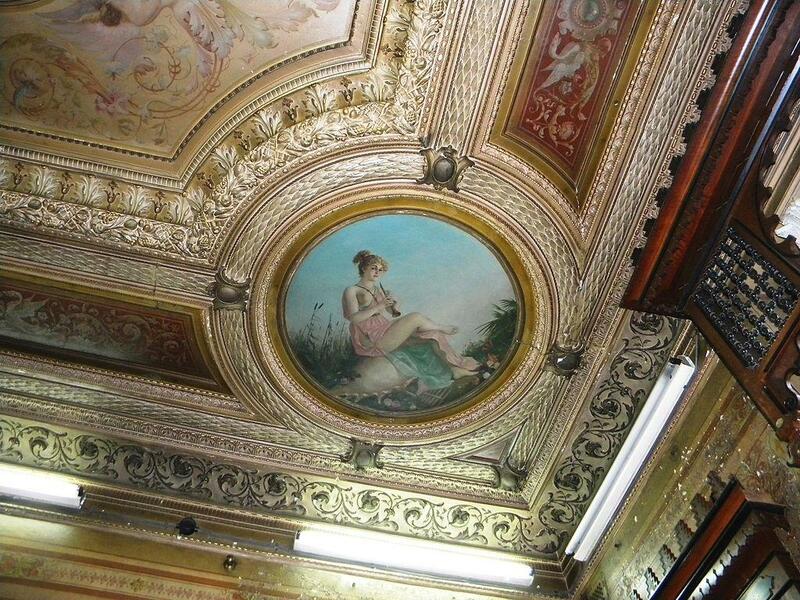 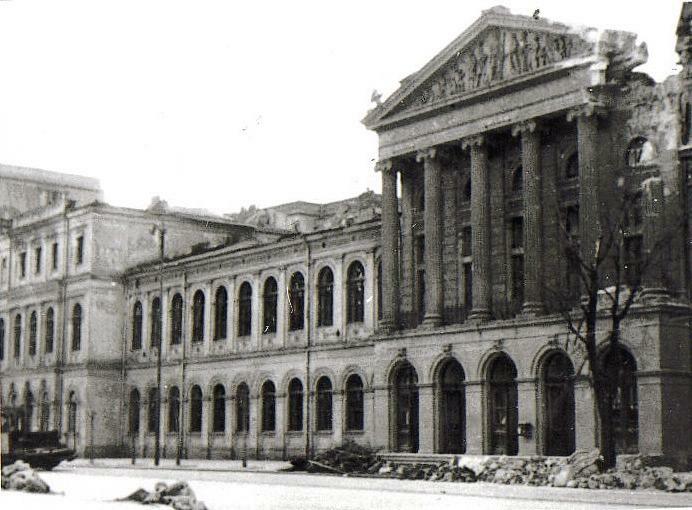 It not only housed classrooms and laboratories, but also a very valuable herbarium and a botanical museum. 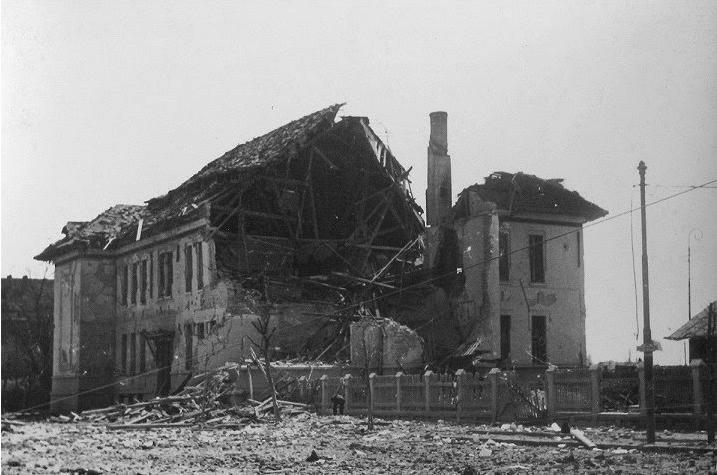 The Old Greenhouse, built in 1891, was also destroyed. 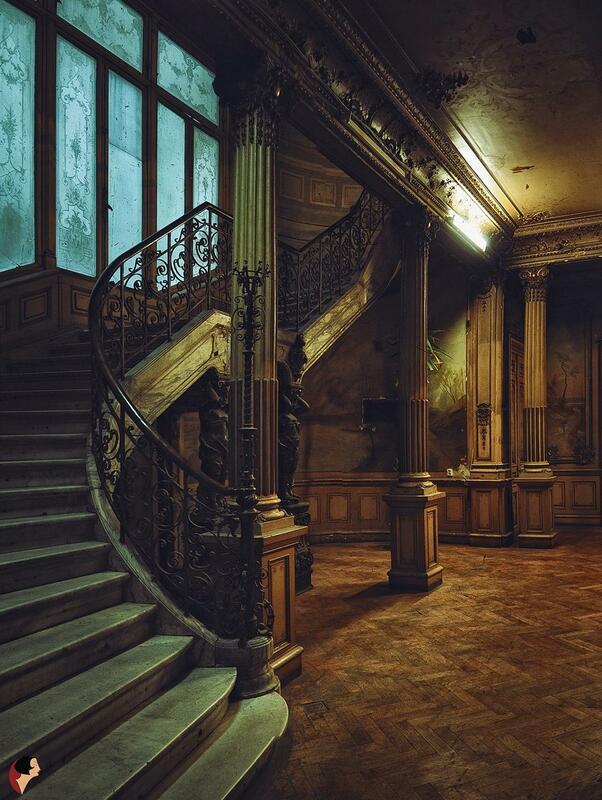 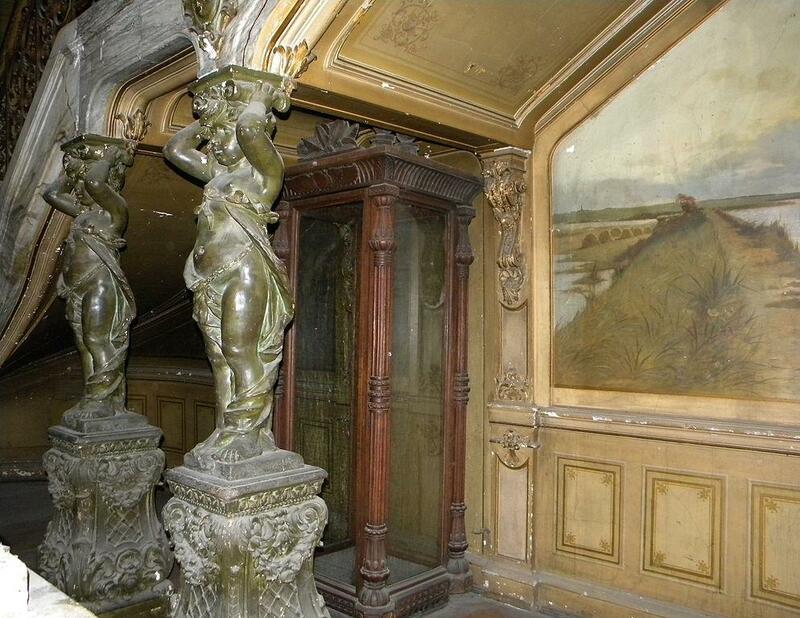 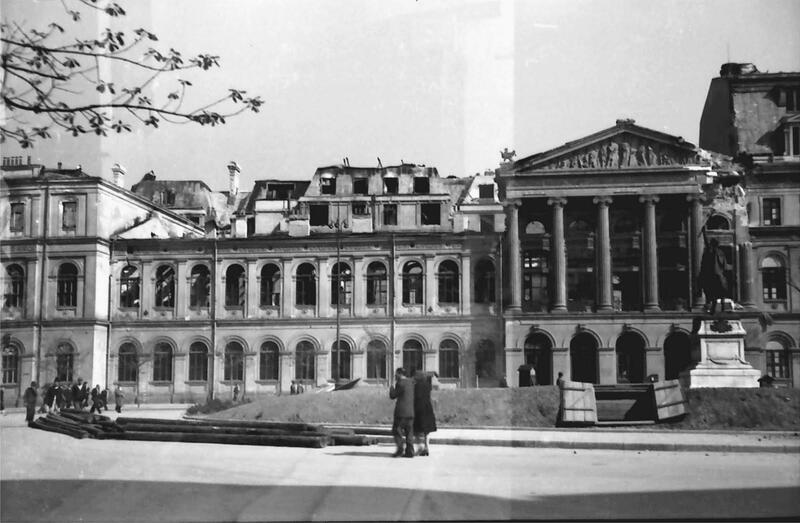 Its “twin sister” garden, the Botanical Garden of Liege, was almost completely destroyed. 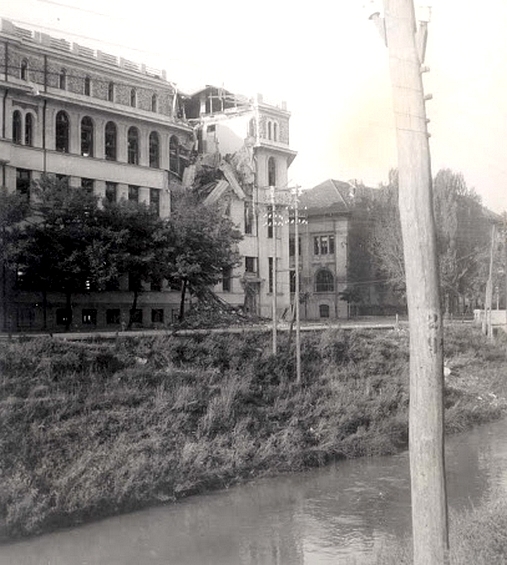 The water supply was also affected. 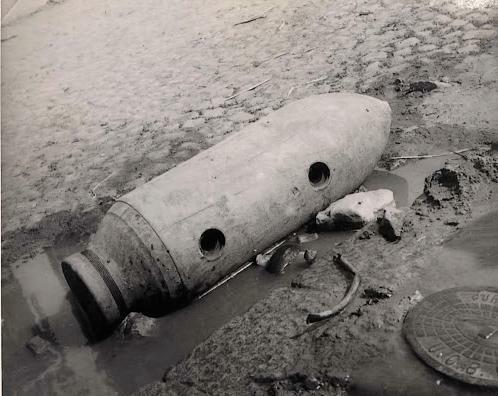 Few know now that, for many months, glasshouse plants were doused with the water accumulated in the pits produced by bombs. 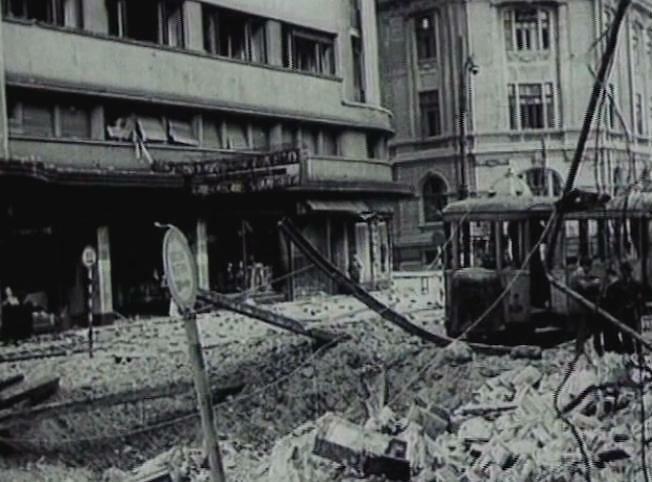 Losses however were not limited to material ones. 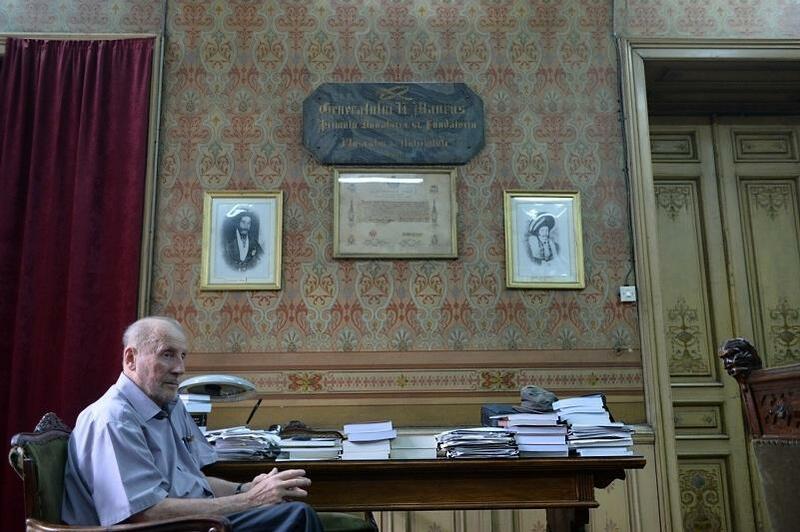 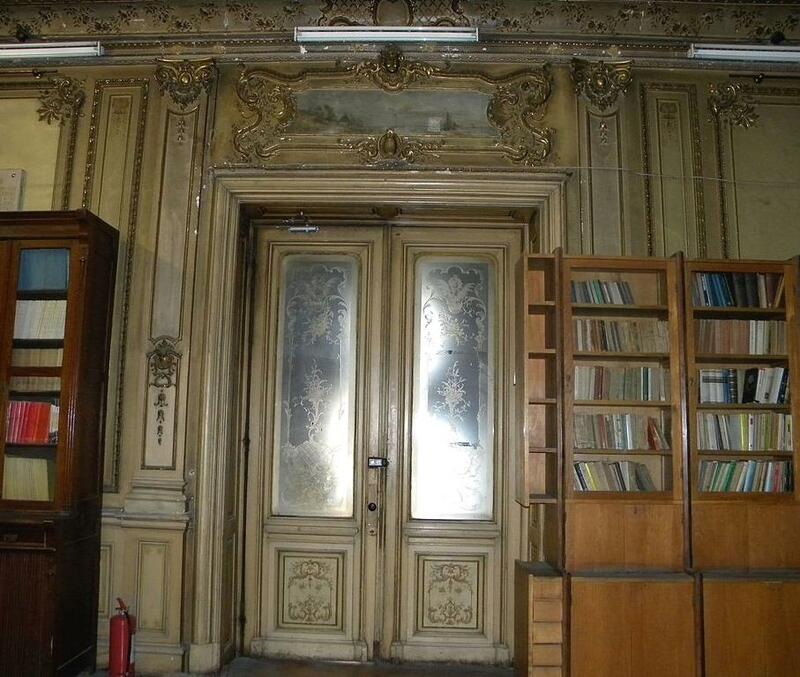 One of the most dedicated botanists – Aurelian Vladescu – died while trying to save some of the herbarium collection. 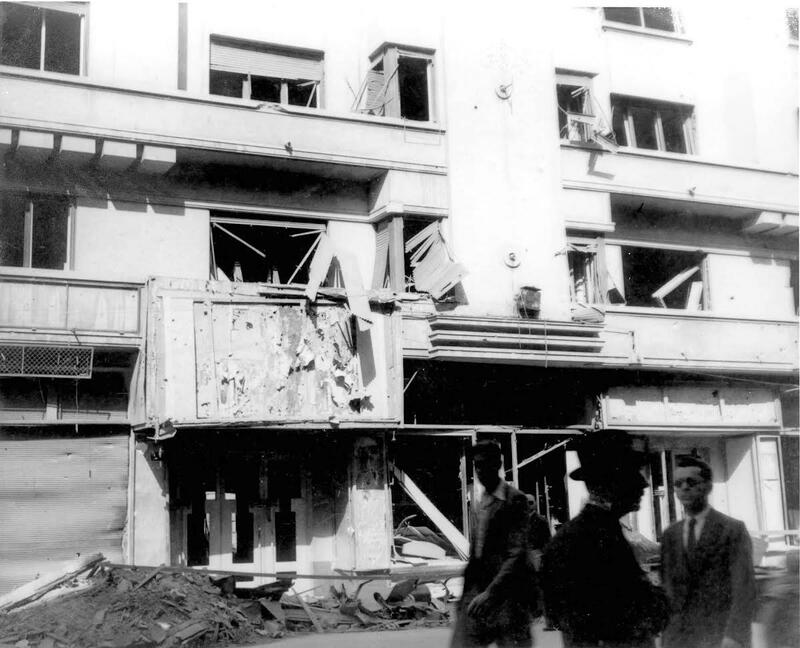 There were also deaths among other employees. 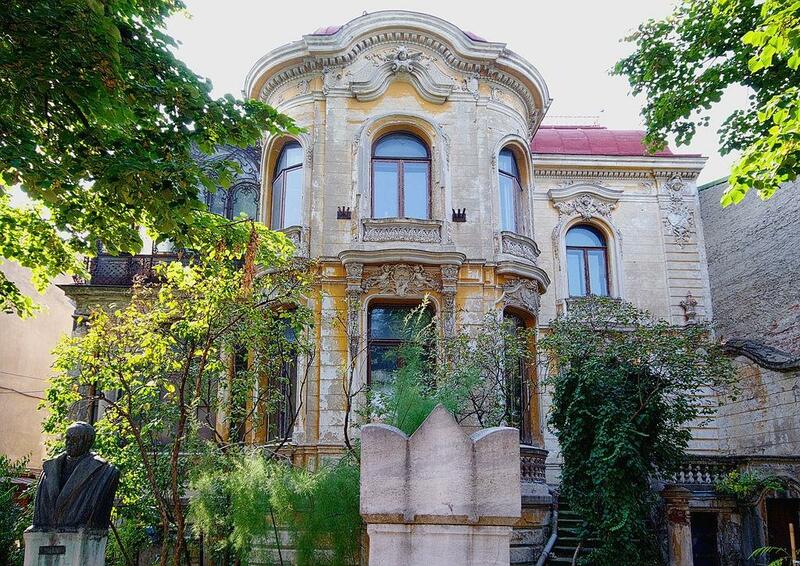 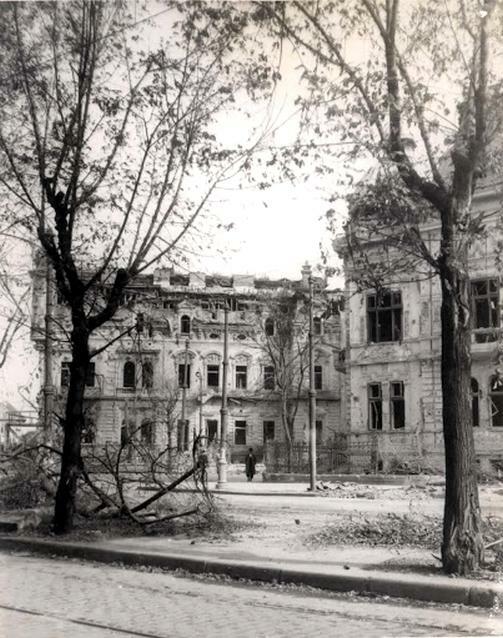 And sadly, next to the employees, there were also victims among the residents of the Cotroceni neighborhood, who had taken refuge in the Botanical Garden believing it was a safer place. 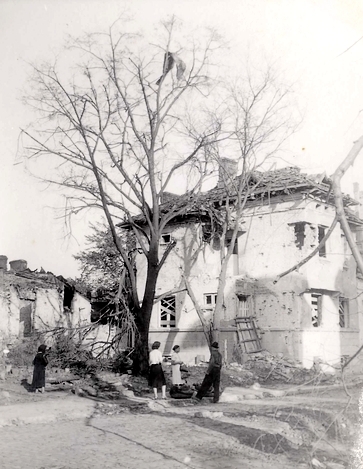 Victim in Bucharest suburbs, which were devastated by carpet bombing. 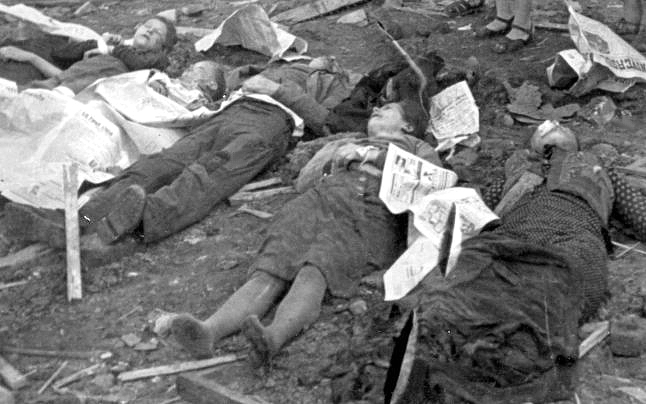 The body is layed outside as there are no structures left intact in the neighborhood. 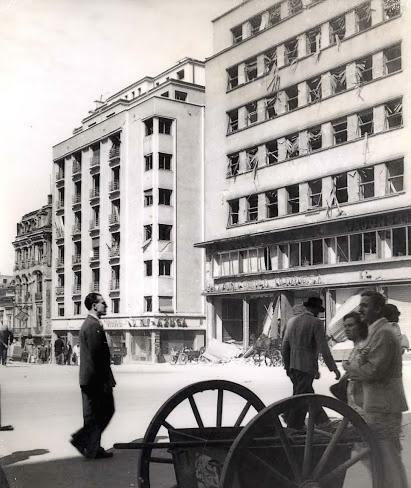 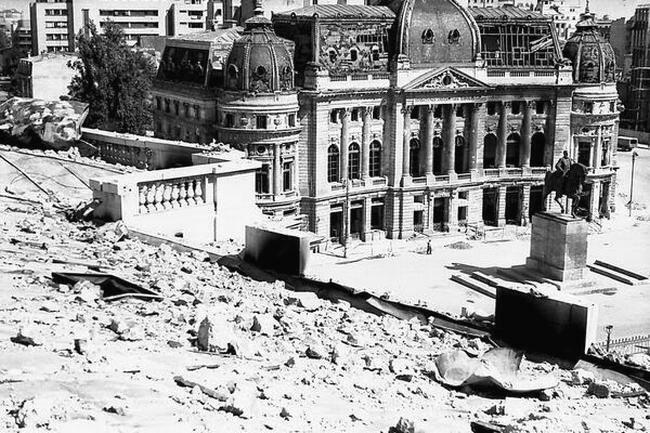 Mircea Eliade: “I spent the entire month of April terrorized by Anglo-American bombardment, which started the cultural and scientific destruction of Bucharest. 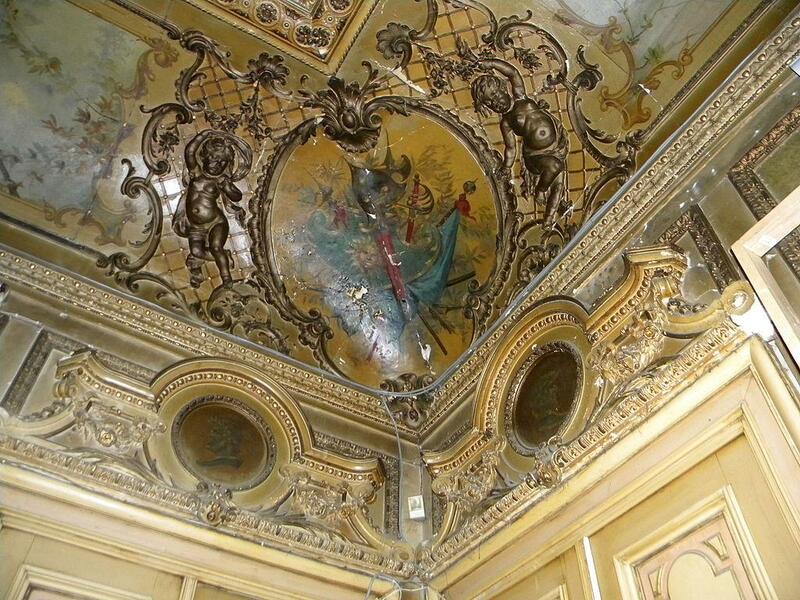 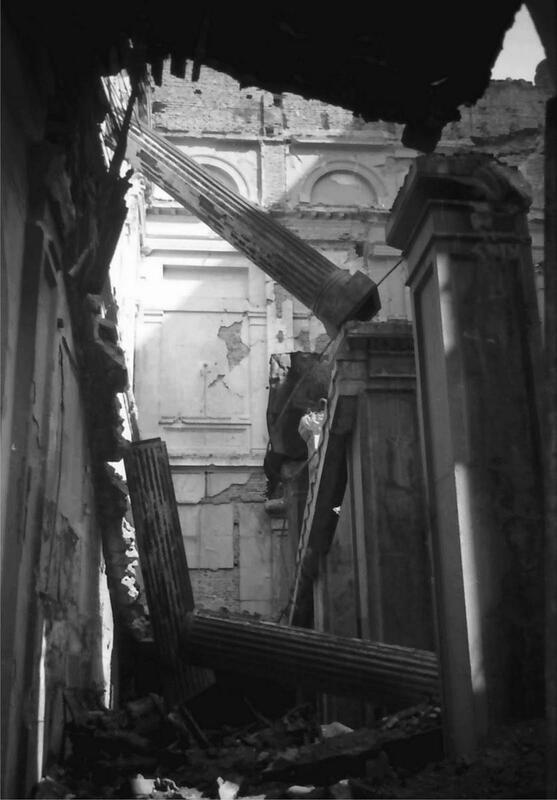 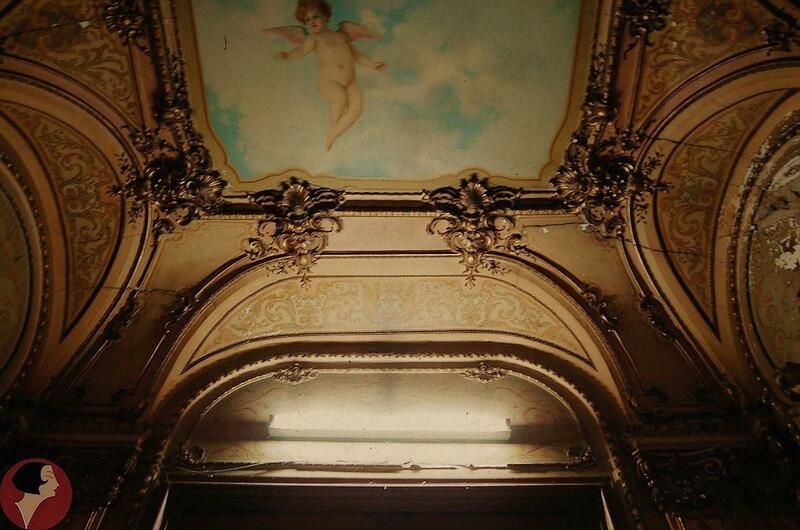 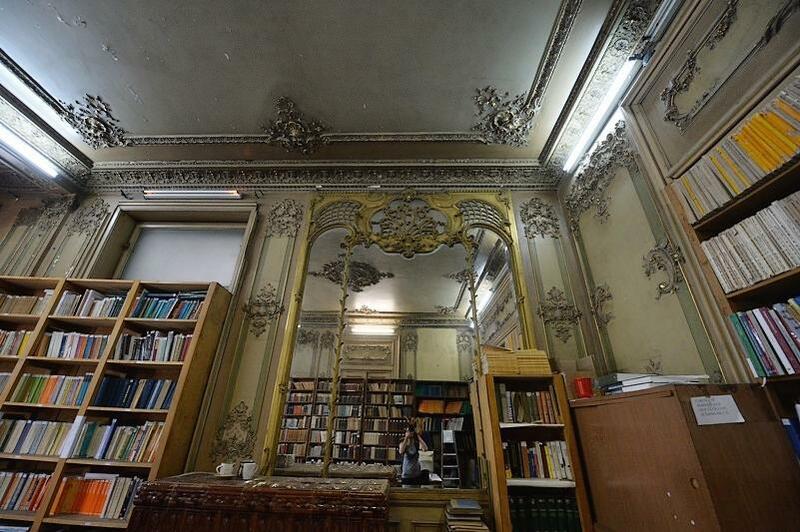 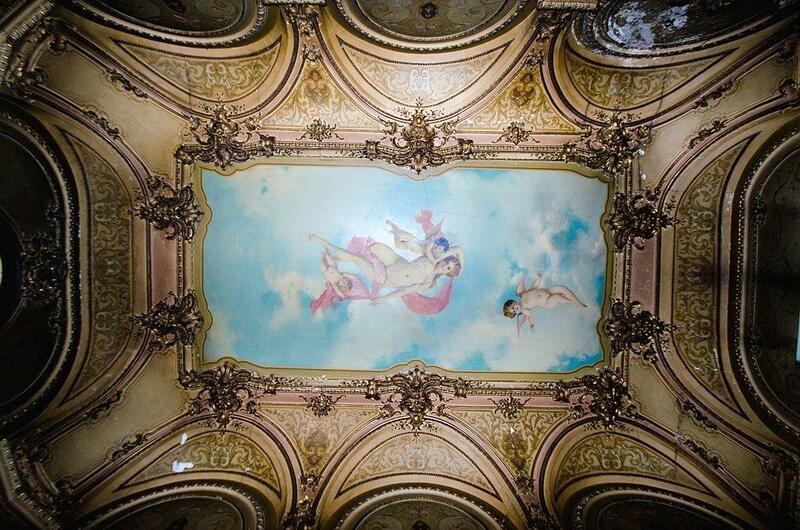 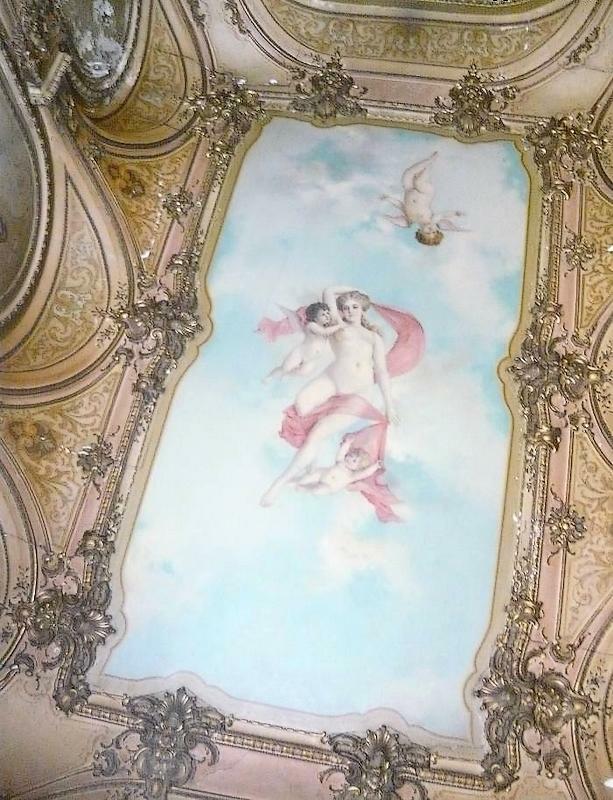 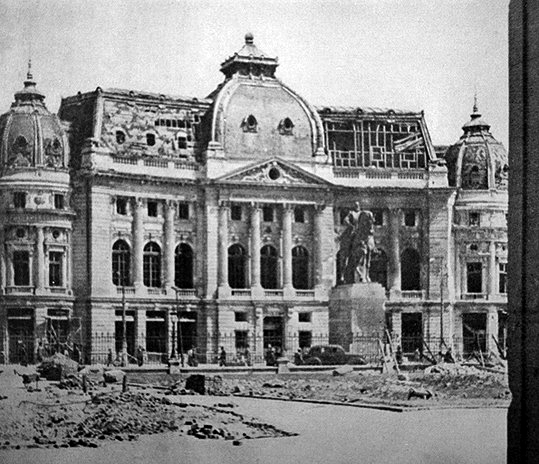 I think about the cultural institutions that we had and that the liberators destroyed. 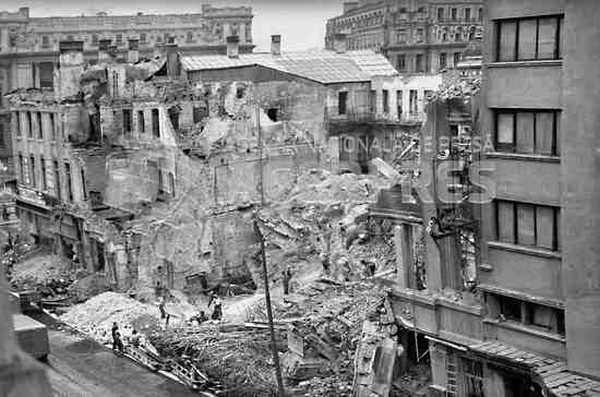 I cannot help but observe the imbecility of Anglo-Americans – and the ability of Soviets to compel the Allies to bomb the cities while they’re content with strict military victories “. 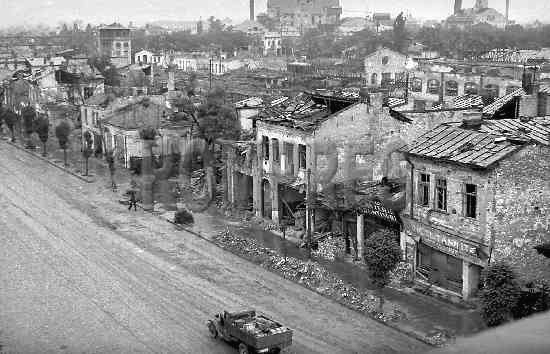 The final insult for the refugees came when they all fell under the overwhelming waves of carpet bombing, which left no chance of survival. 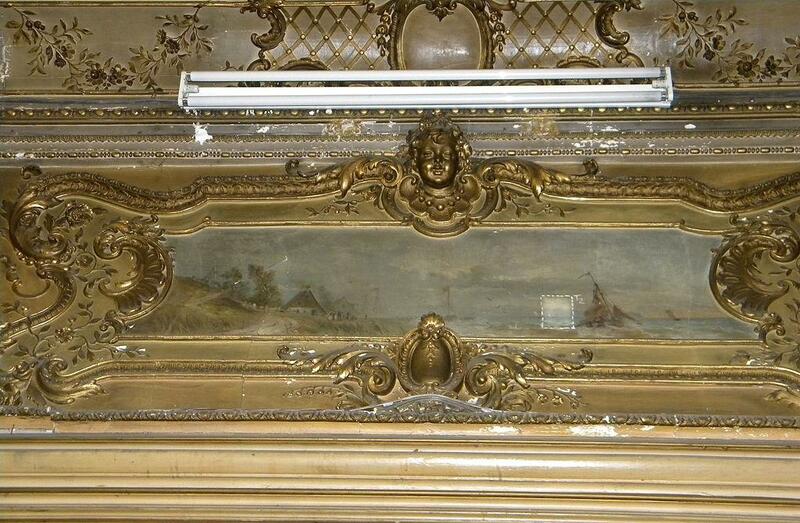 News article tells of the damage assessed until May 8th. 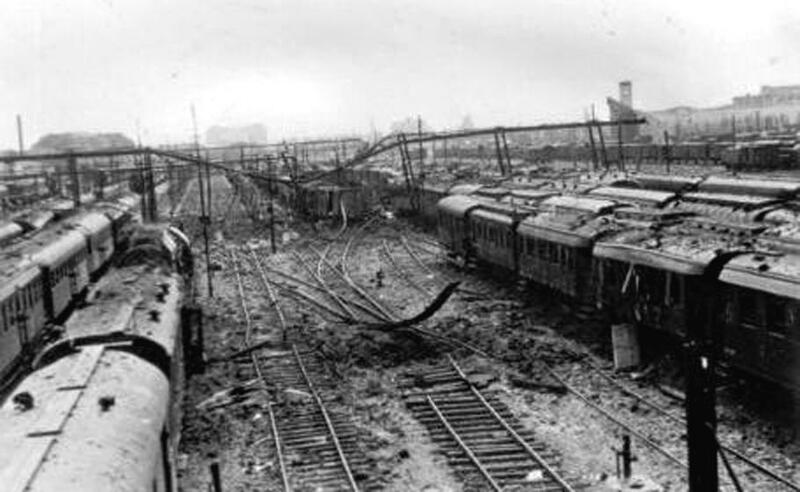 The final number of victims was not yet counted. 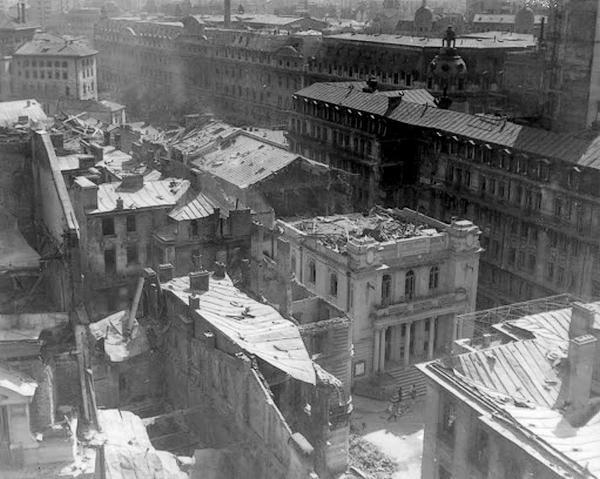 The toll (up to this point) had been 14.000 homes, 18 hospitals, 21 enterprises with no military value, 47 cultural institutions, 14 churches and cemeteries. 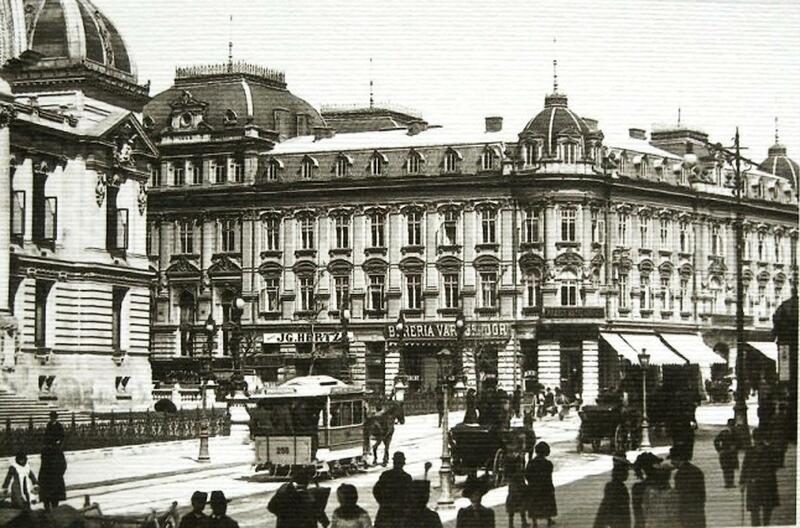 The National Theatre, built in the XIX century. 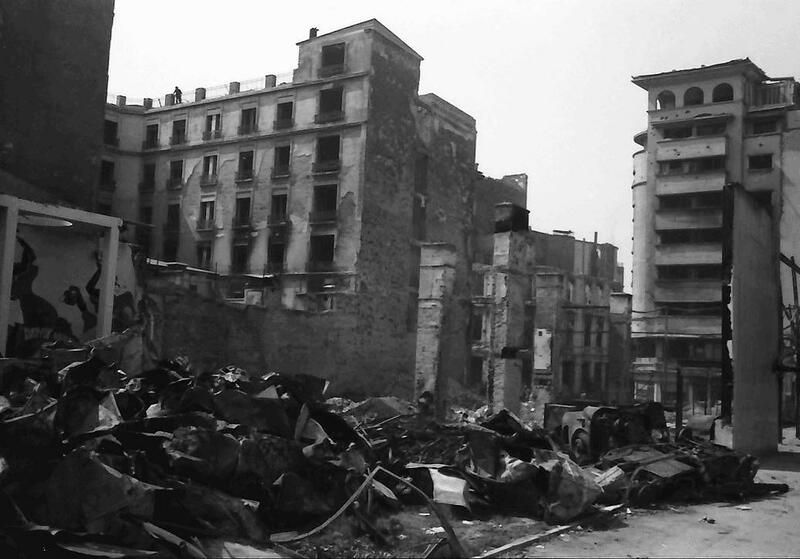 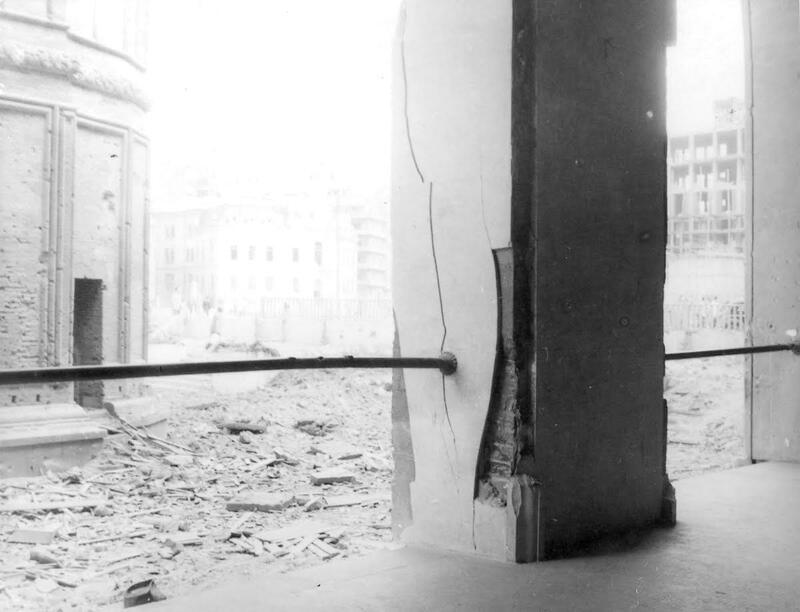 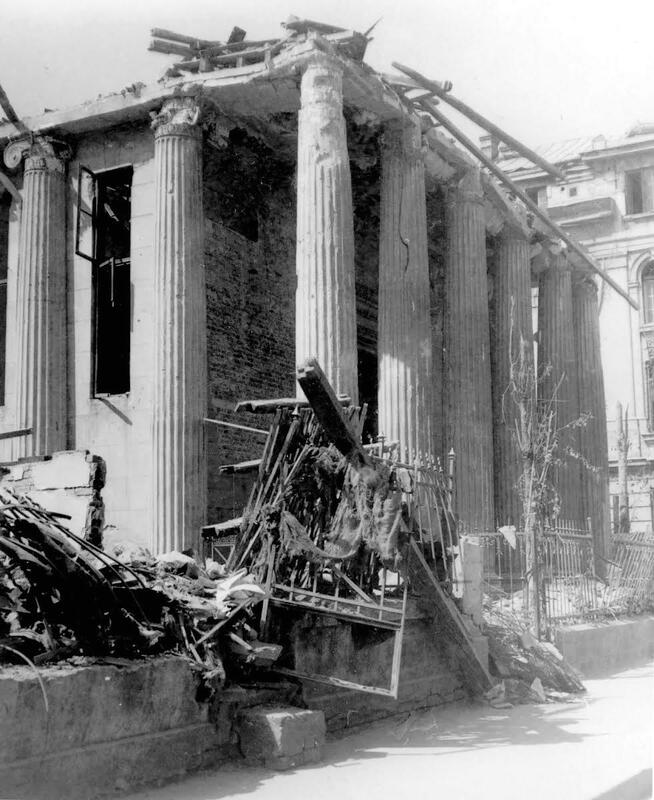 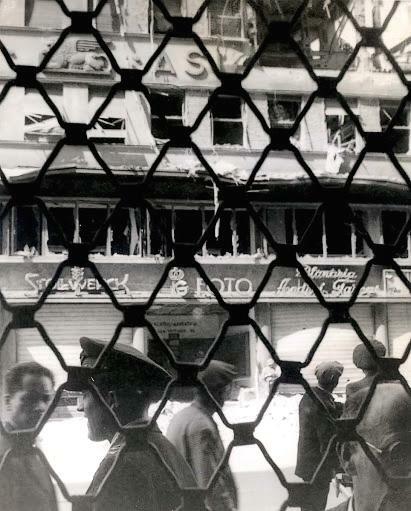 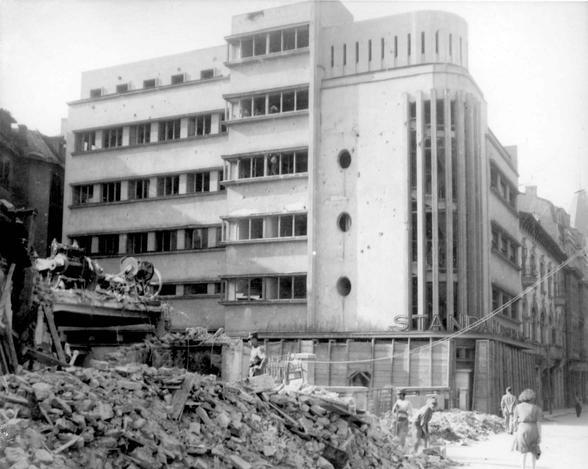 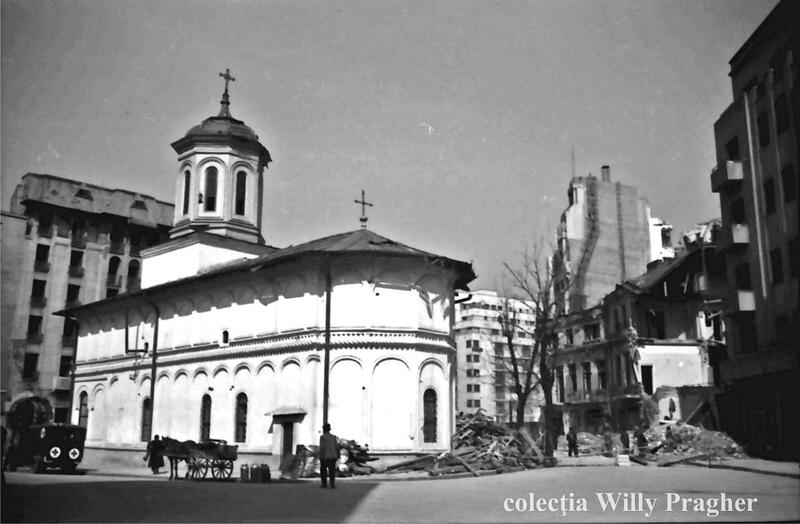 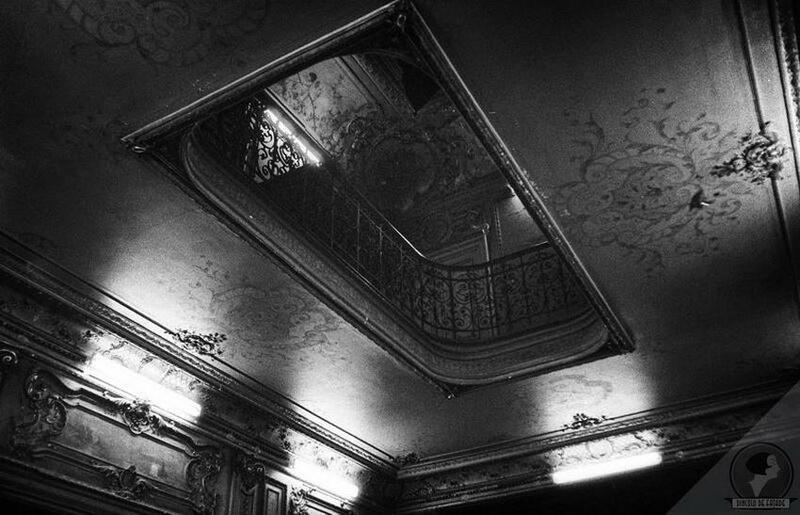 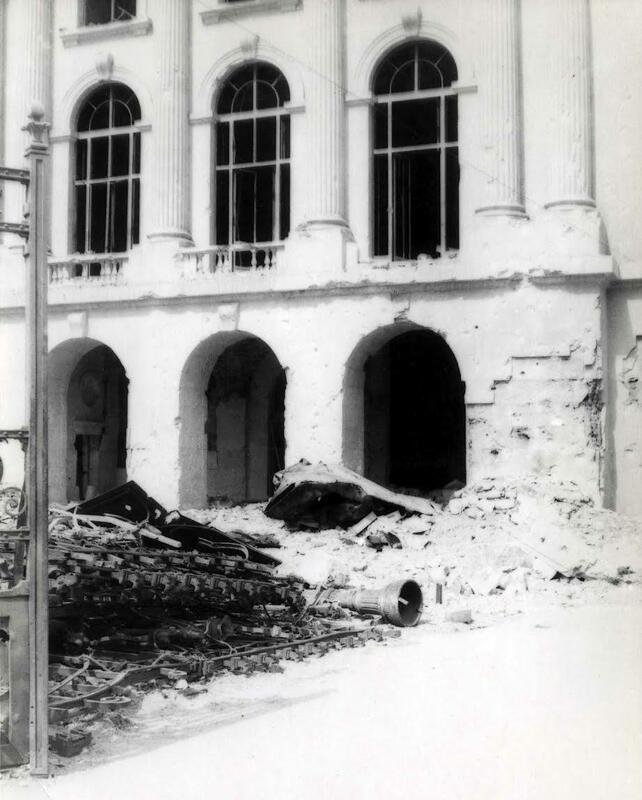 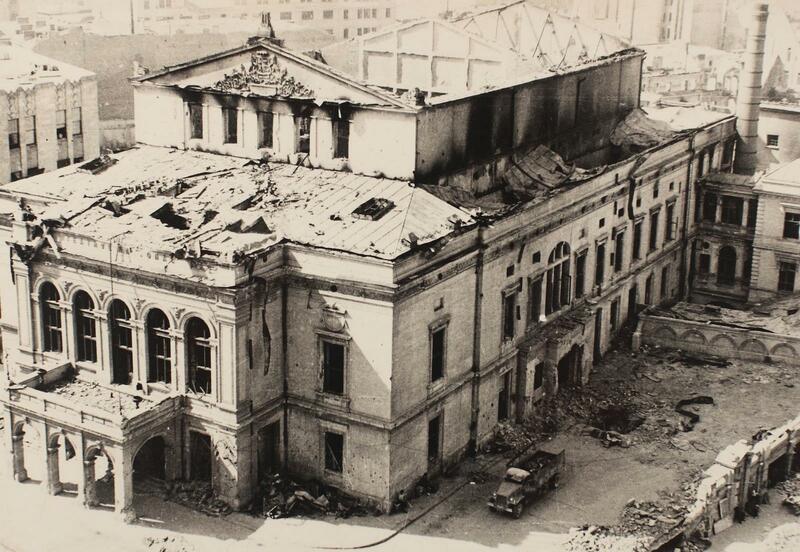 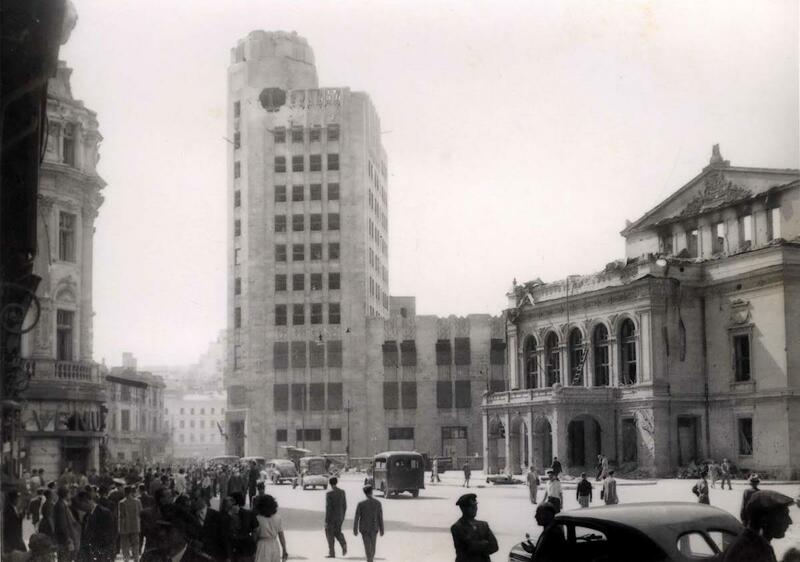 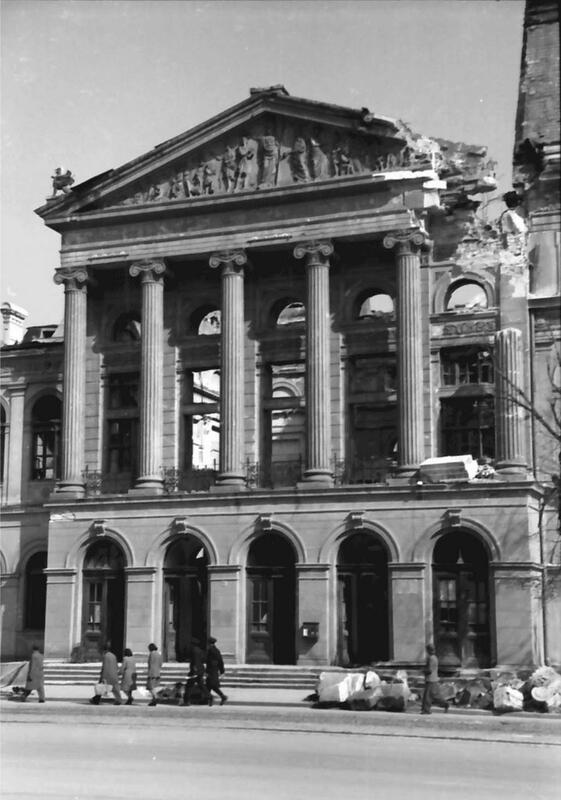 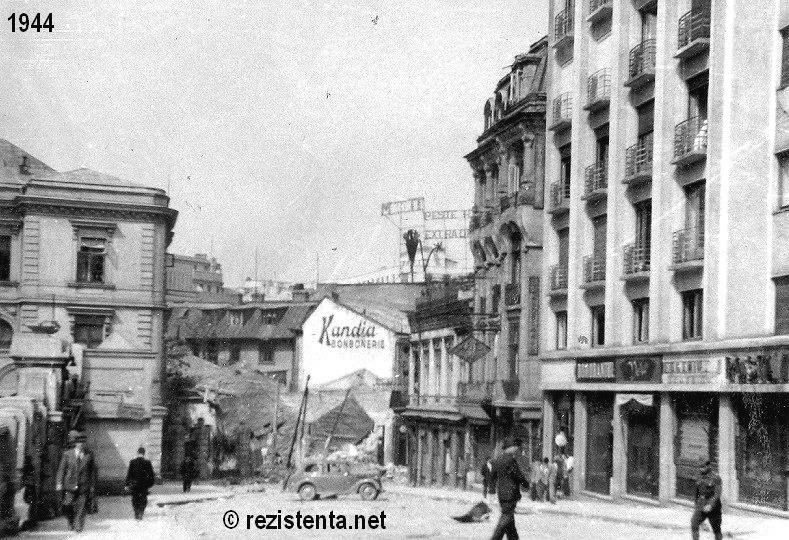 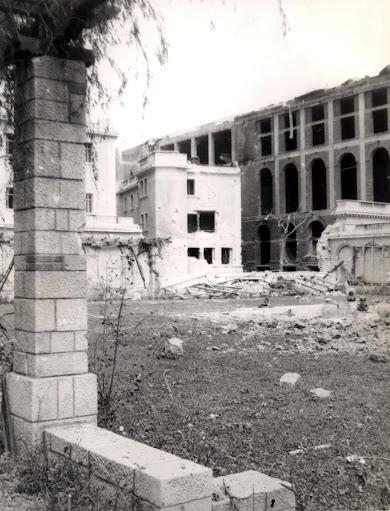 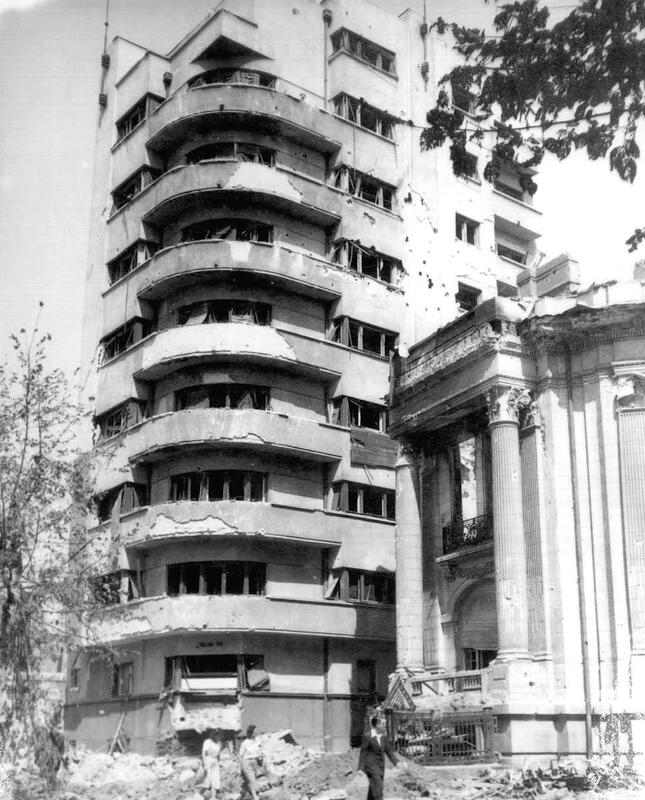 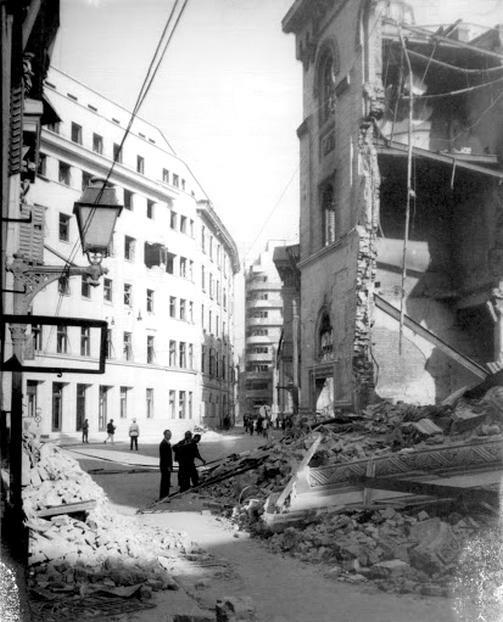 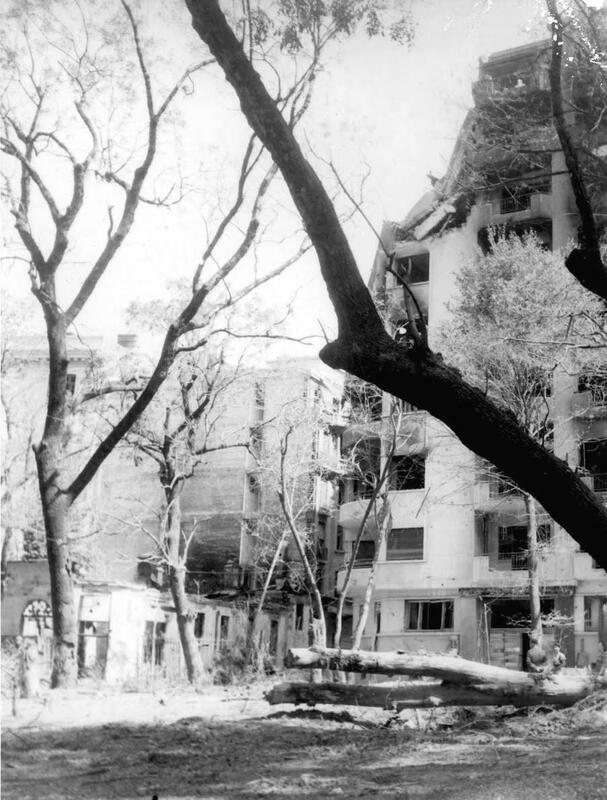 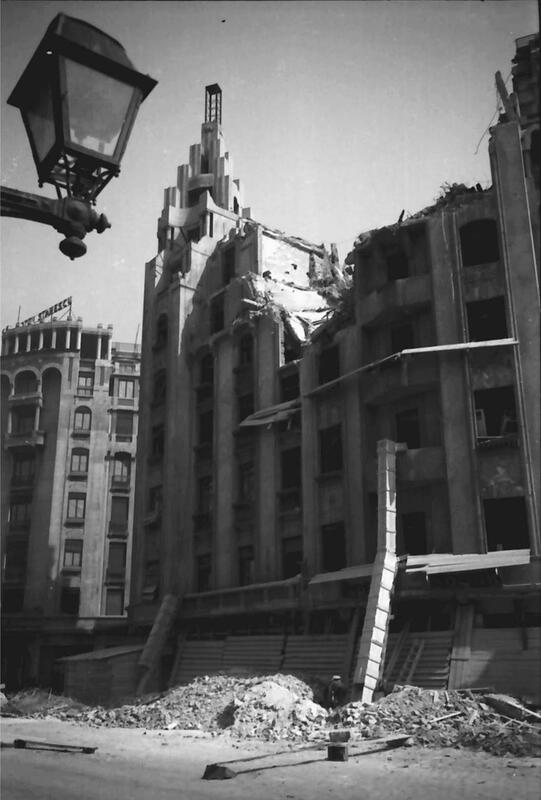 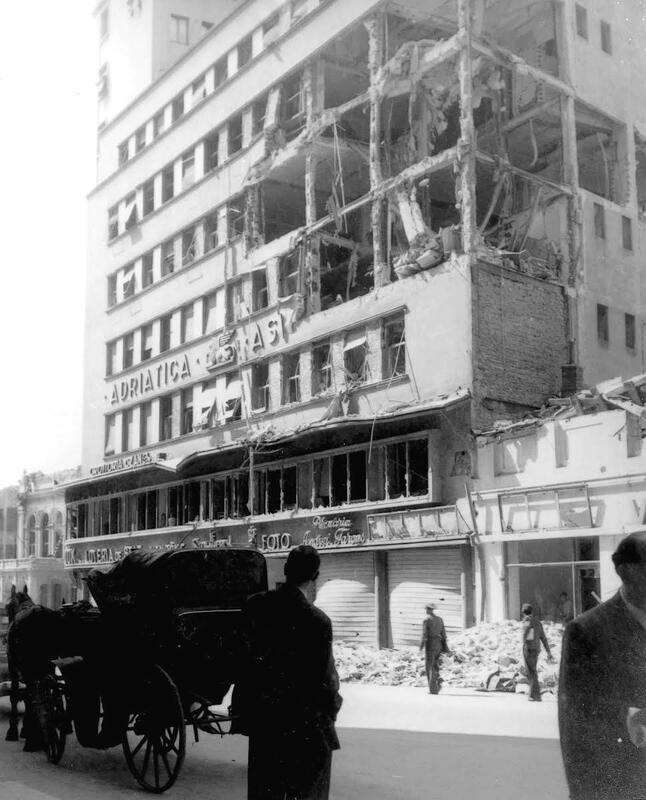 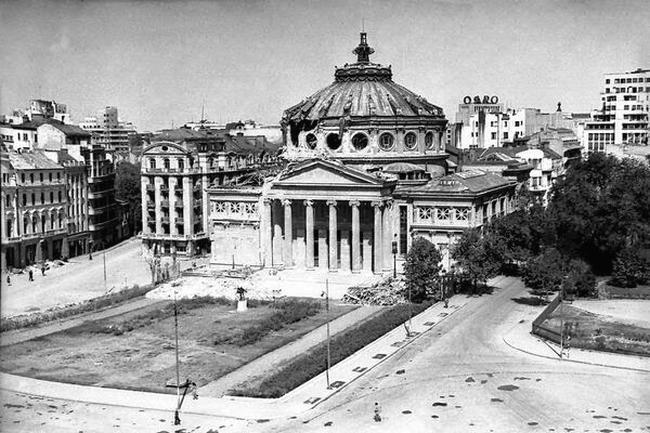 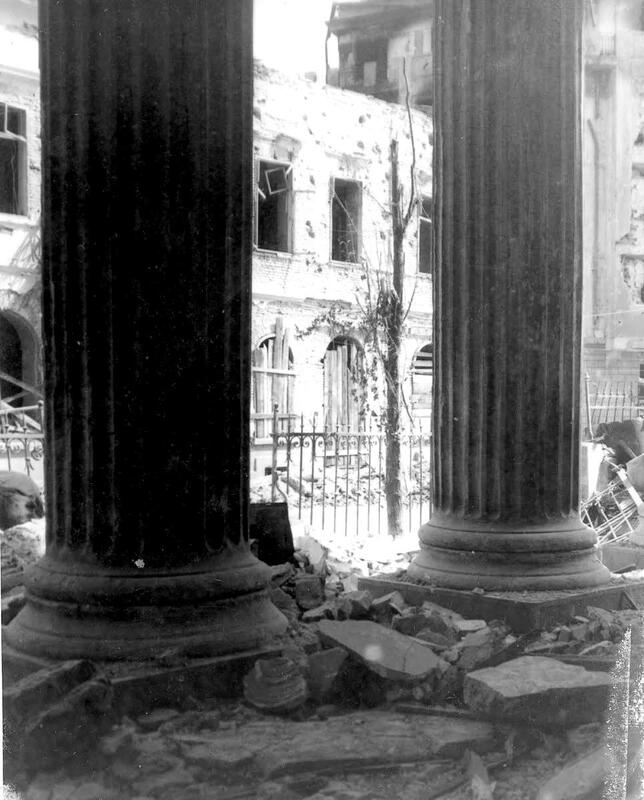 Though the building could be restored (according to an expertise made after the bombing), the communists razed it to the ground. 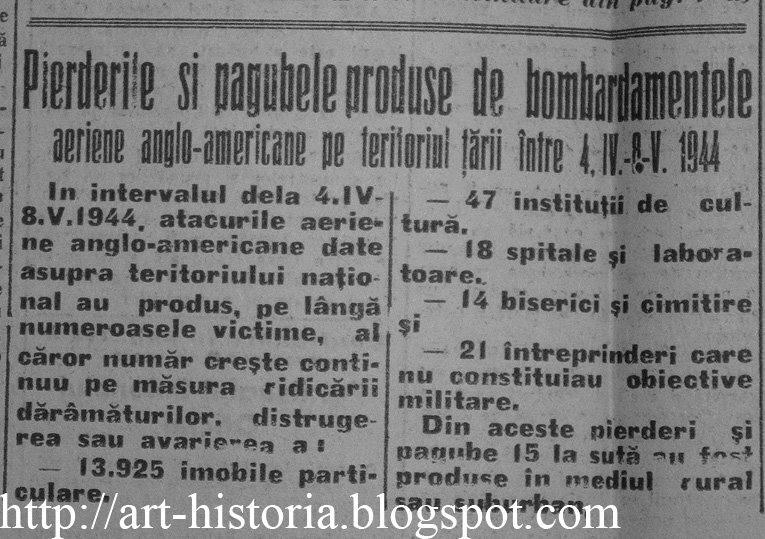 American news report after August 1944. 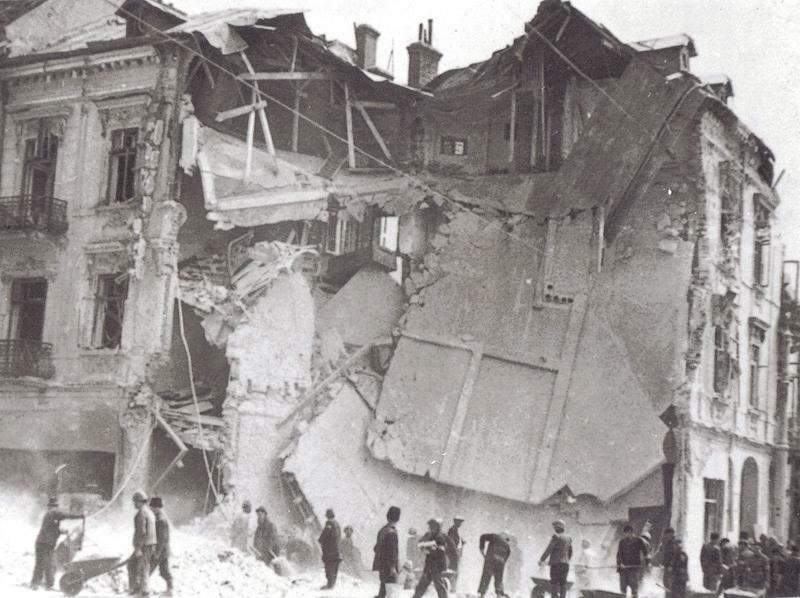 It magnifies German aerial attacks but no mention of the victims and the destruction caused by the Allied bombing. 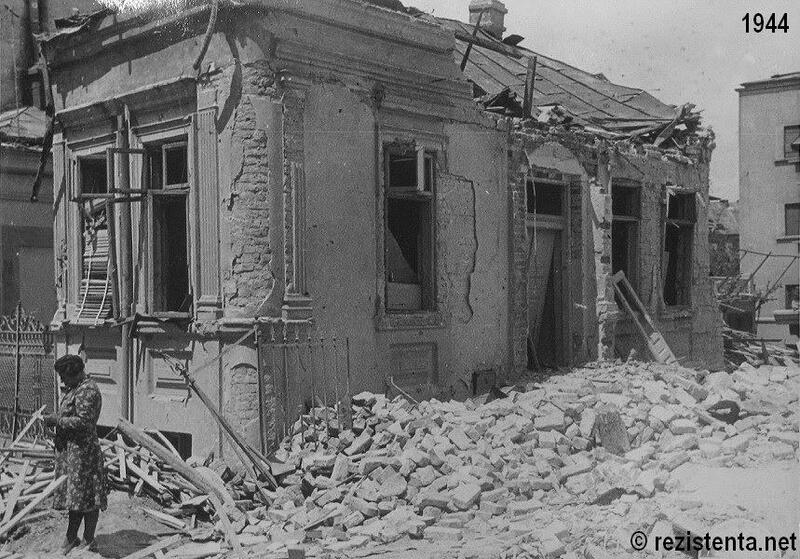 The following document – SECRET july ’44- (PDF format) details the missions across “enemy positions” including Romania. 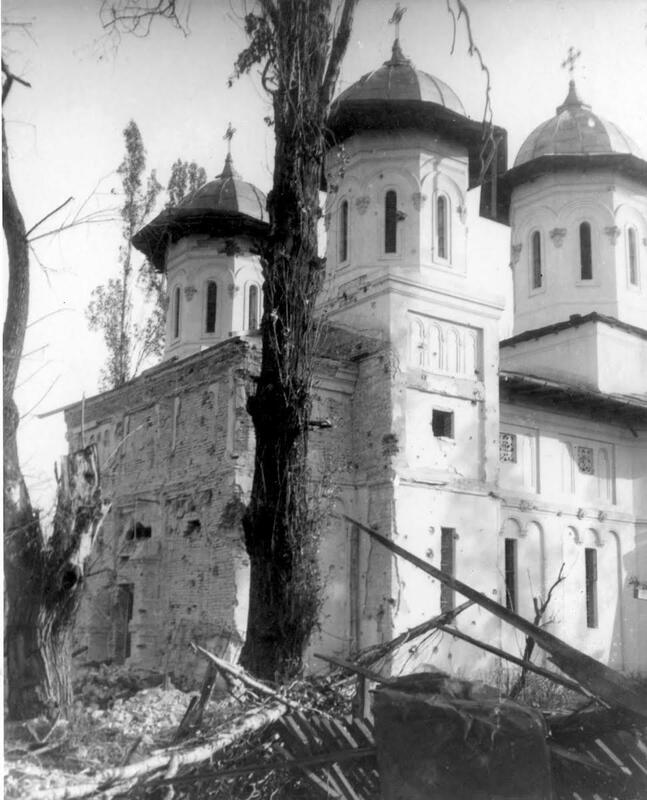 It also mentions the fighter planes that were taken down by Romanian pilots. 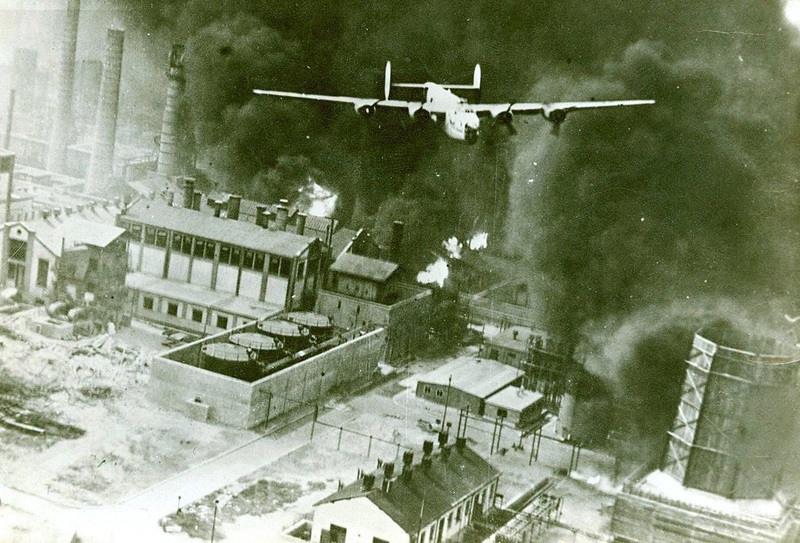 The pilots were awarded with the “Distinguished flying cross” and other medals. 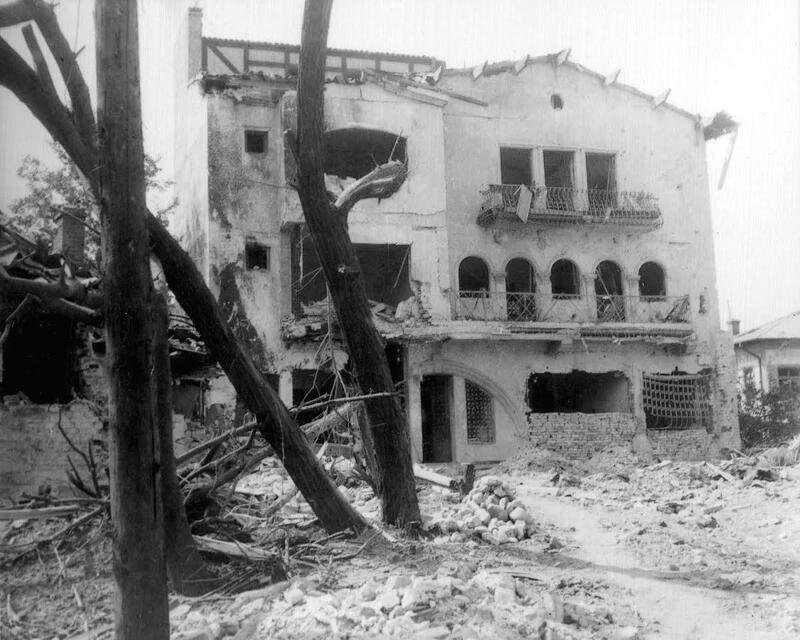 German commander Killinger suicide. 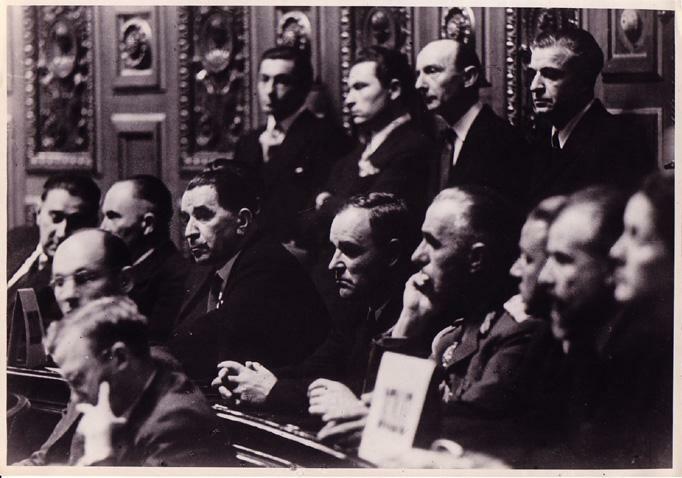 His secretary Hella Petersen, with whom he had a relationship, died with him (though the term murder is questionable). 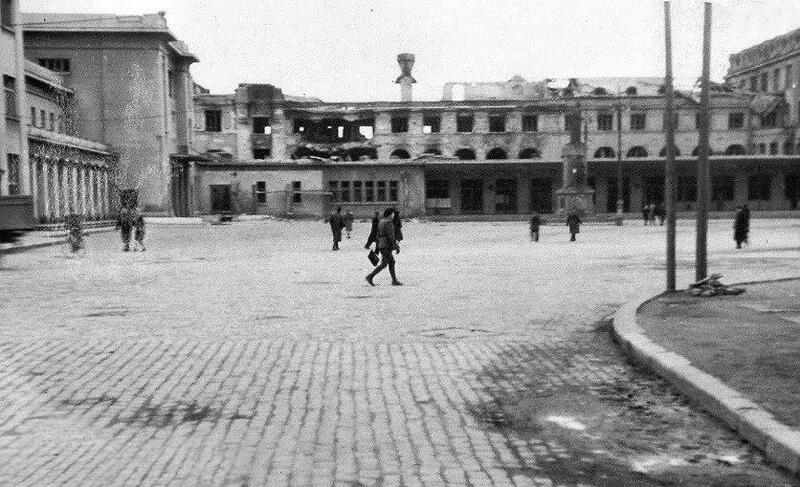 Suicide was a common option for Nazi officers, who were resentful of surrendering to the enemy. 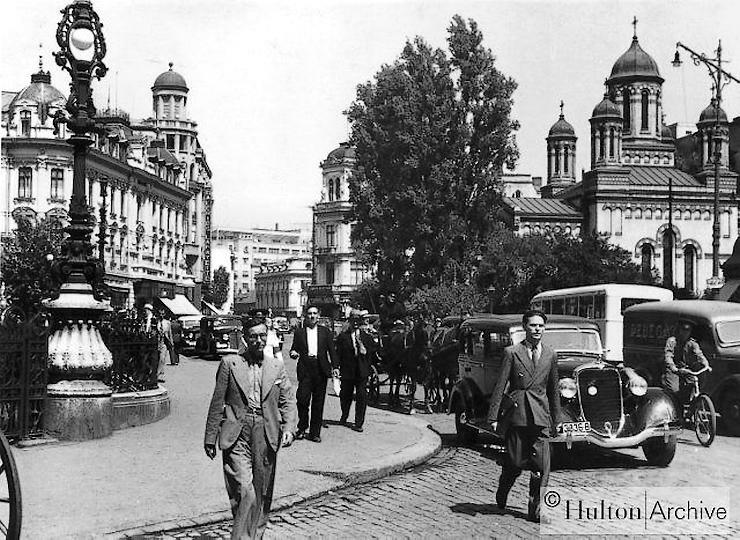 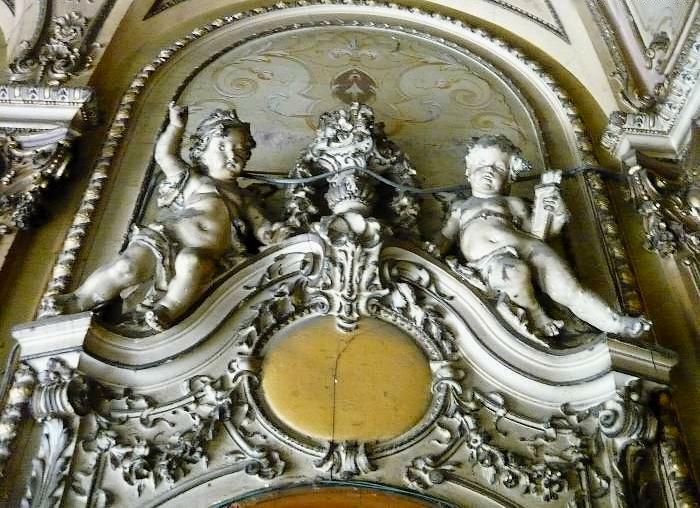 Distorsion – the “masters” of Bucharest were never considered nor they acted like it, as they were an ally not an occupying force. 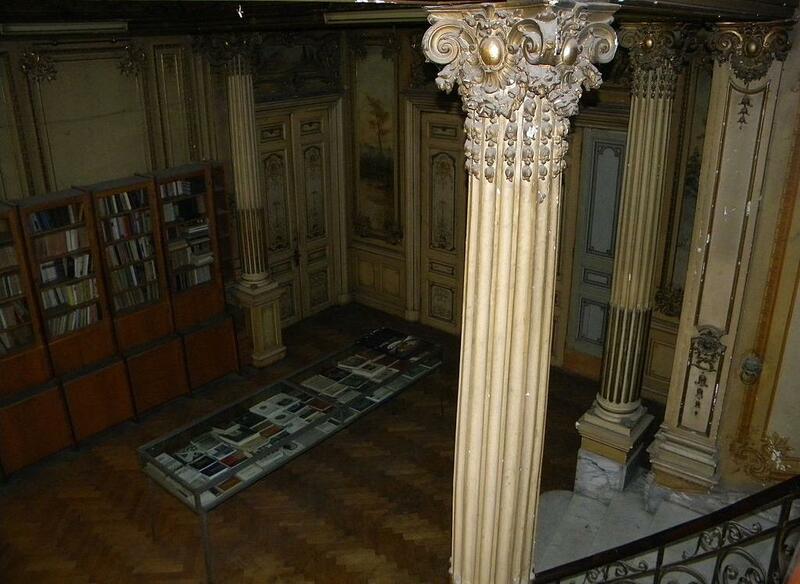 Today, a monument stands in Cismigiu park in the center of Bucharest, in the memory of the 378 American pilots who were taken down by Romanian planes. 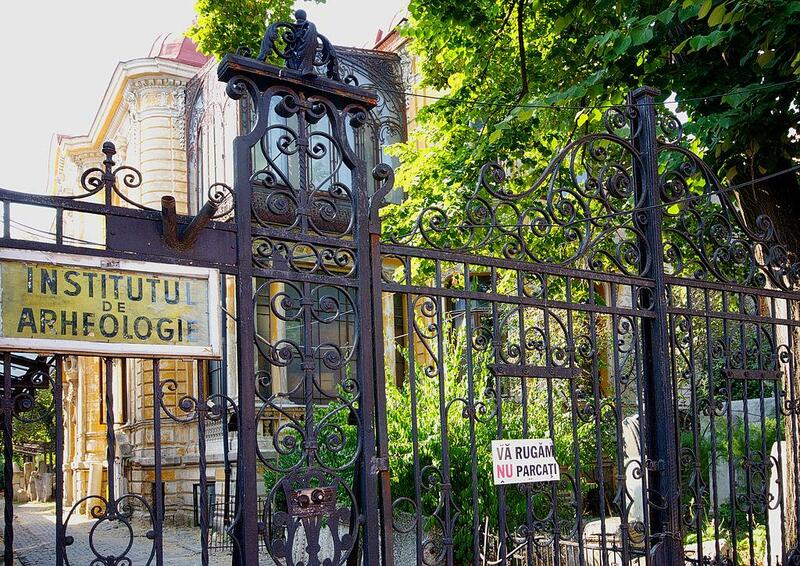 While the graves of the bombardment victims – the 4 aprilie cemetery – lays forgotten in the city outskirts, covered by weeds and the dust of time, so it doesnt bother the political sensitivities of our time. 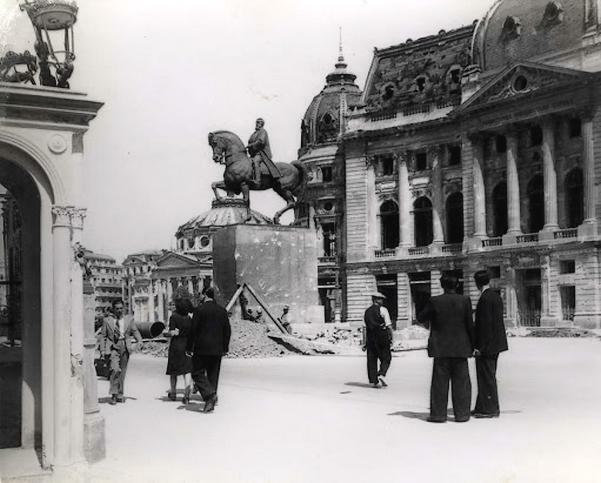 The monument states “for the American pilots who died for the liberation of Europe and for the glory of the United States”. 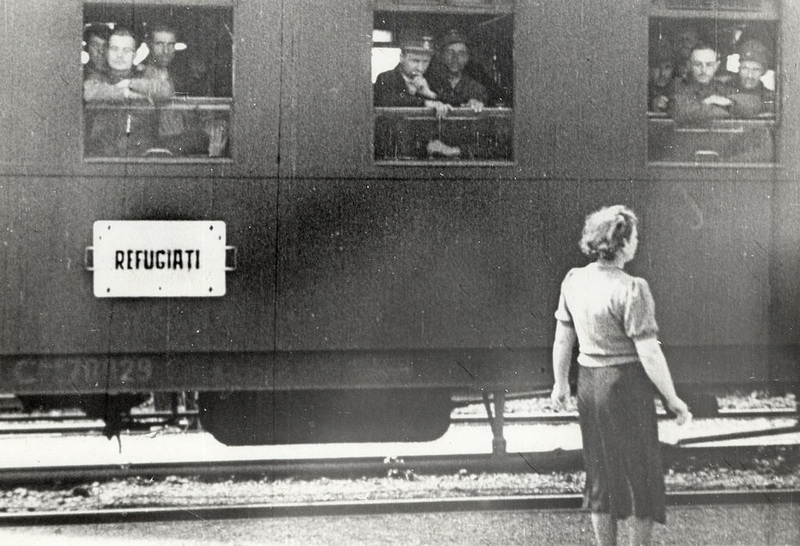 A sentence at which we can only look at with bitterness, as liberation was not what awaited Romania and half of Europe for the next 50 years. 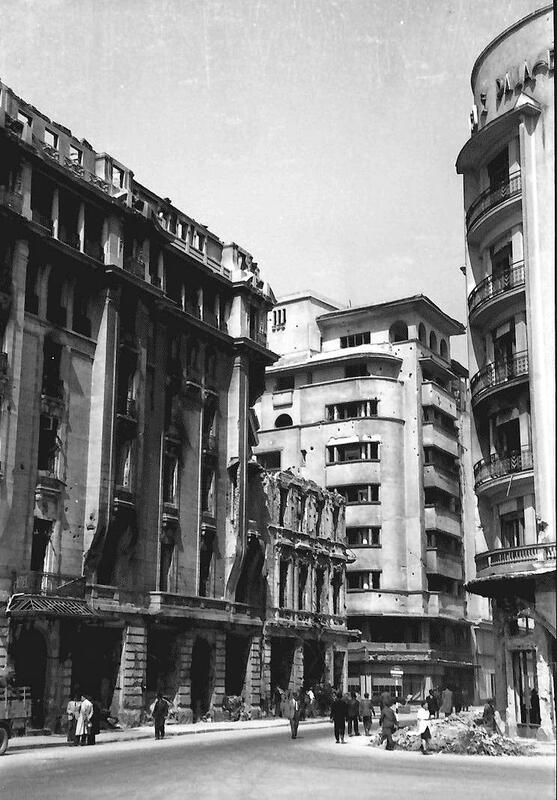 As the U.S. had force-opened Romania’s gates to communism.